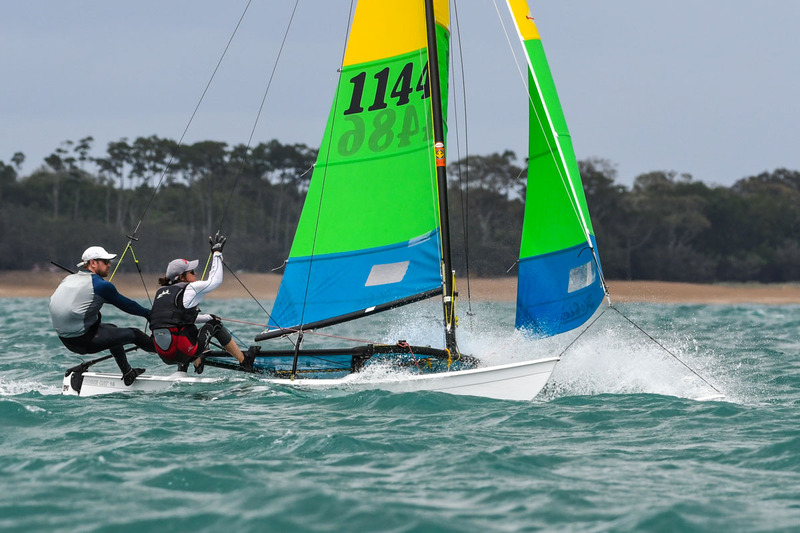 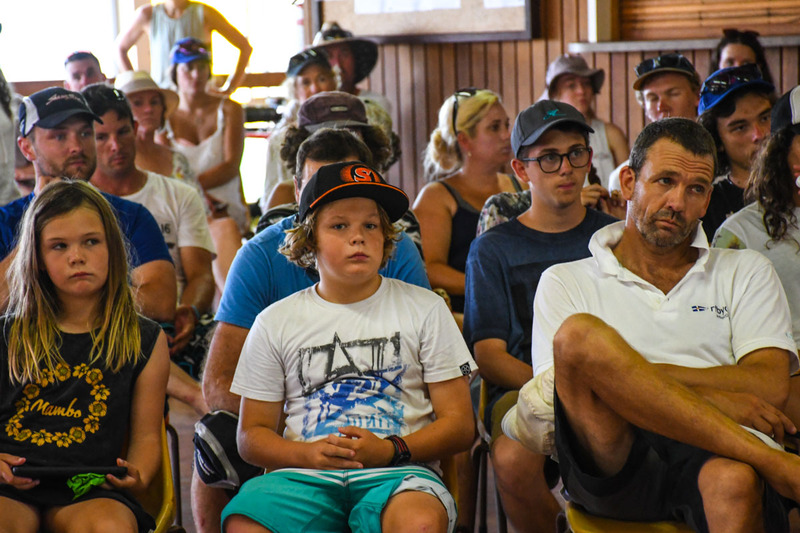 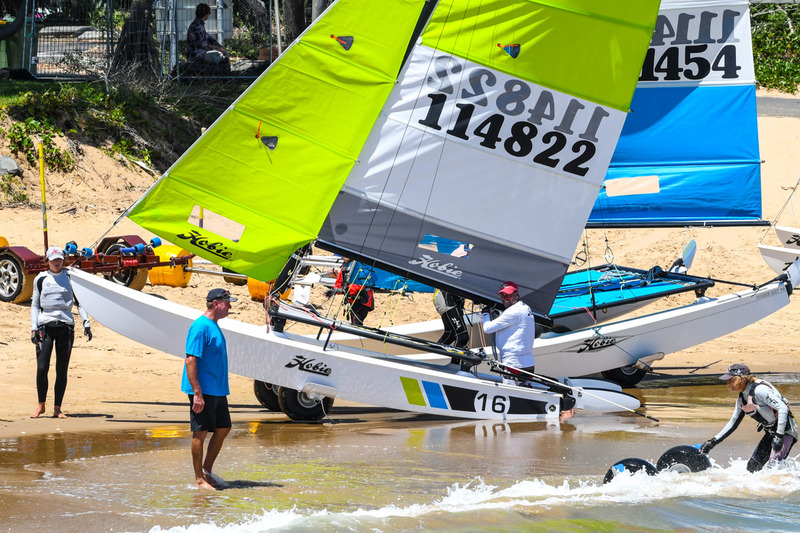 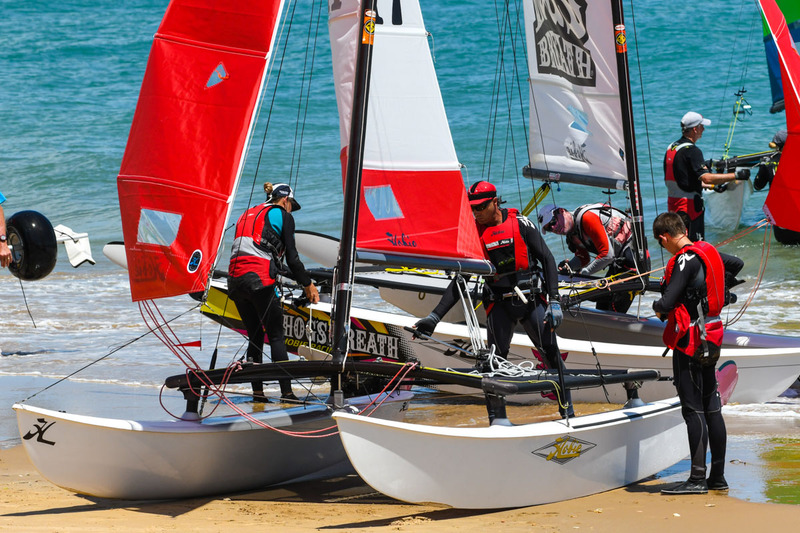 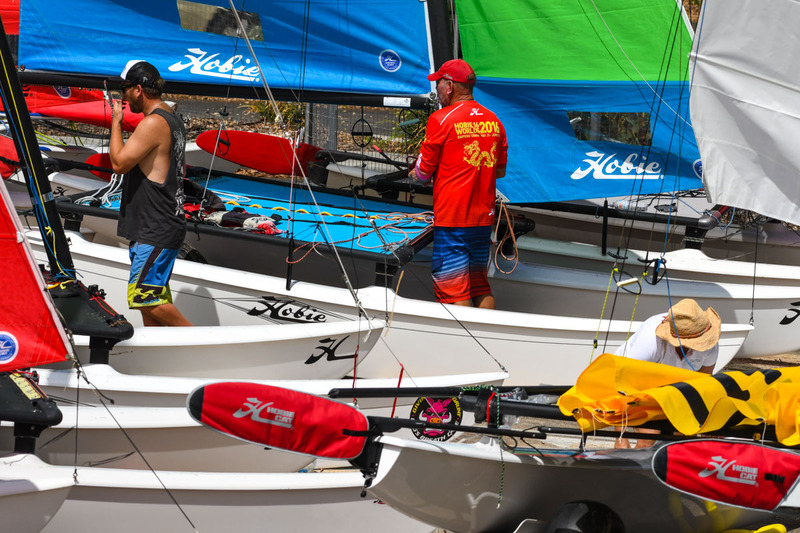 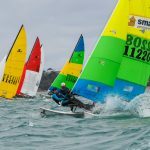 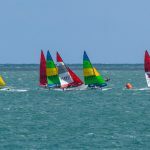 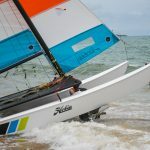 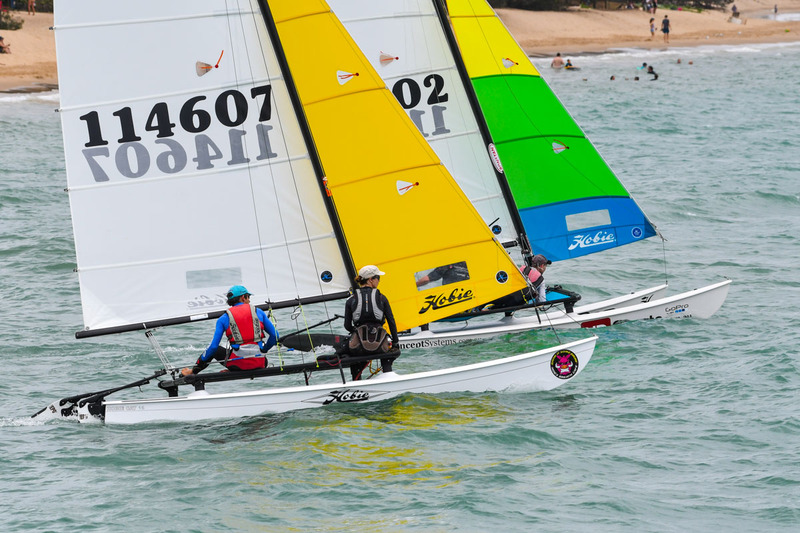 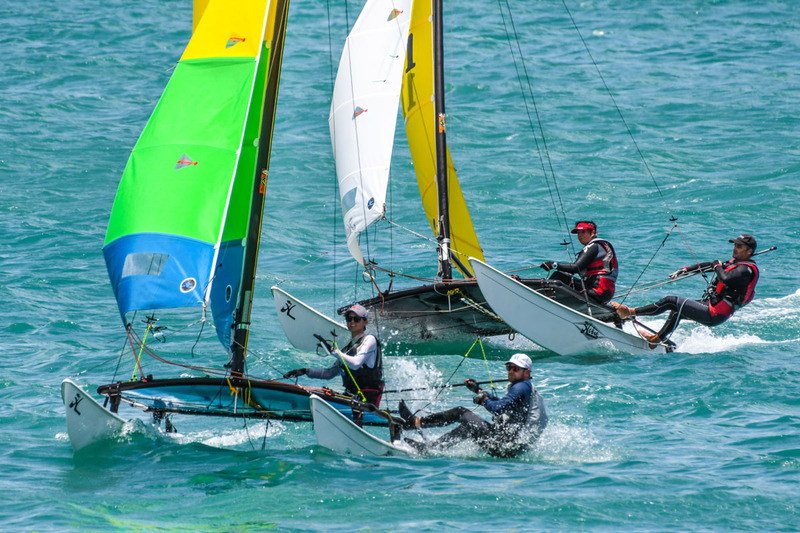 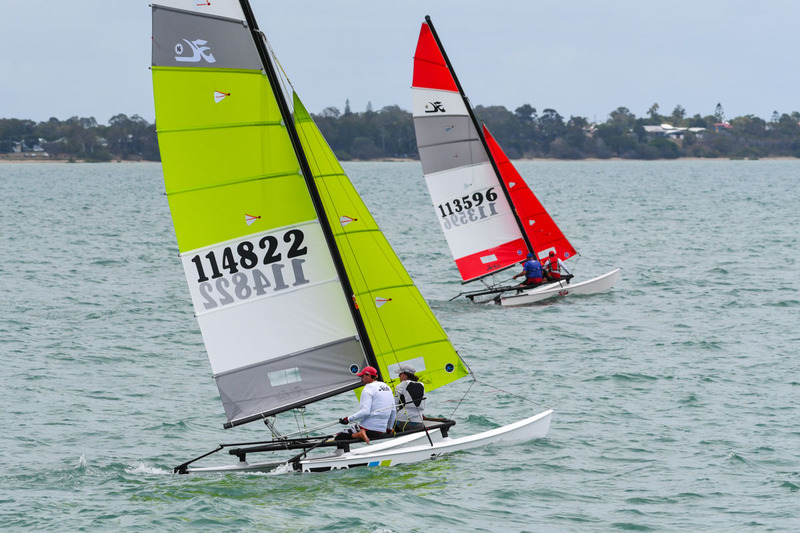 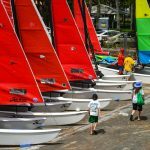 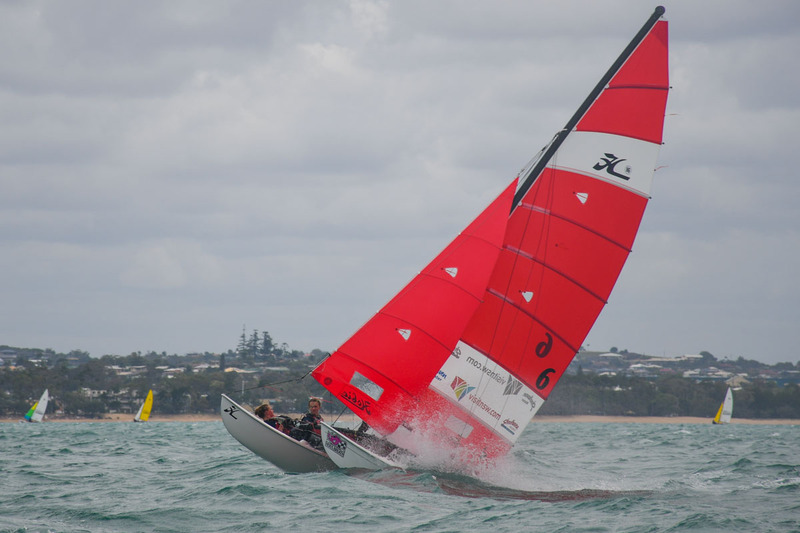 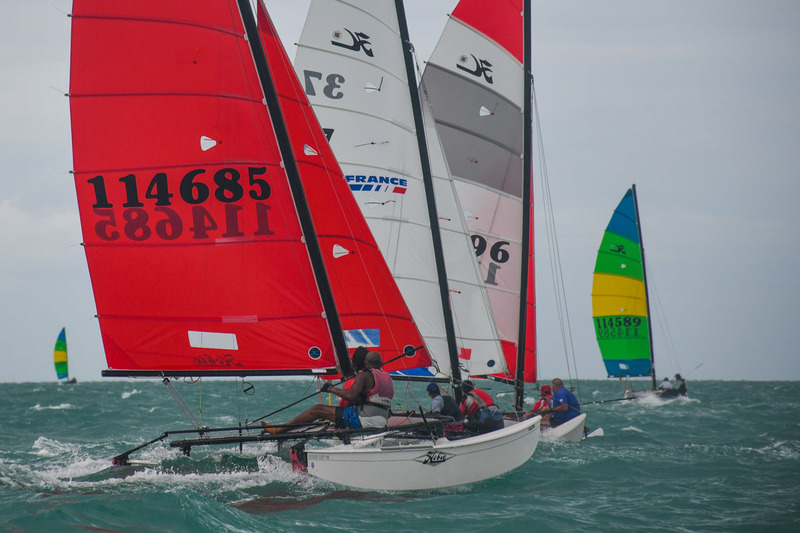 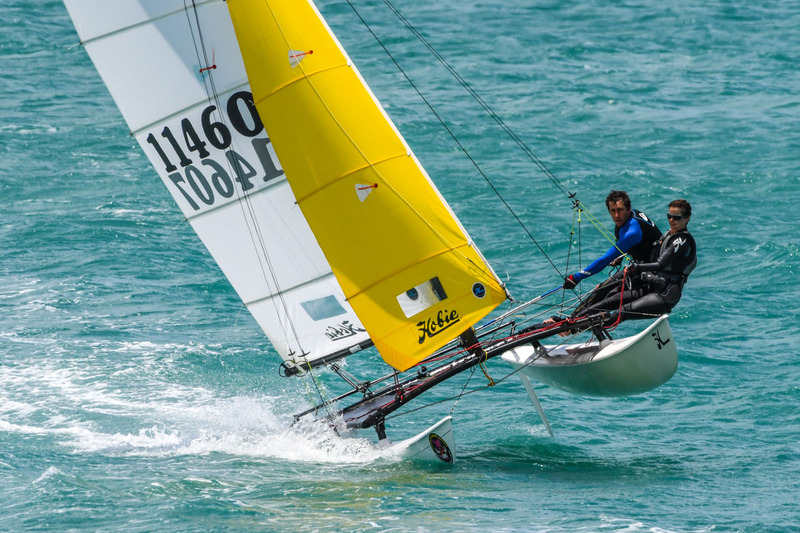 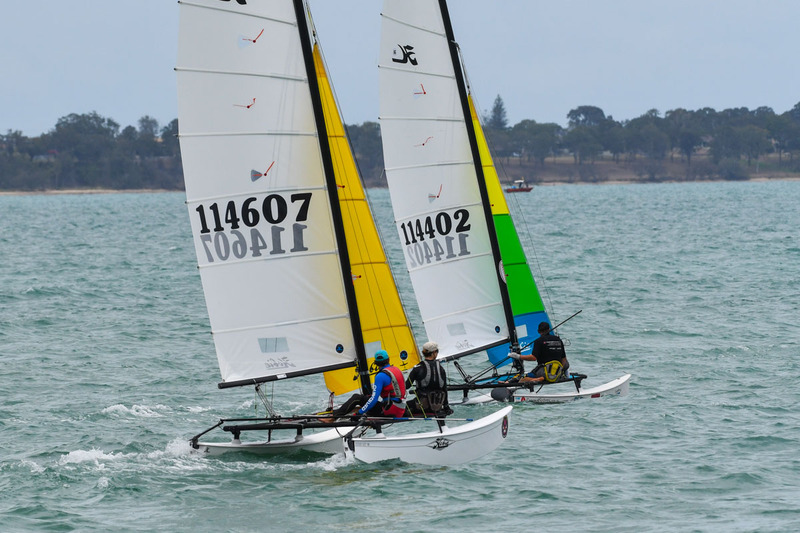 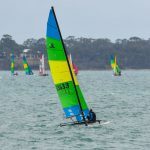 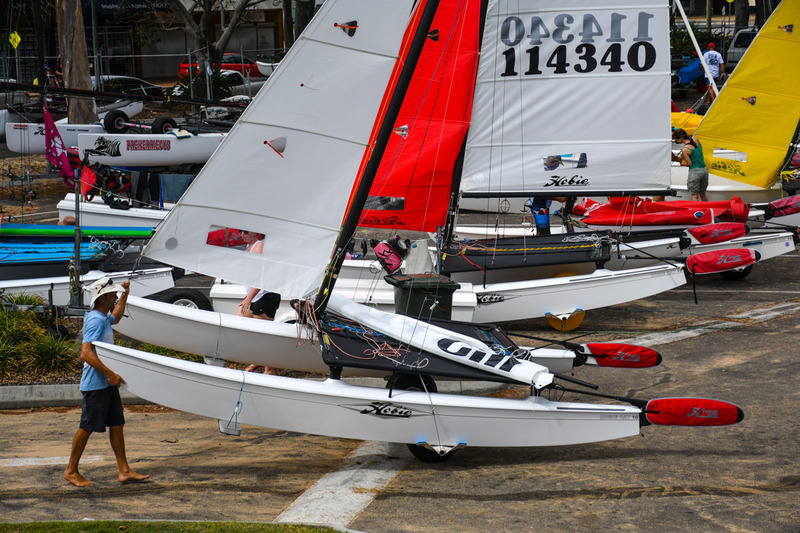 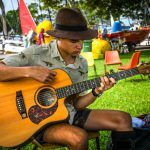 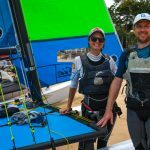 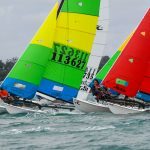 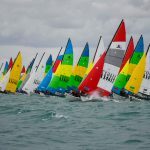 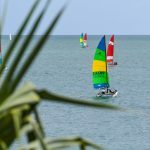 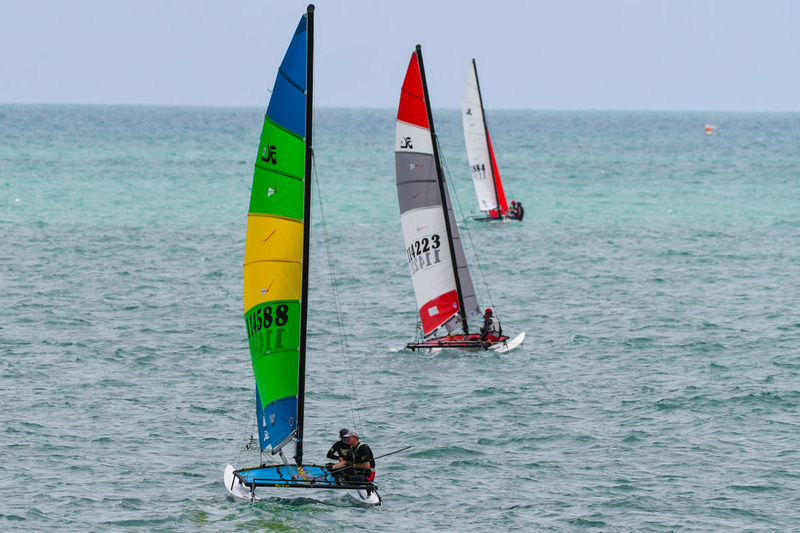 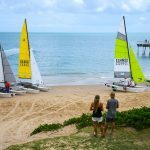 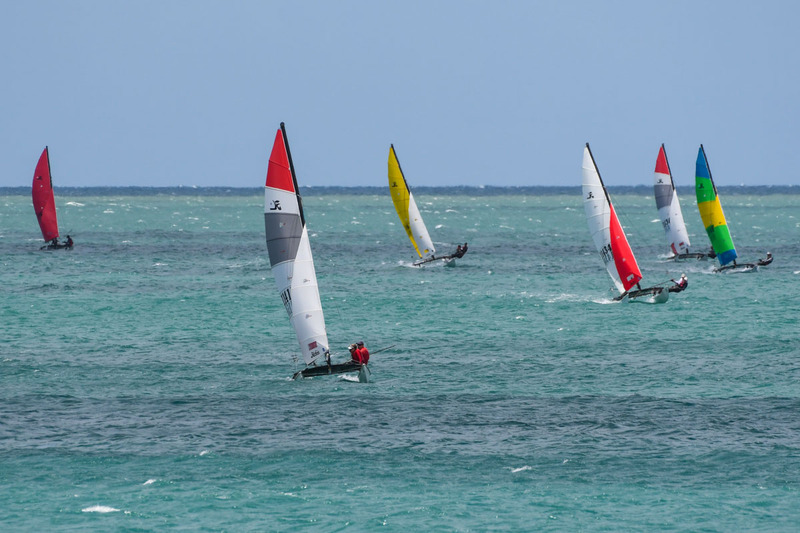 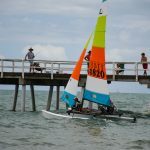 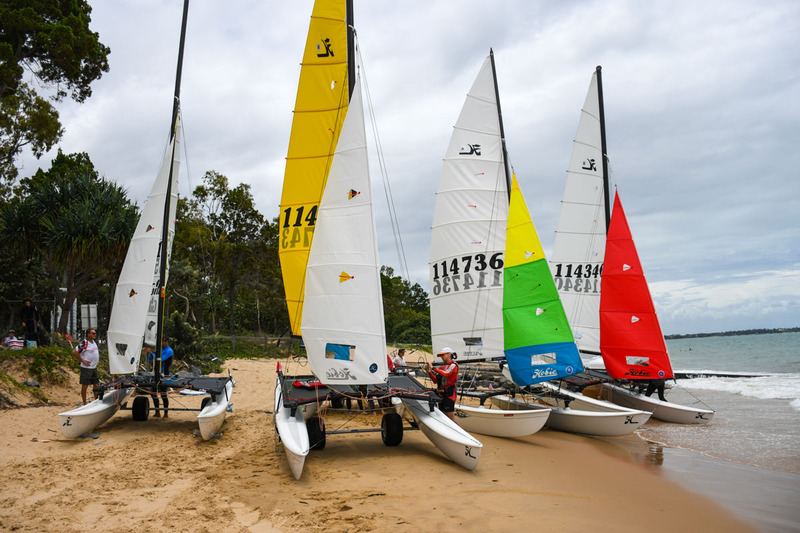 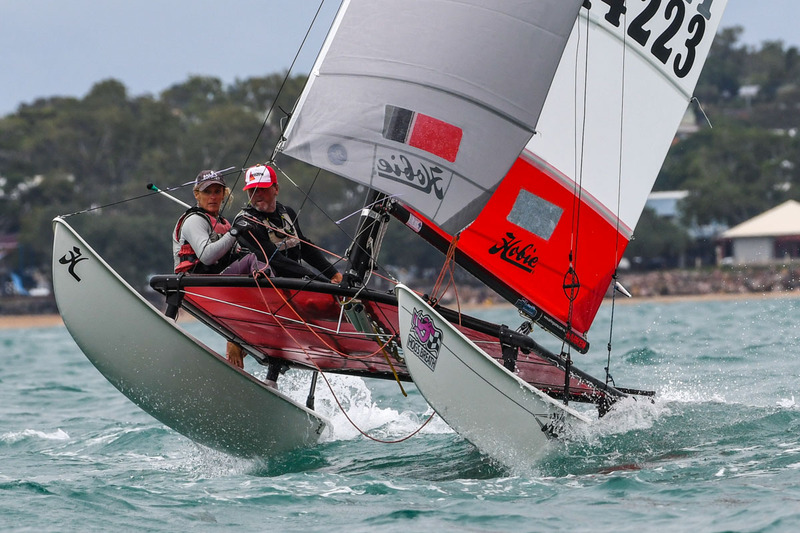 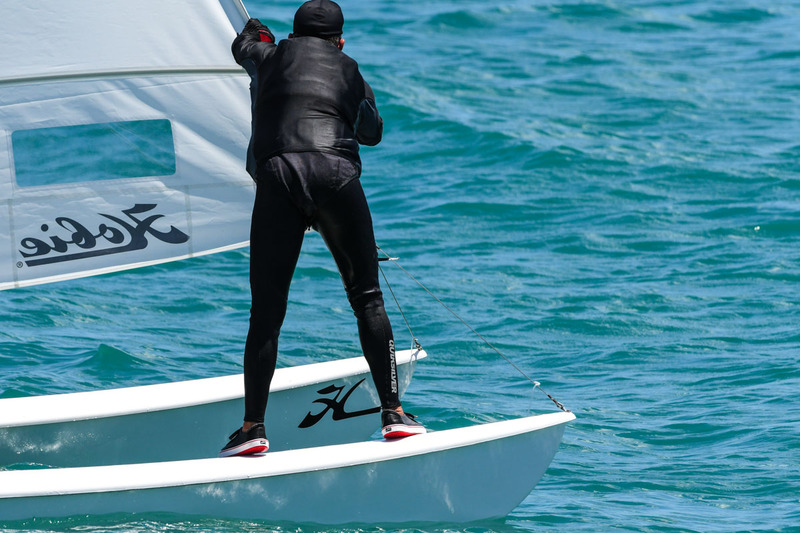 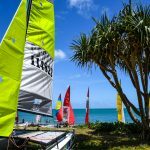 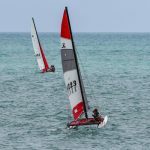 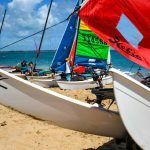 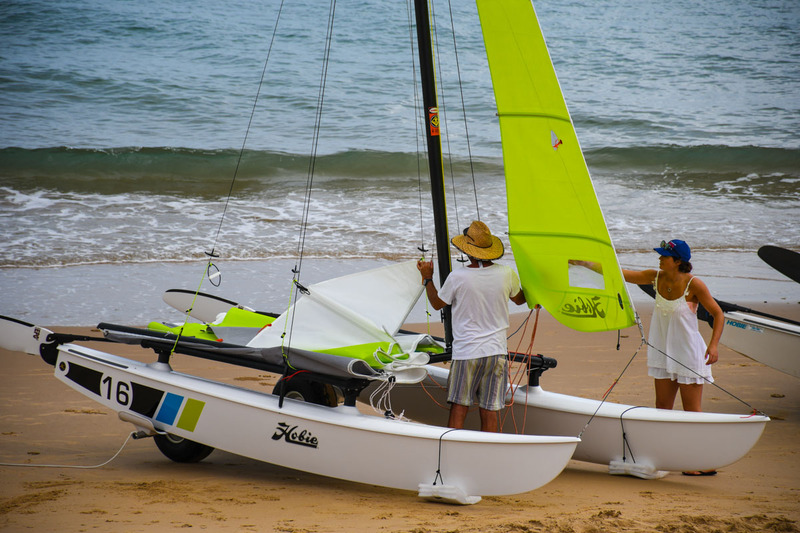 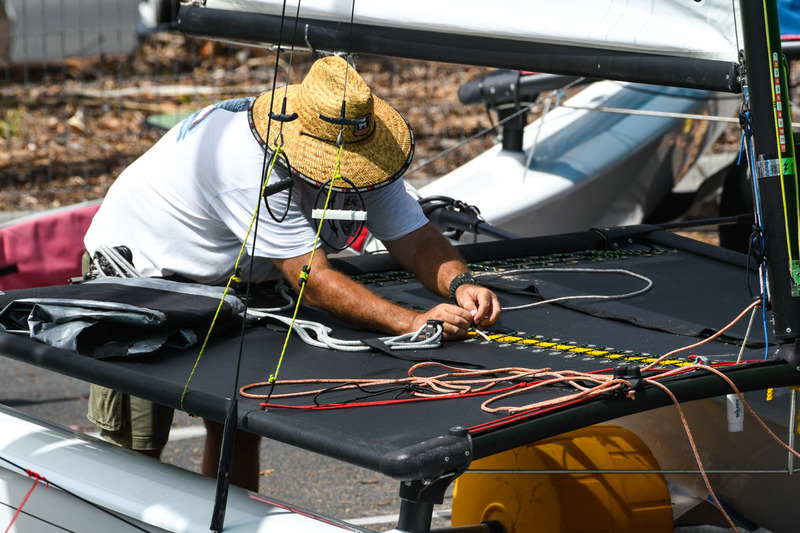 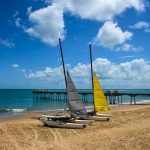 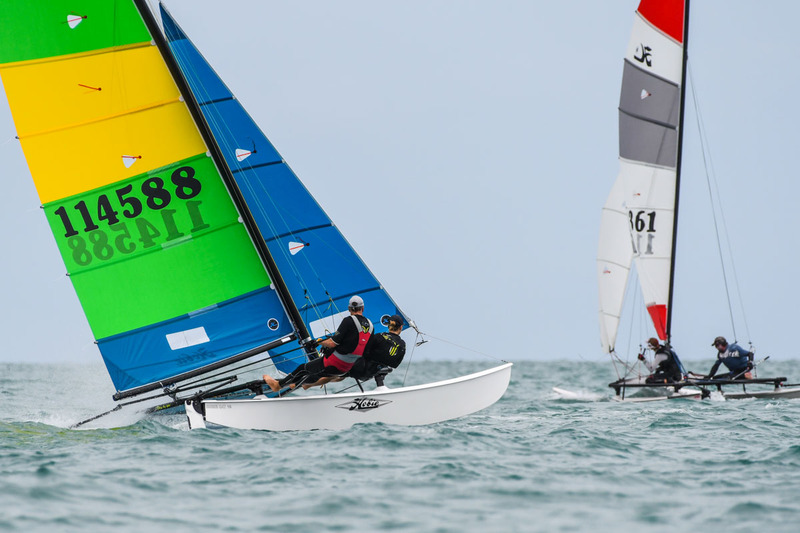 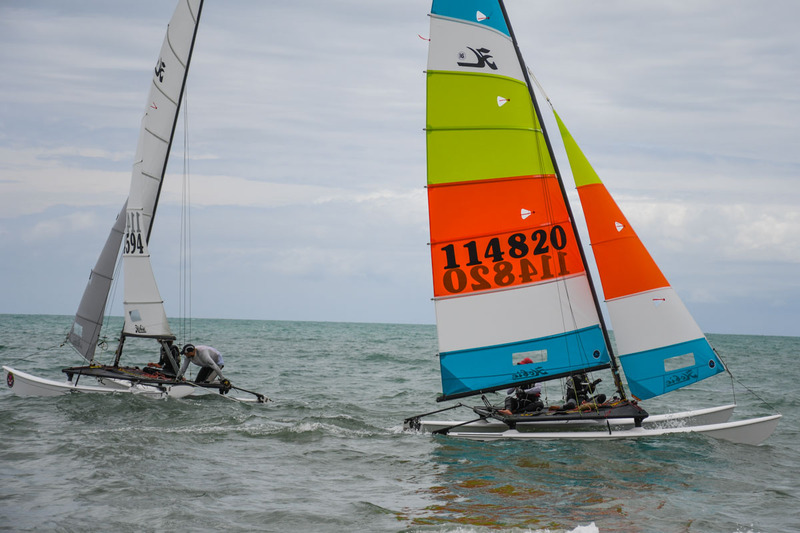 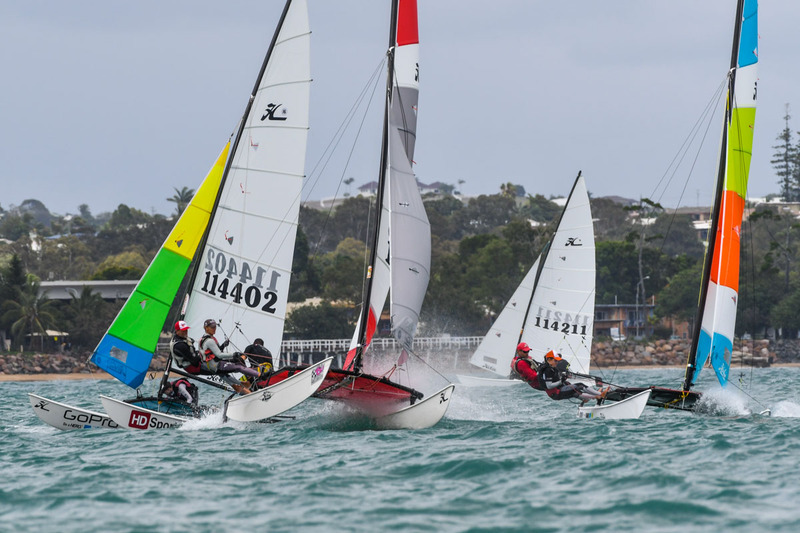 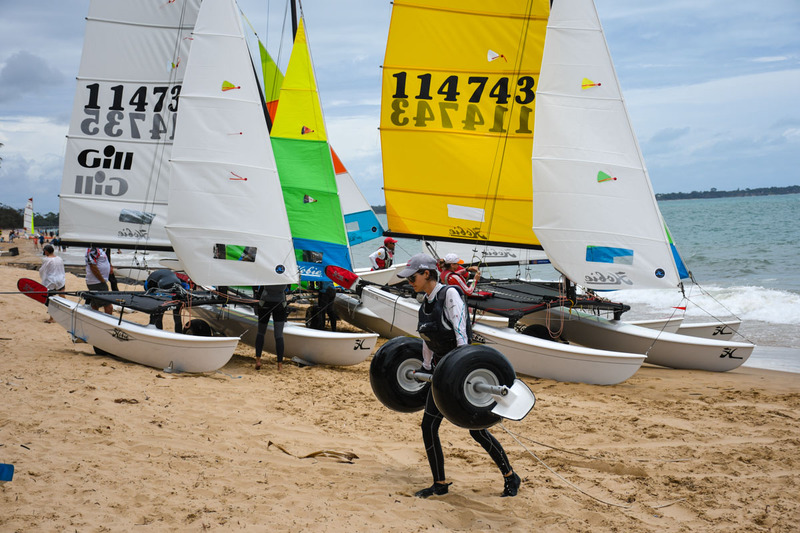 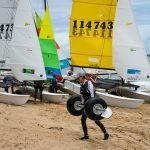 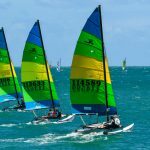 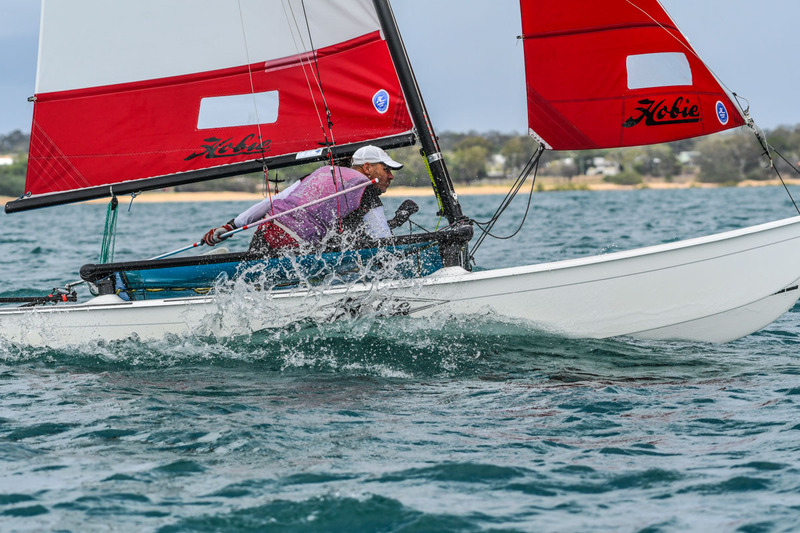 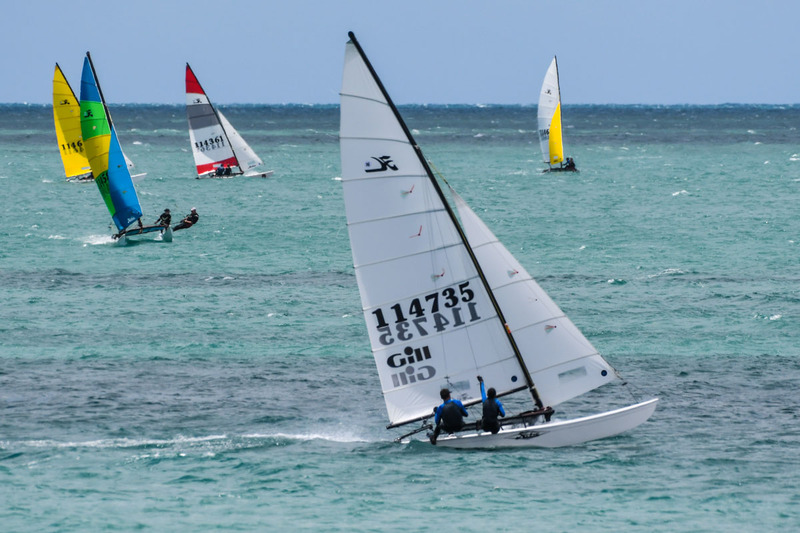 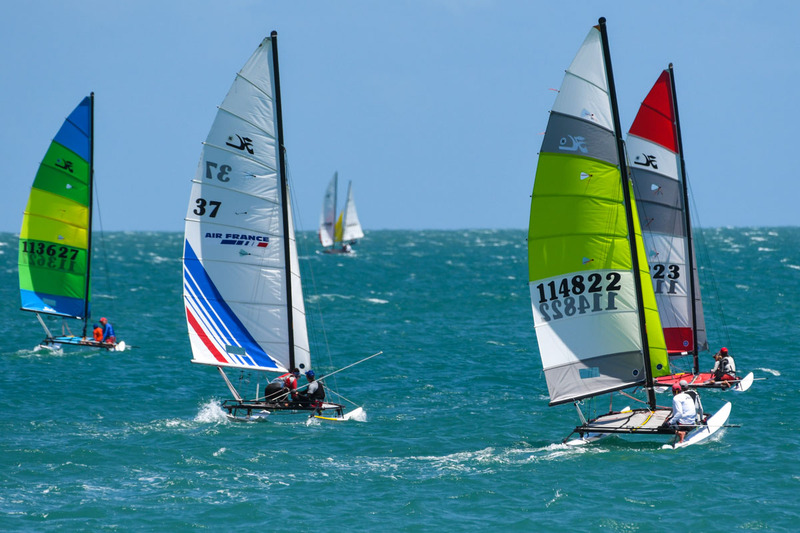 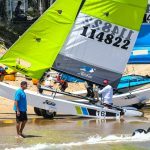 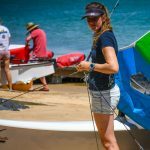 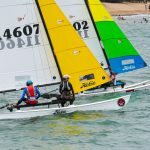 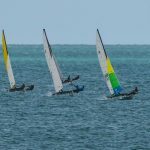 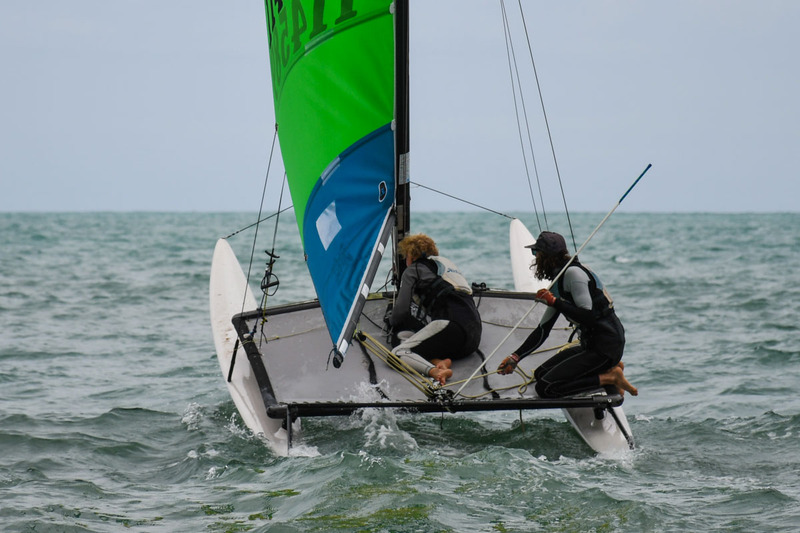 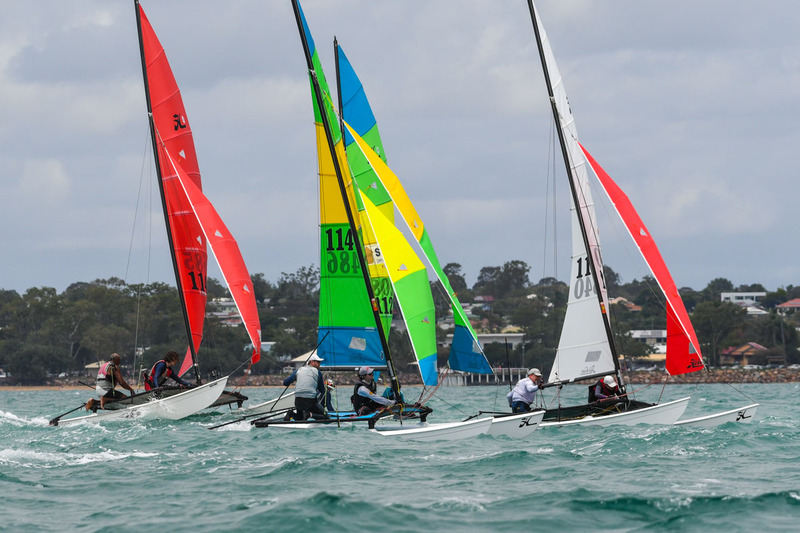 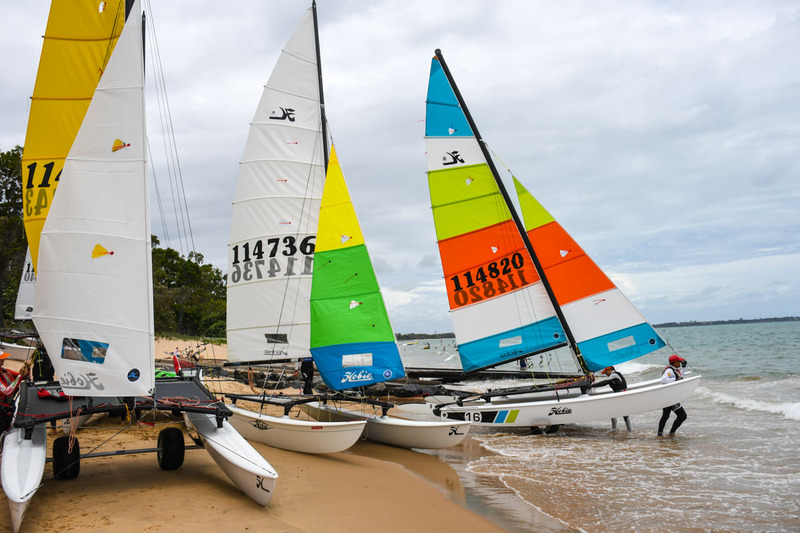 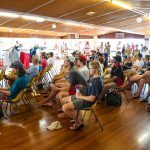 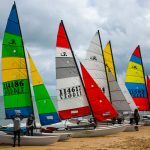 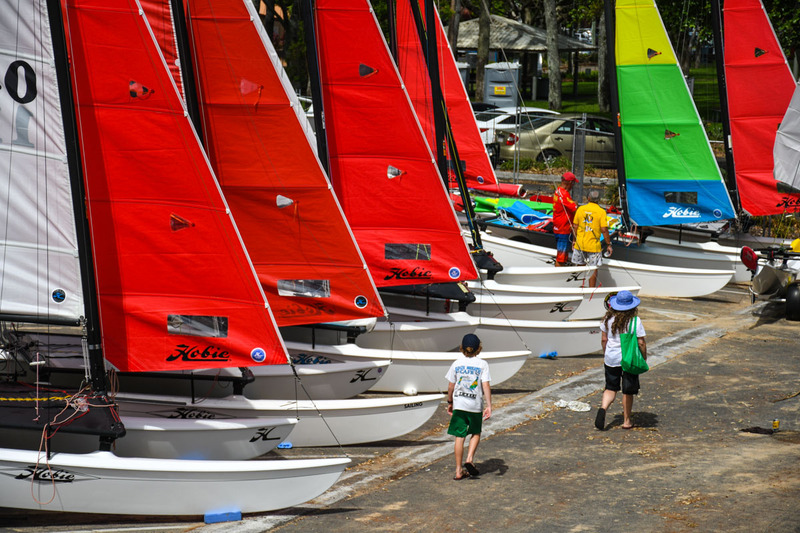 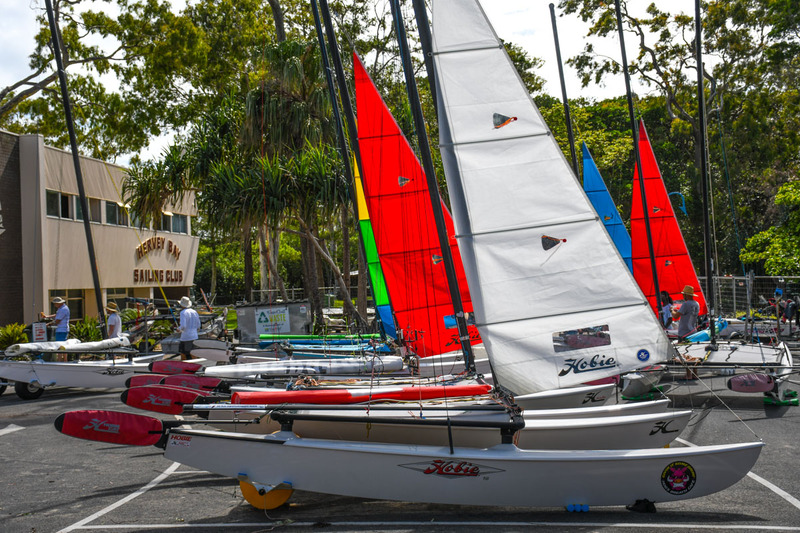 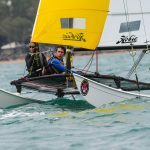 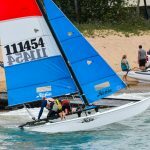 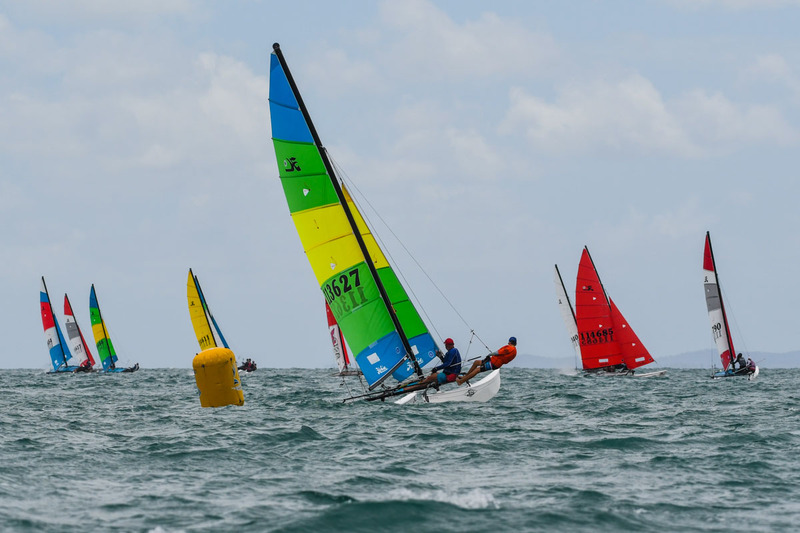 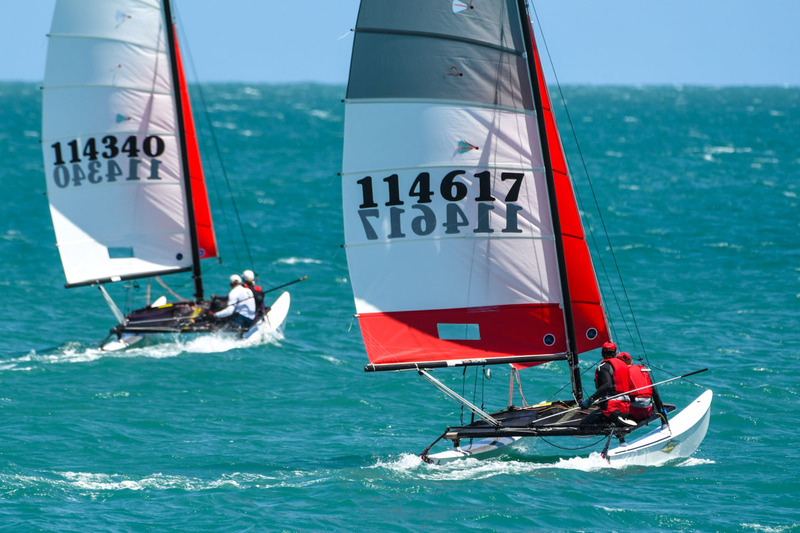 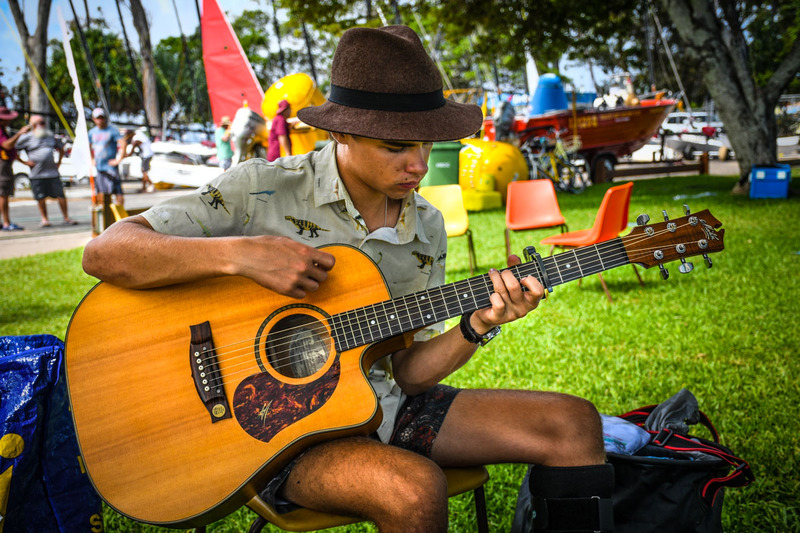 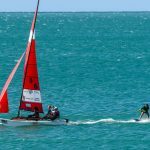 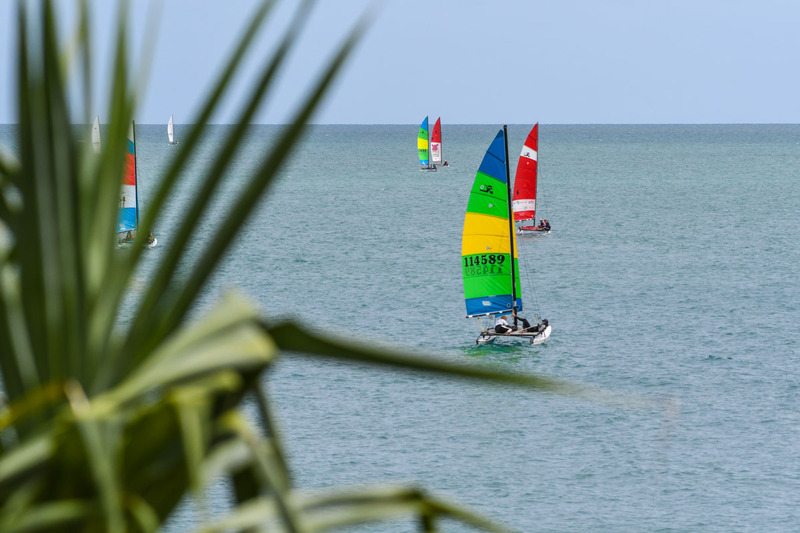 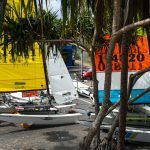 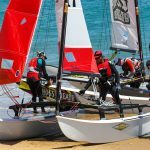 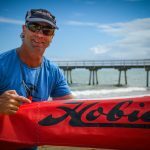 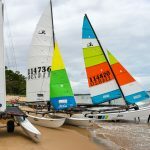 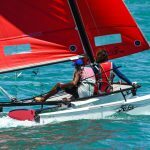 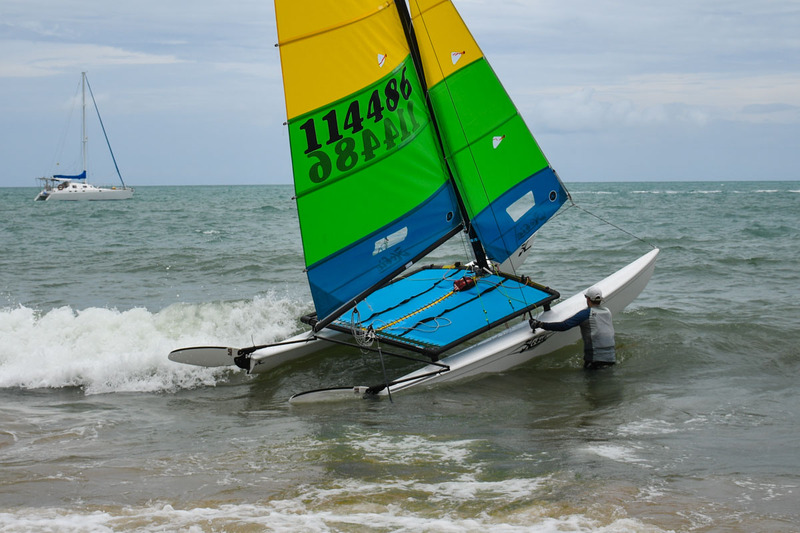 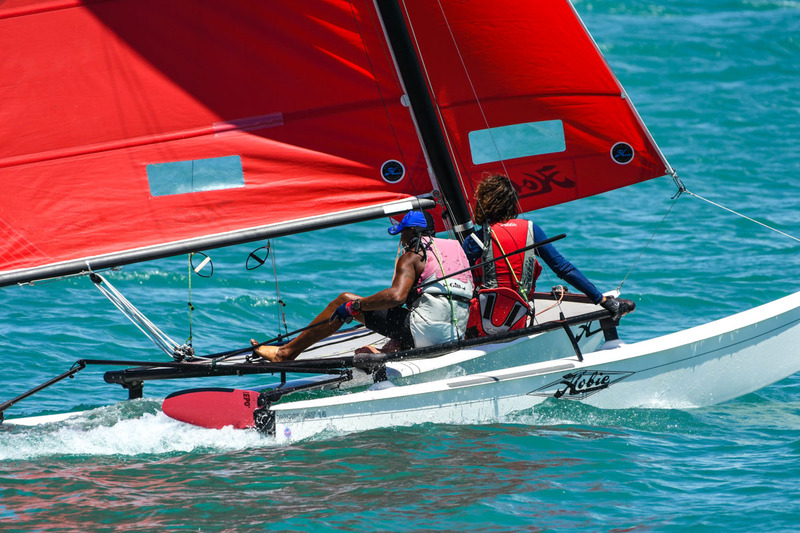 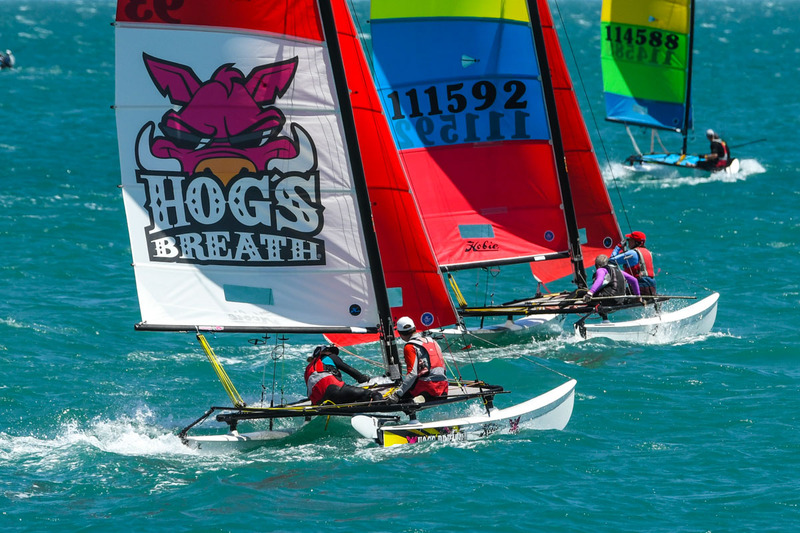 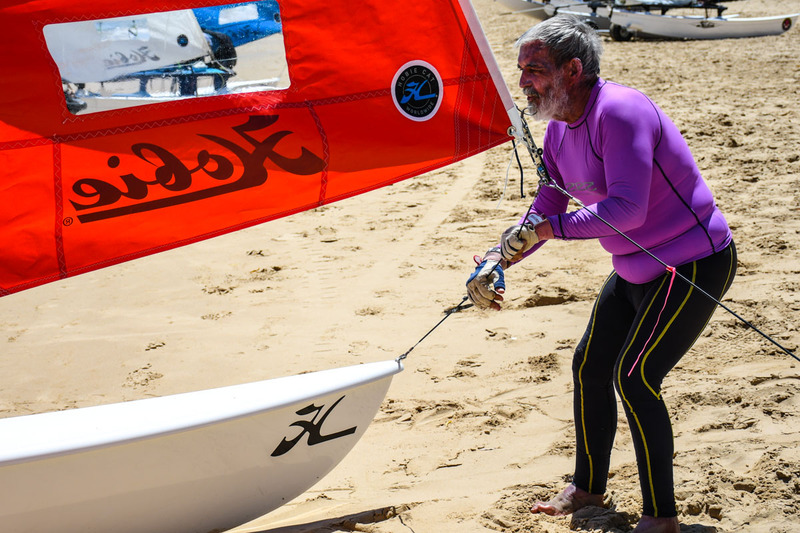 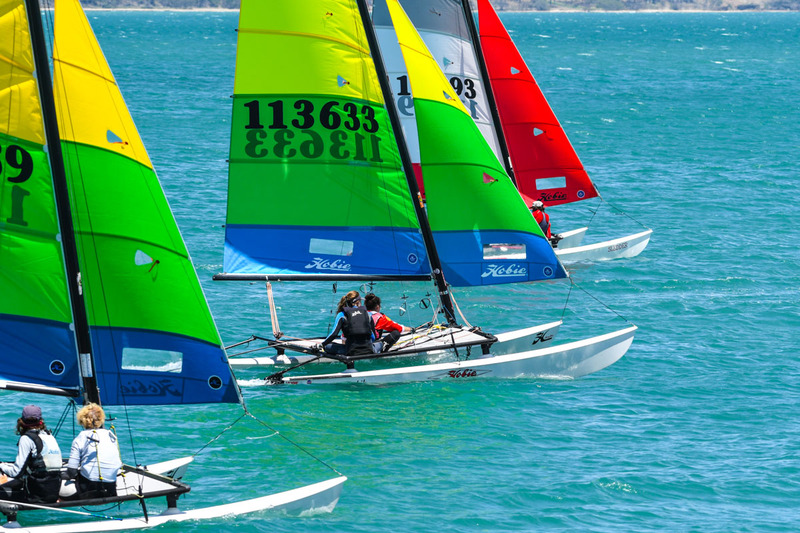 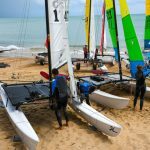 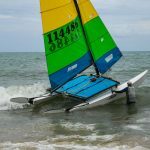 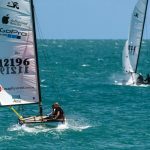 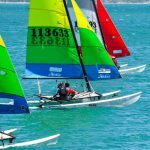 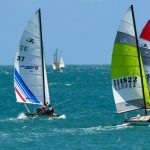 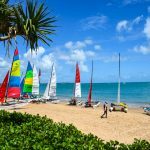 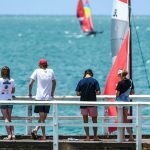 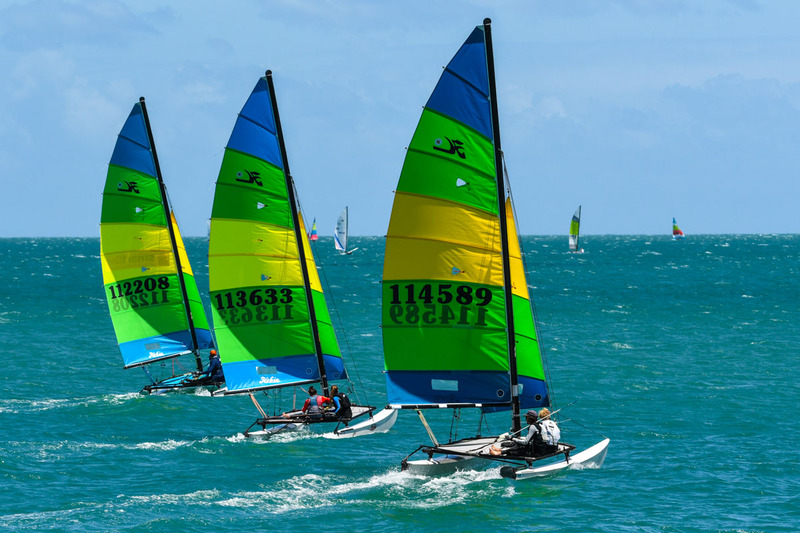 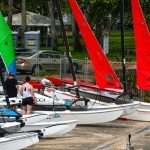 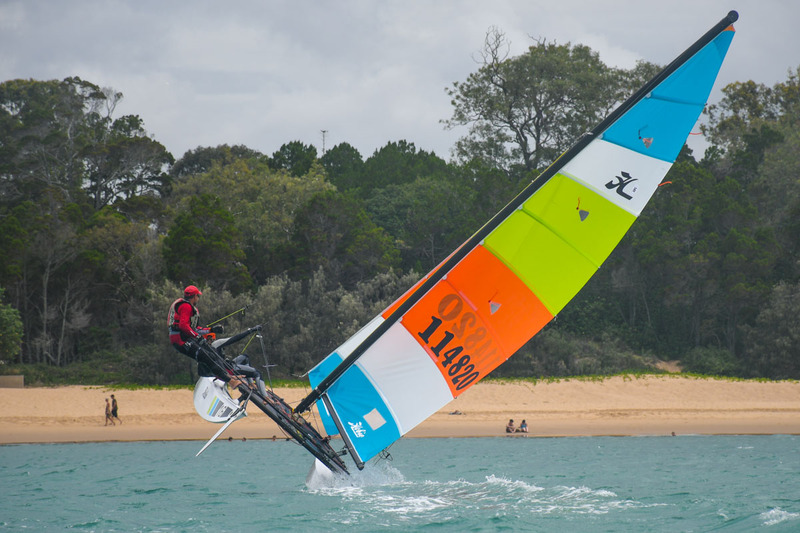 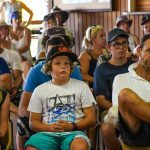 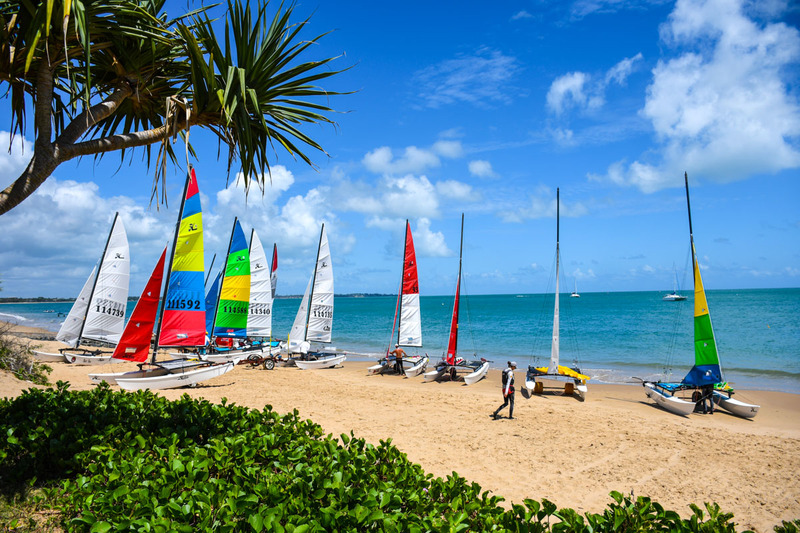 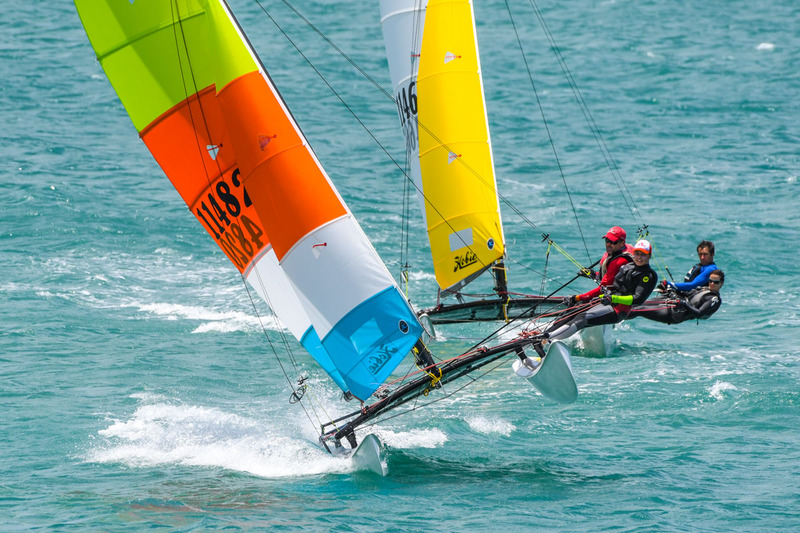 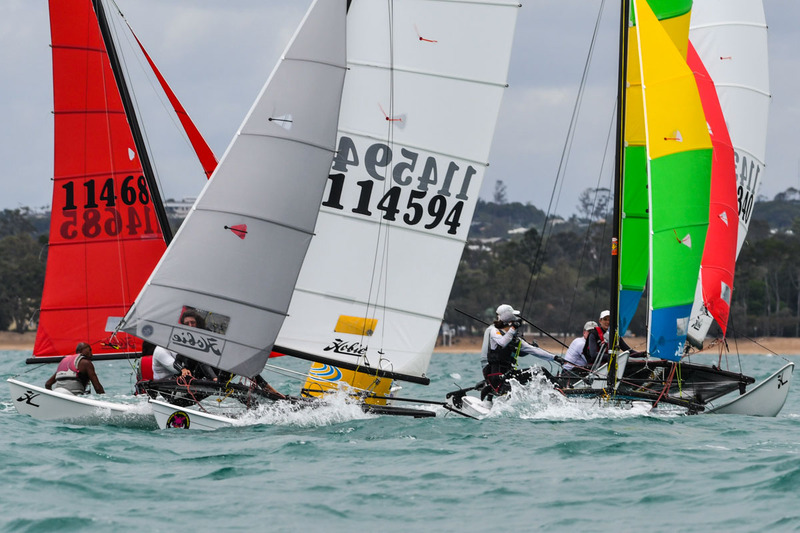 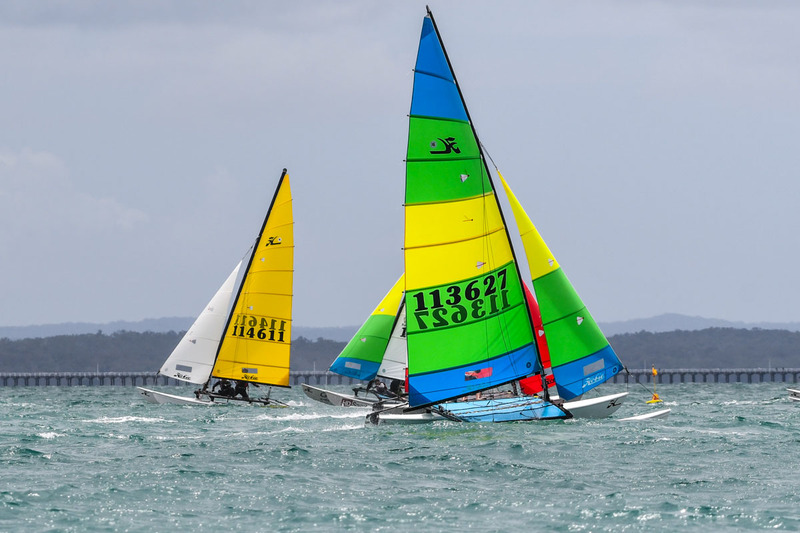 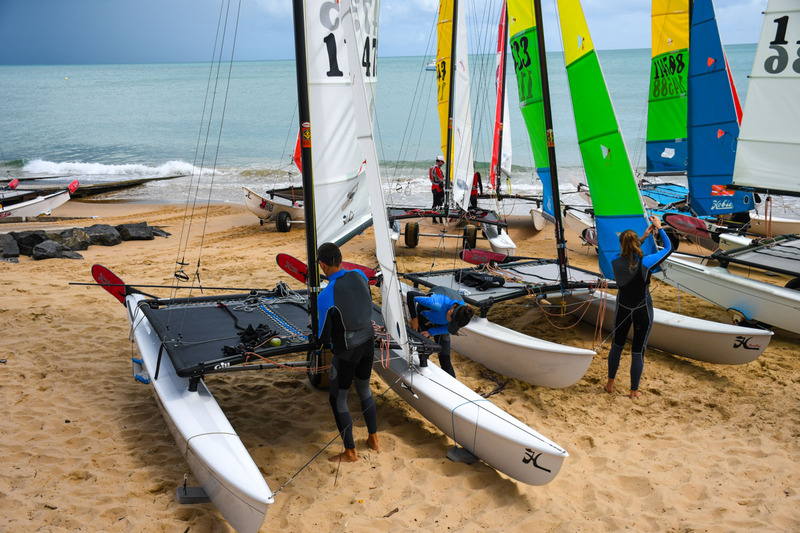 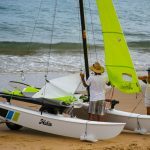 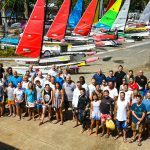 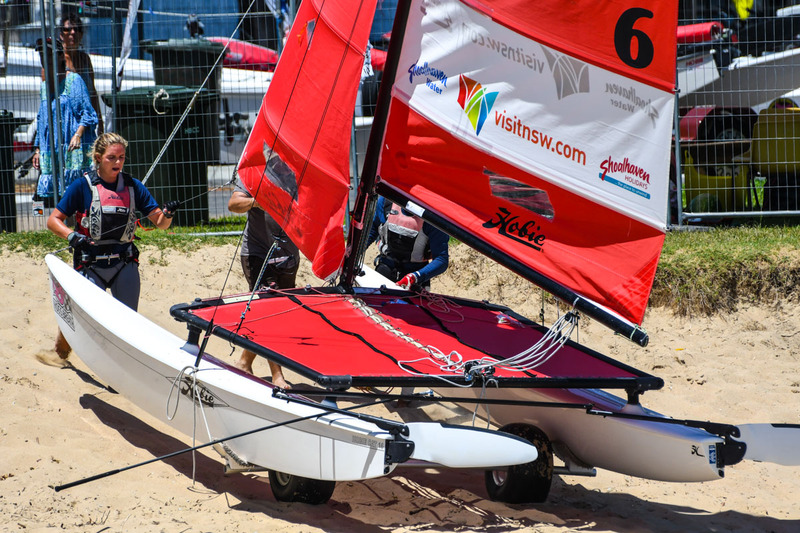 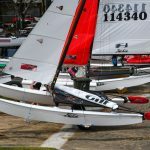 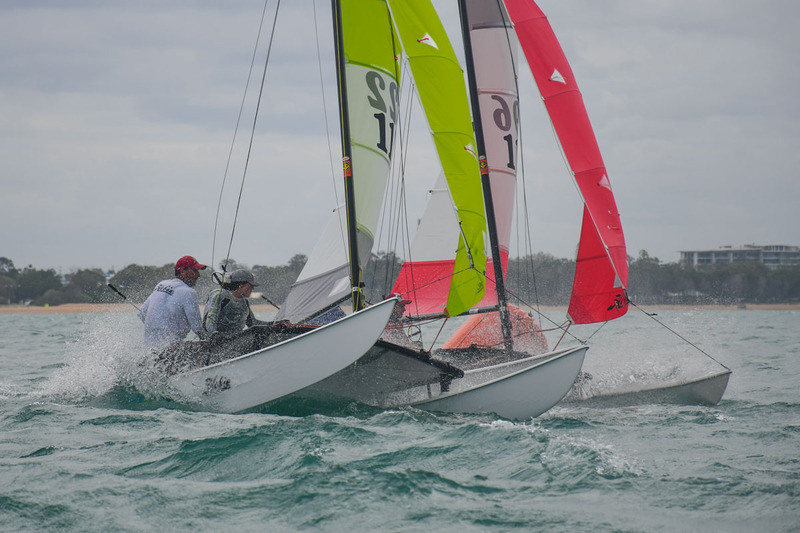 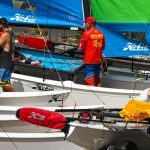 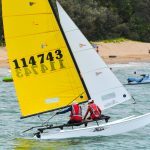 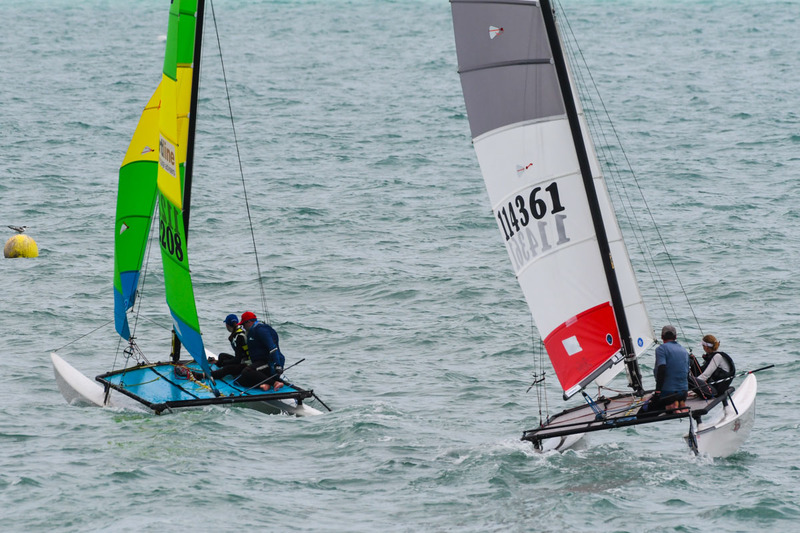 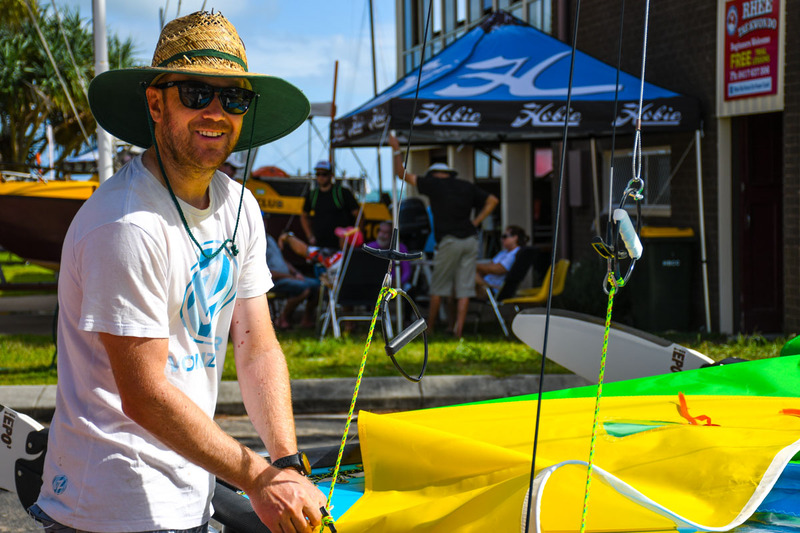 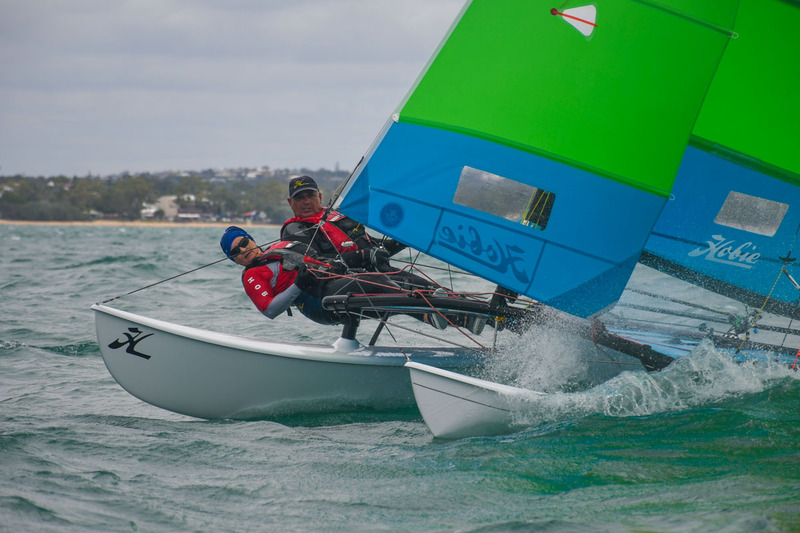 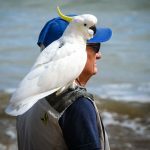 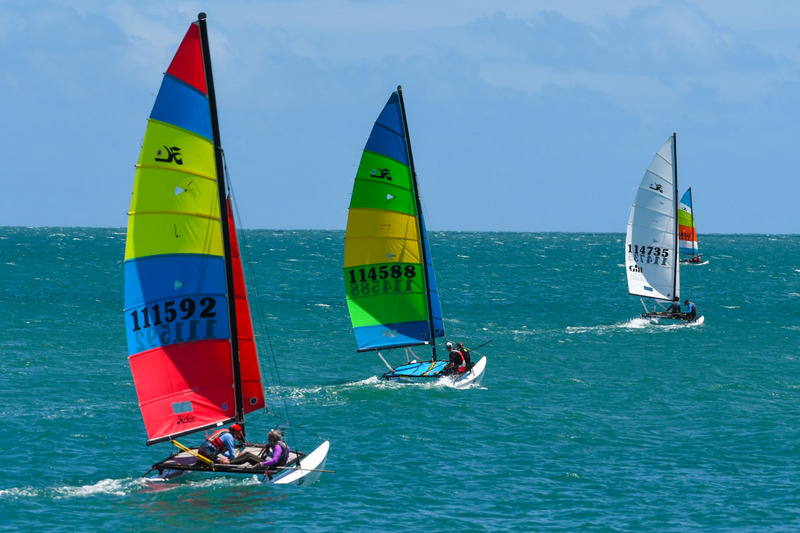 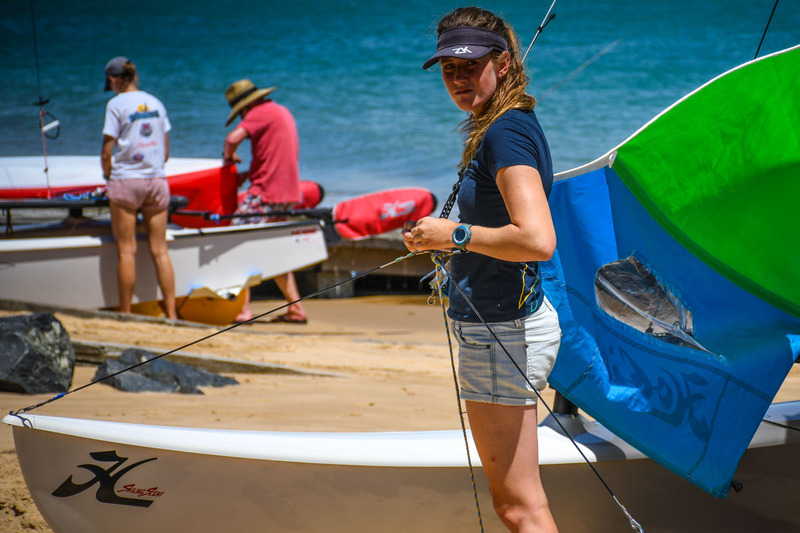 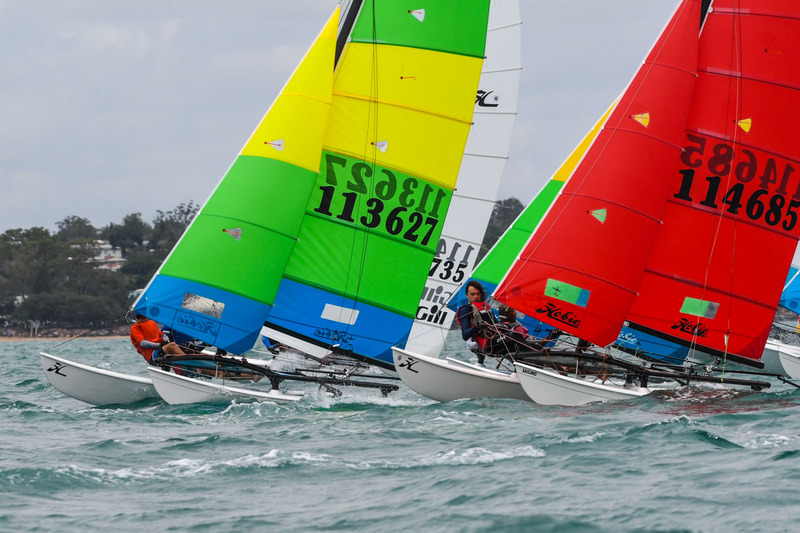 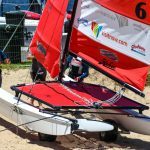 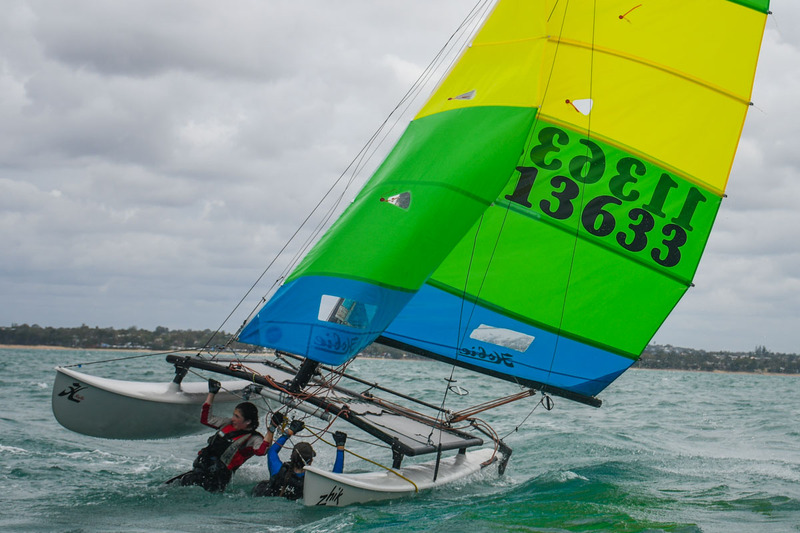 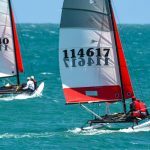 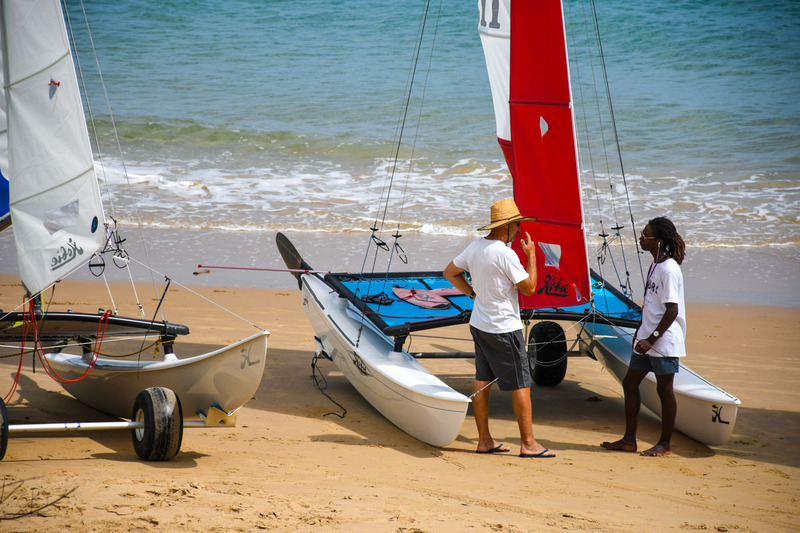 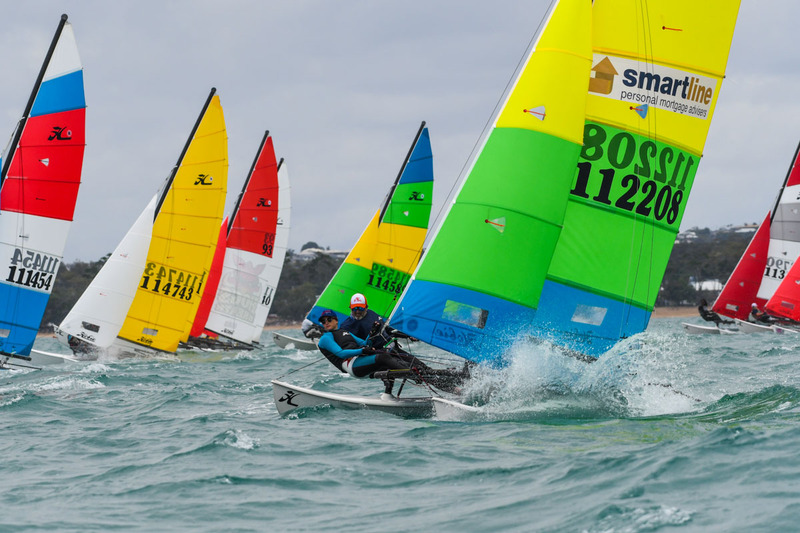 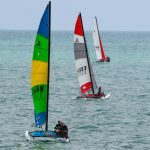 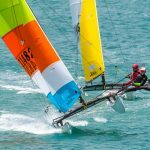 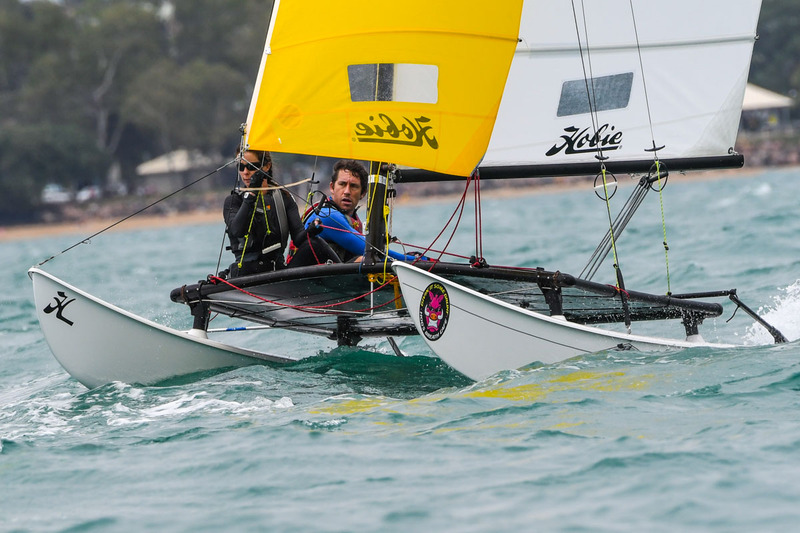 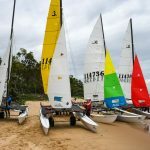 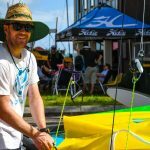 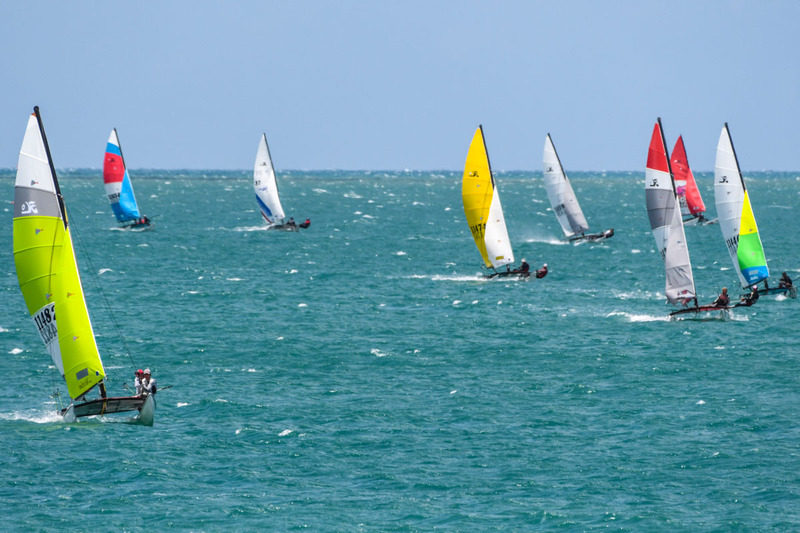 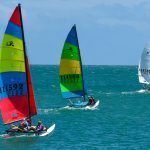 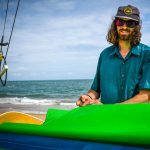 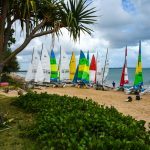 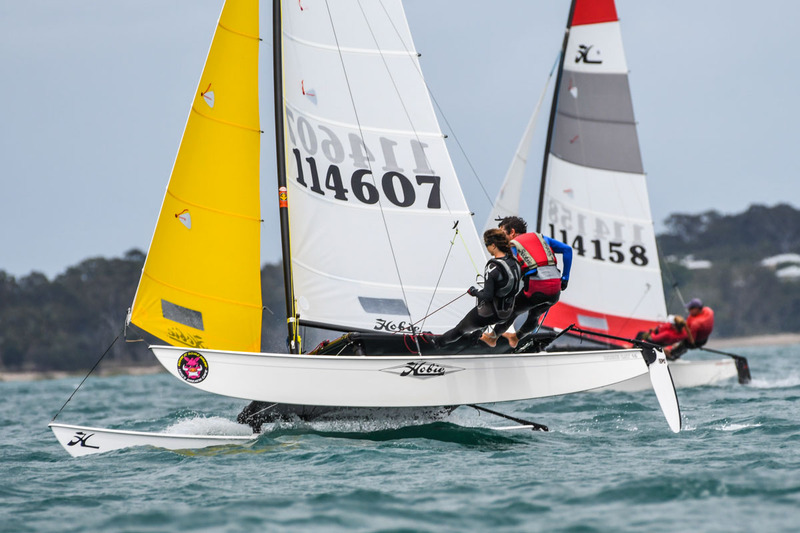 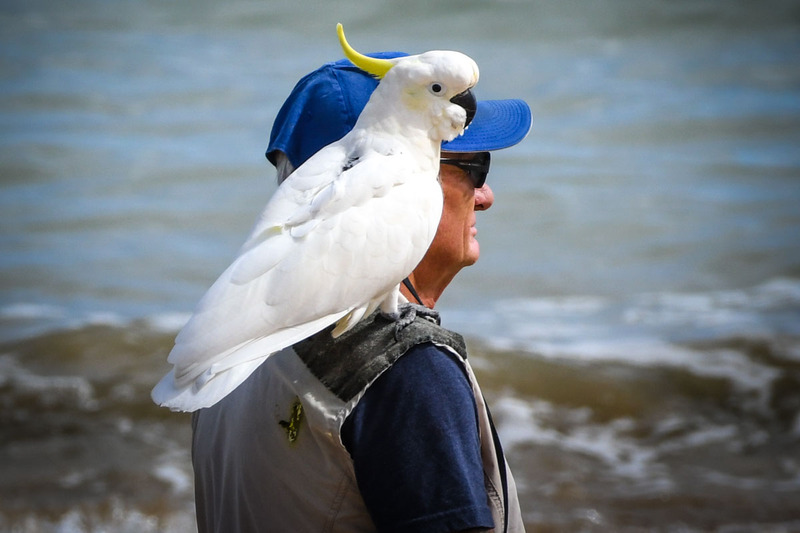 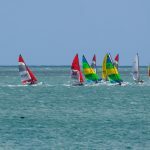 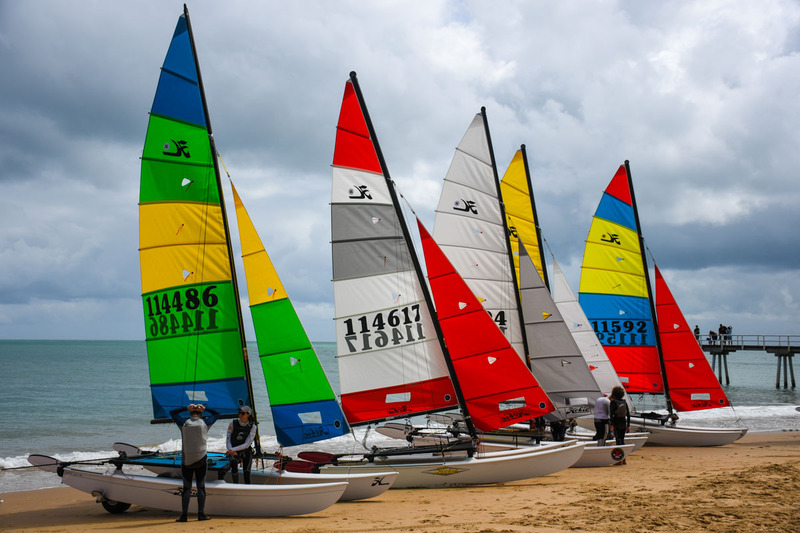 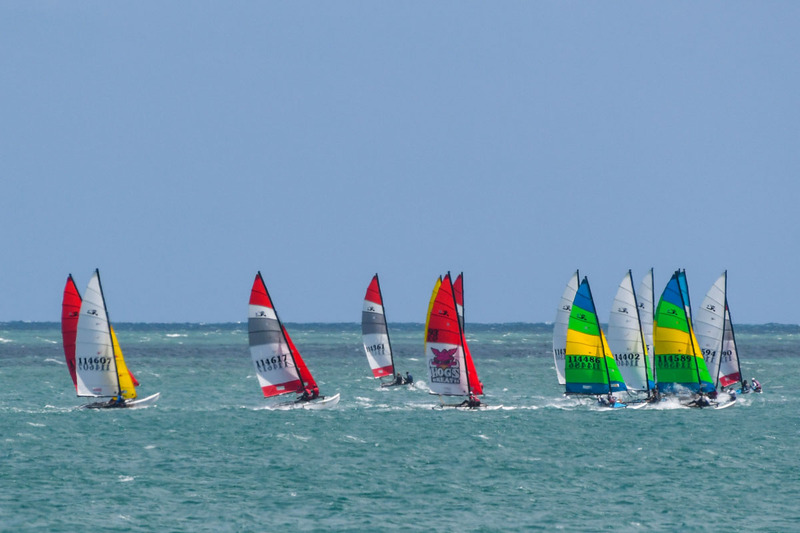 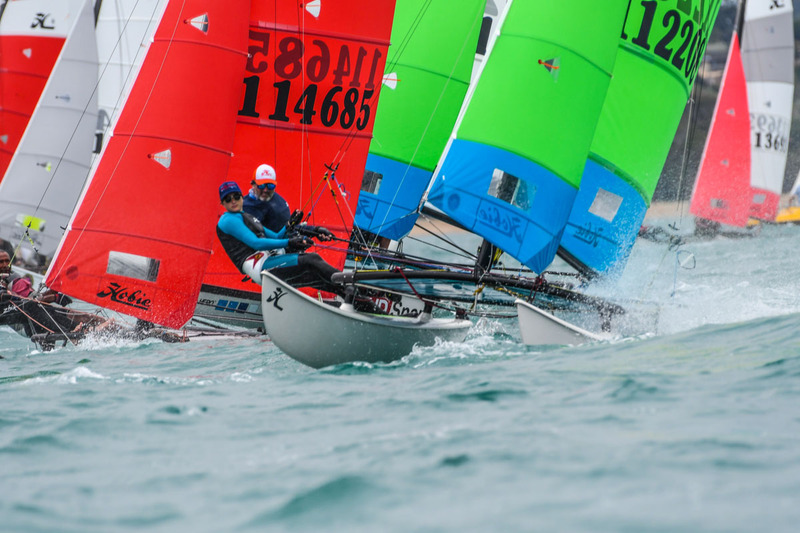 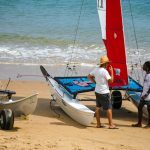 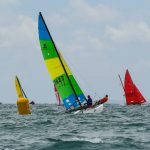 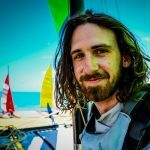 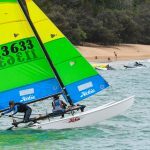 The 2nd series of the Hobie Australian Championships at Hervey Bay started today. 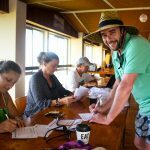 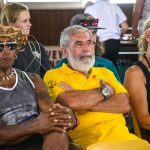 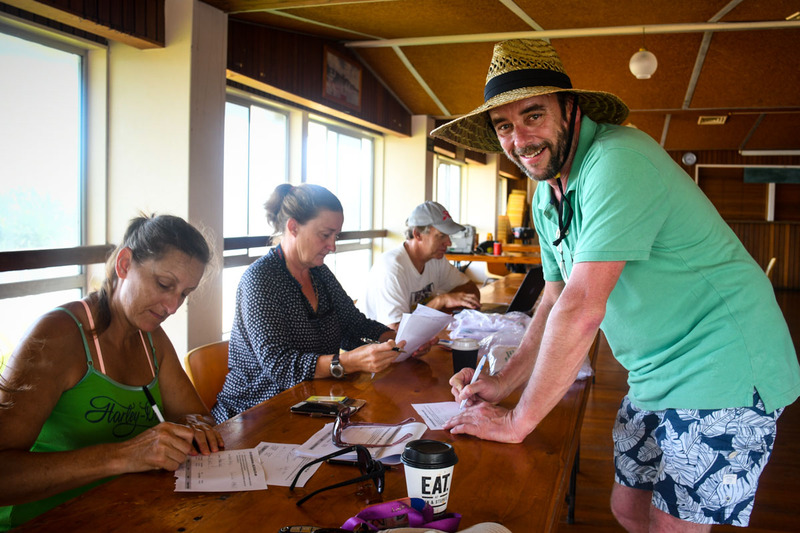 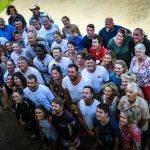 After the final registration and weigh in the call from the race committee ‘off the beach’. 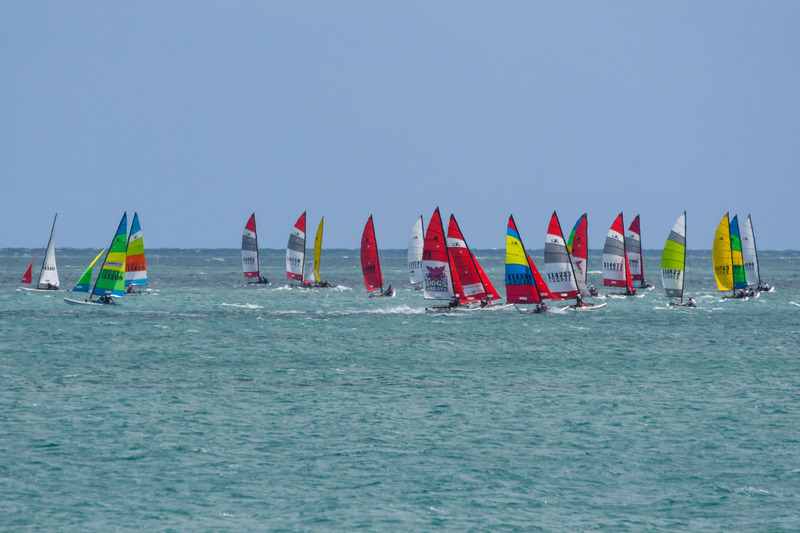 The race started in 8-10 knots and built steadily throughout the day. 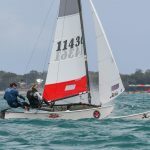 By the time the 4th race was started the breeze was 13-15 knots. 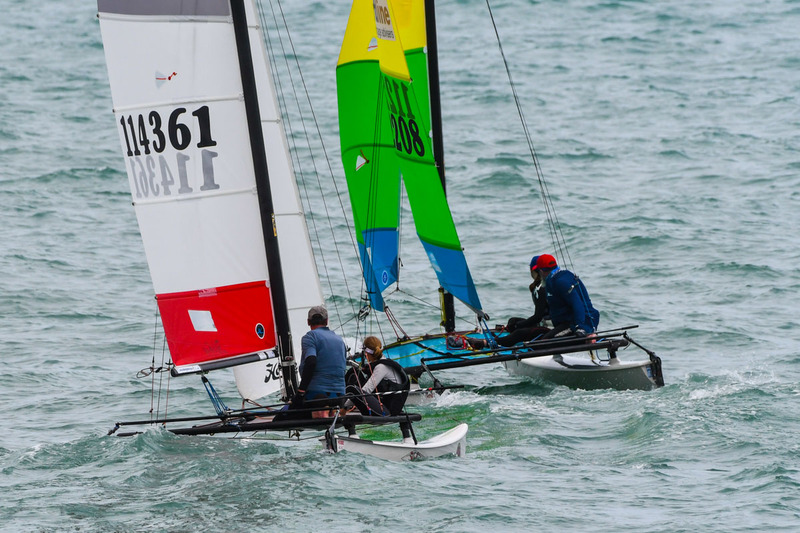 Rob Branch and Hannah Bates won the first two races . 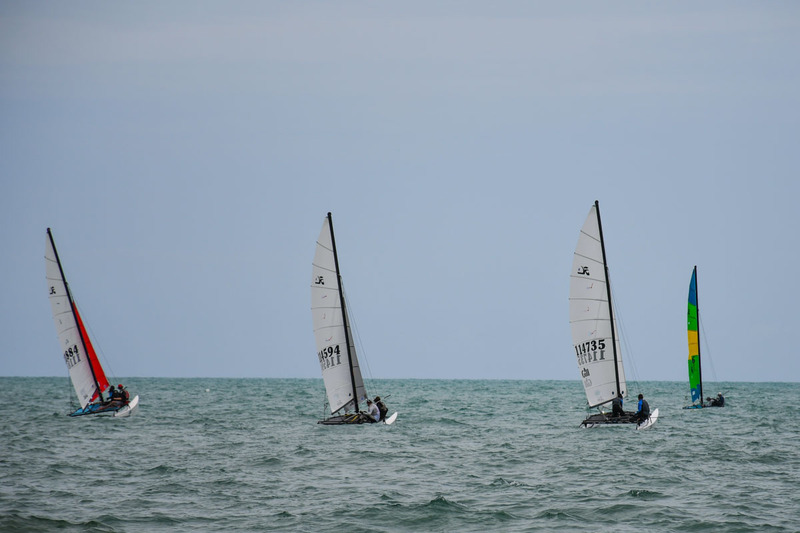 Though a seventh and eighth in races 3 and 4 dropped them to third overall. 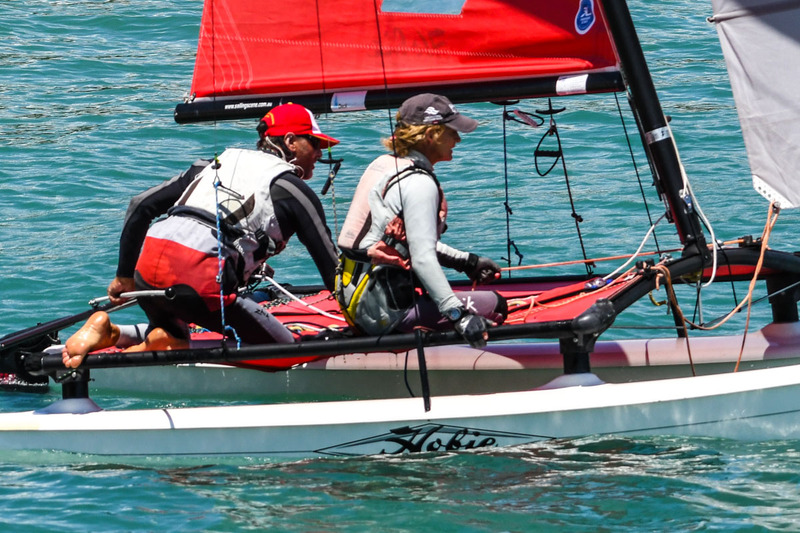 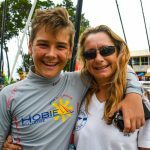 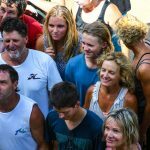 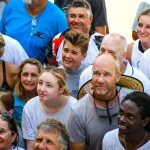 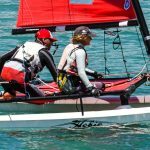 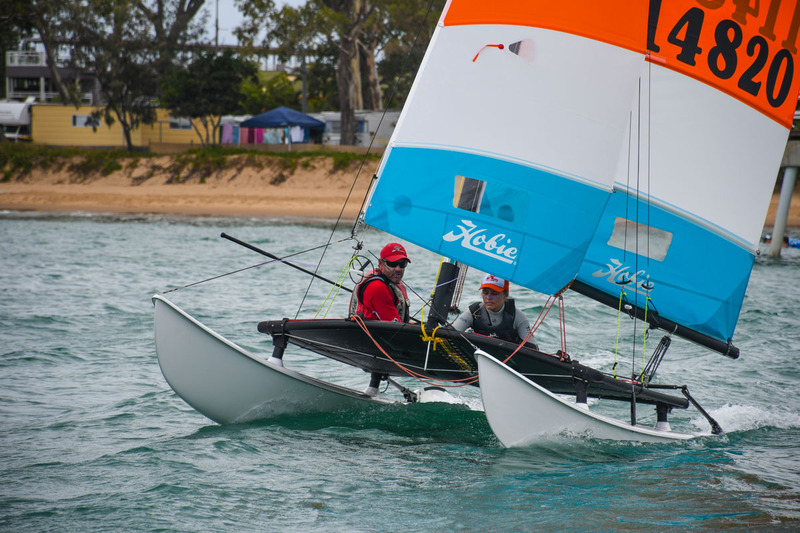 Former Hobie 16 National Champion Cam Owen and Suzie Gehent hold the lead from another team from Western Australia and former Hobie 16 national champions Darren Smith and Josie Marks. 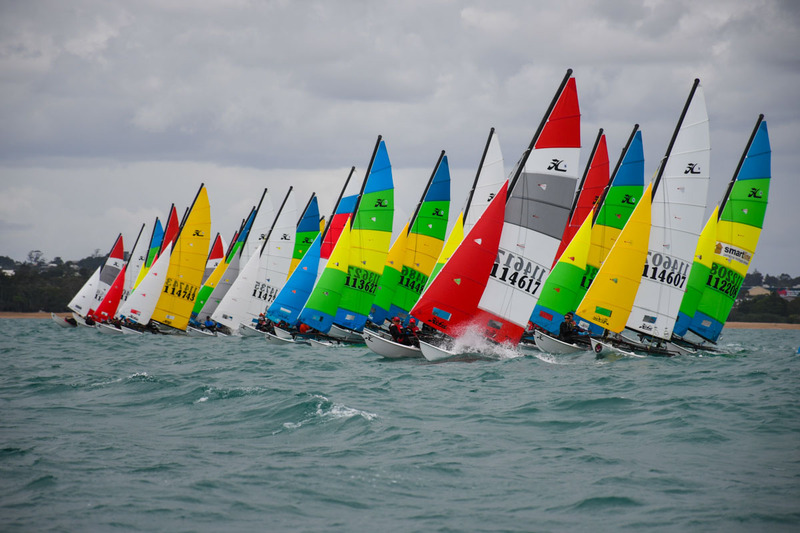 With similar weather patterns predicted tomorrow there will be lots of close racing. 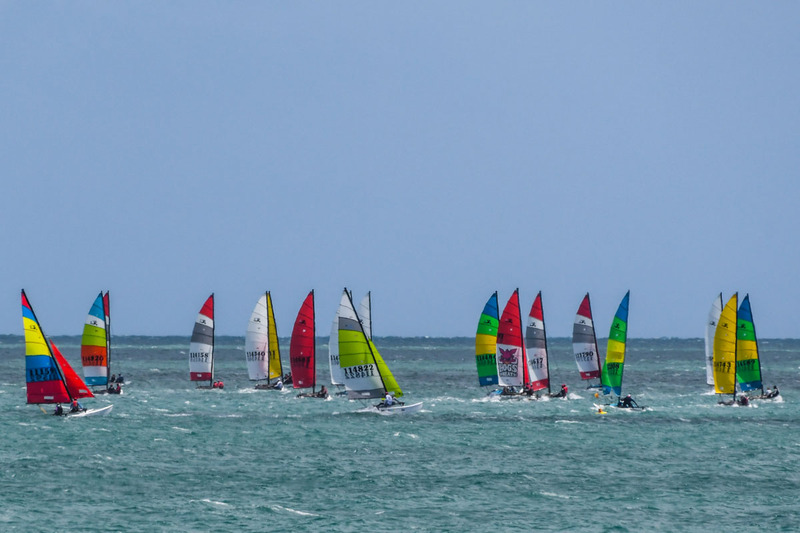 The leading group of front sailors is very close. 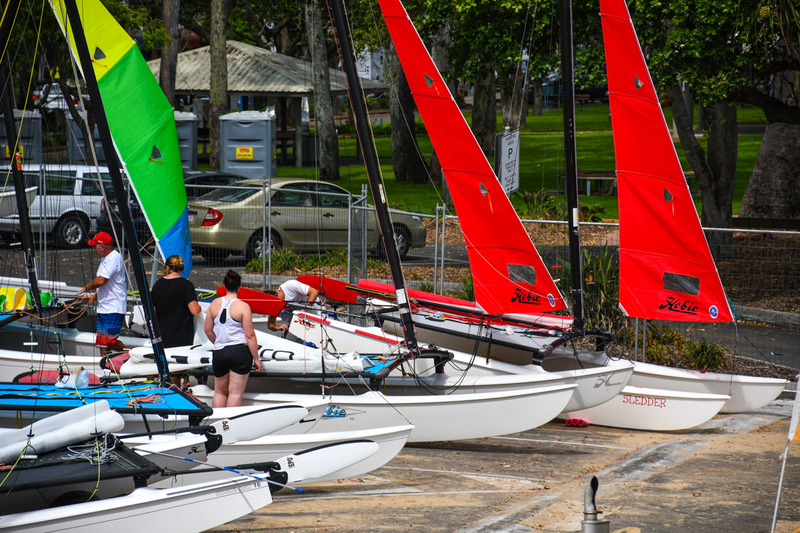 A simple mistake on the racecourse can mean the loss of 8-10 places as they found out today. 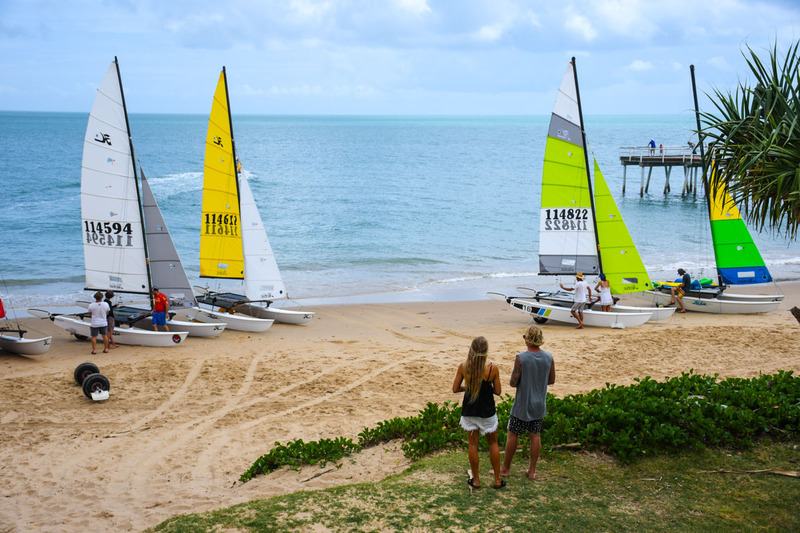 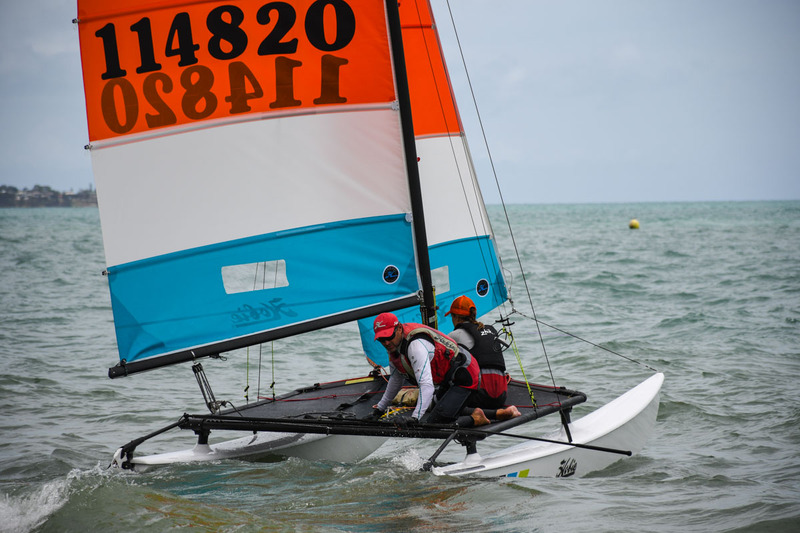 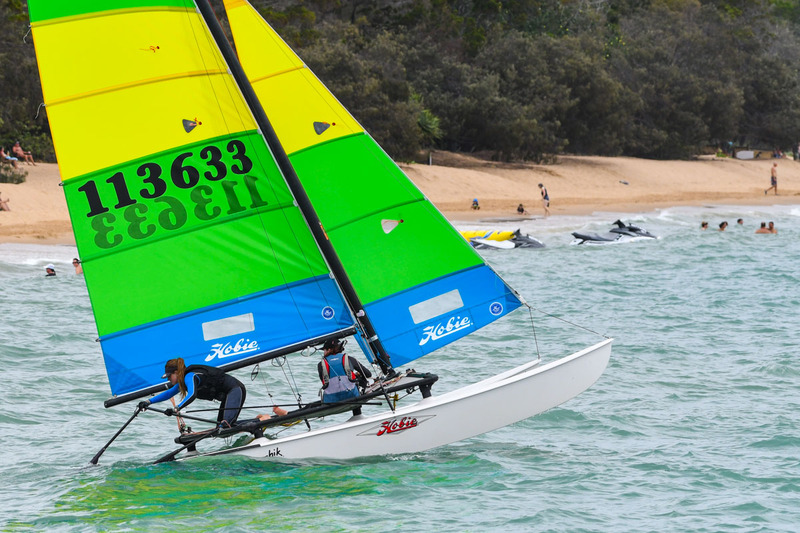 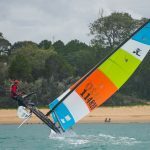 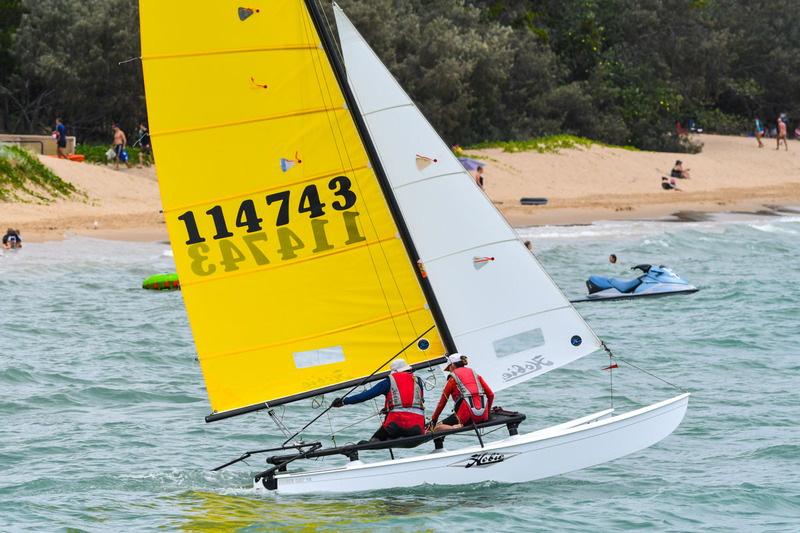 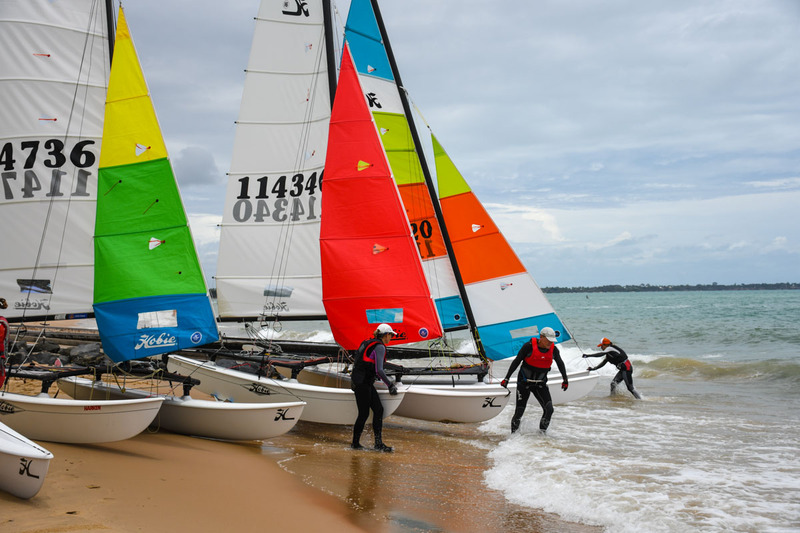 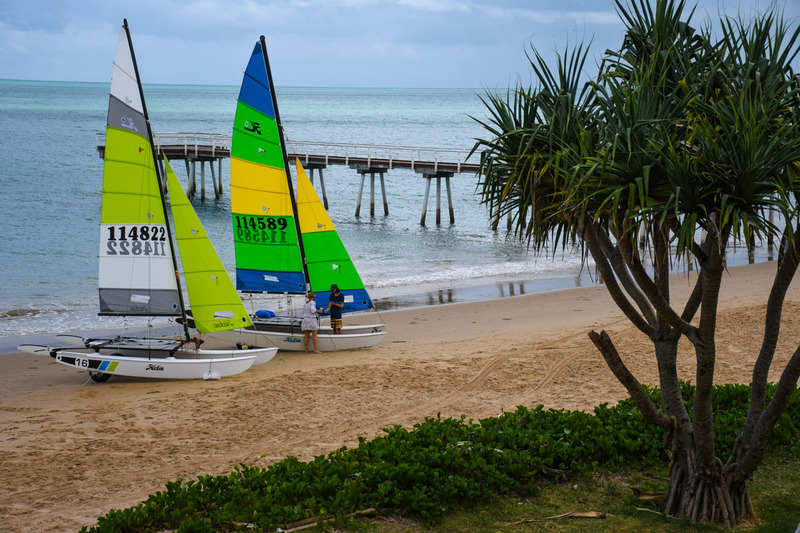 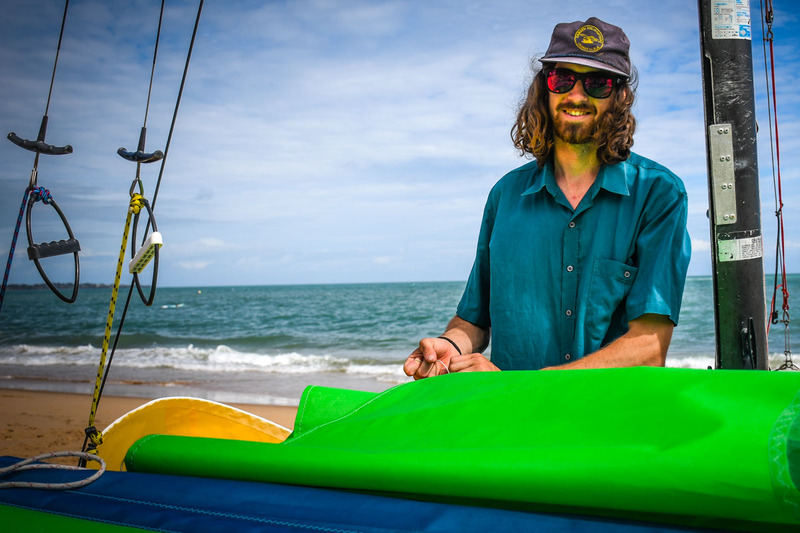 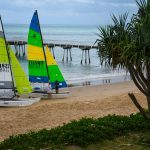 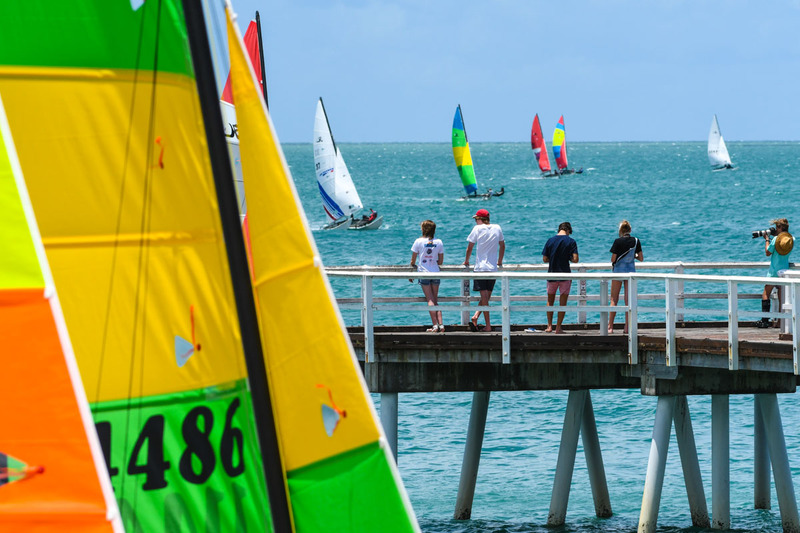 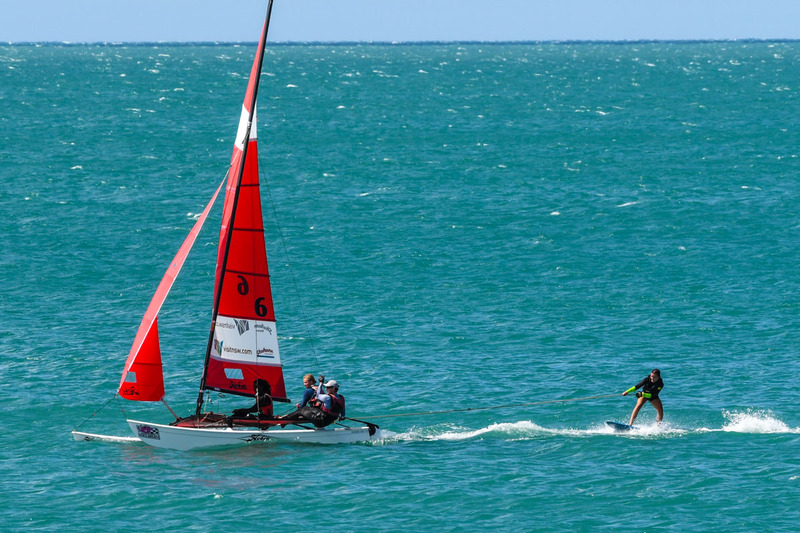 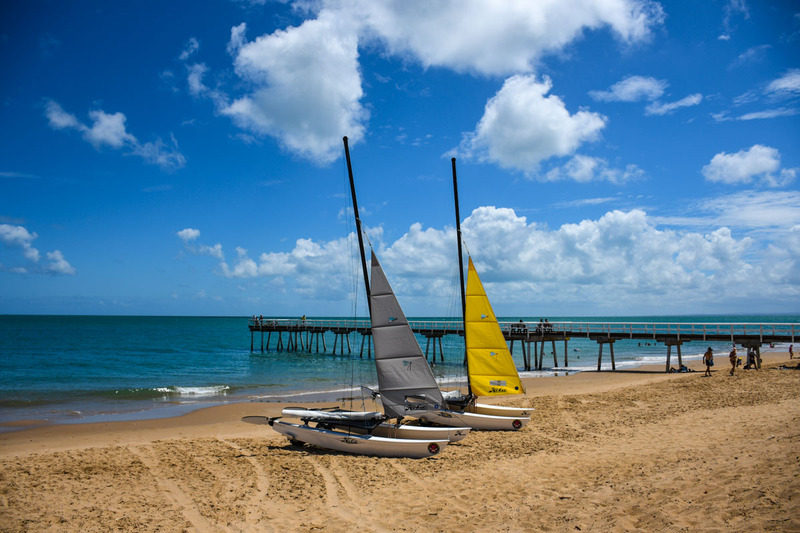 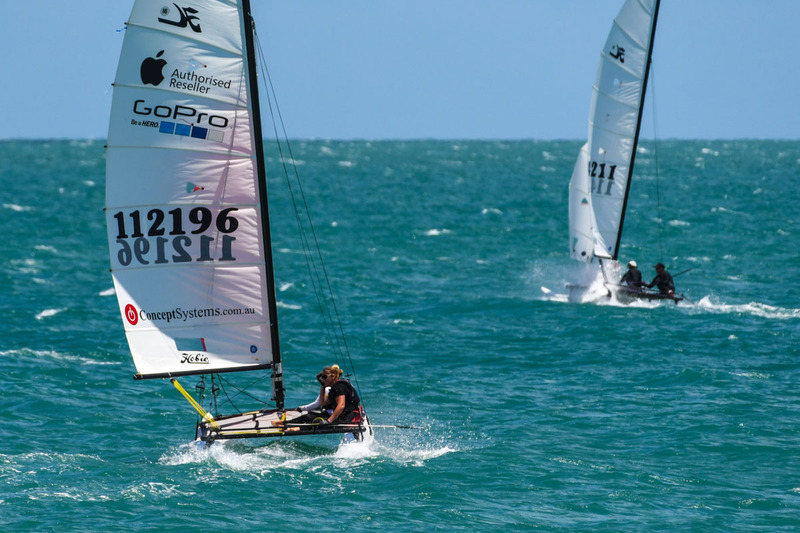 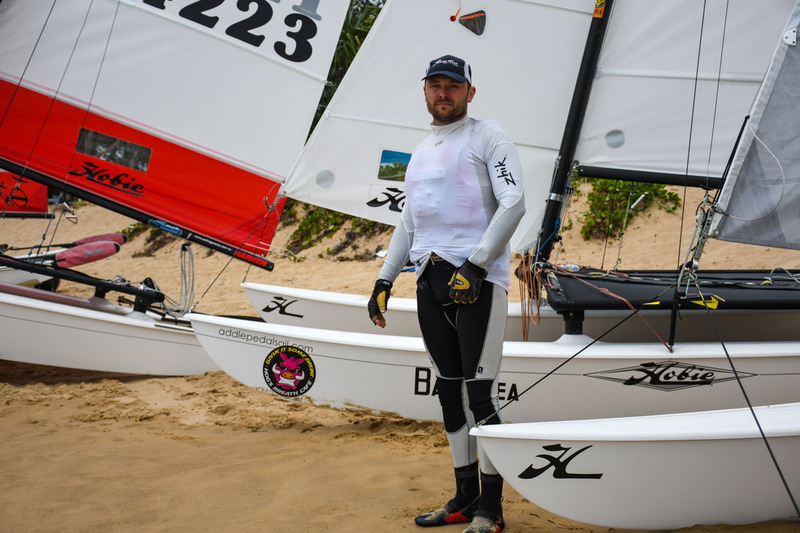 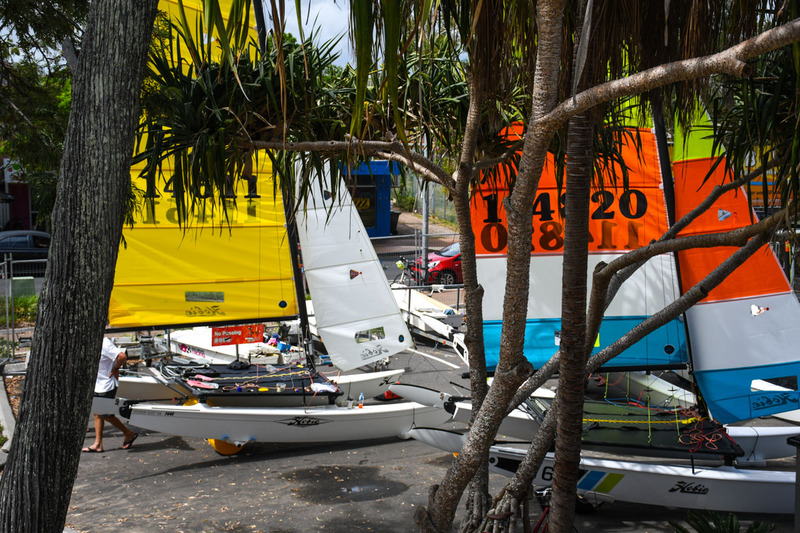 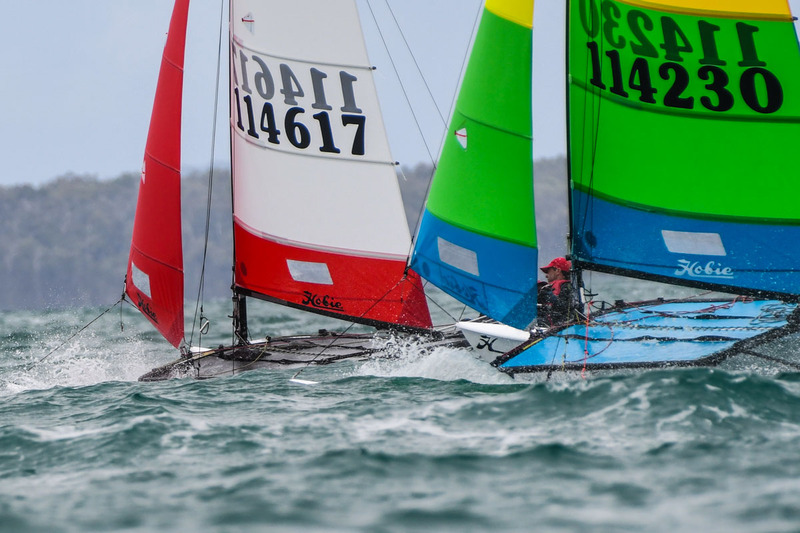 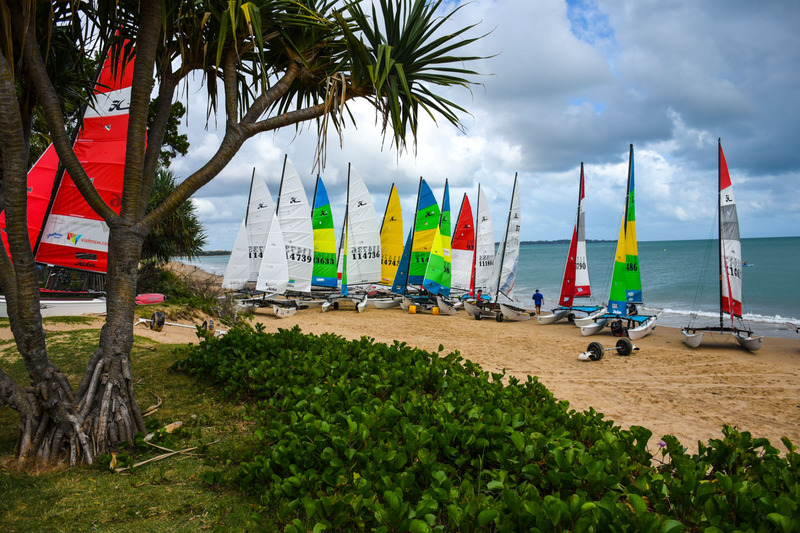 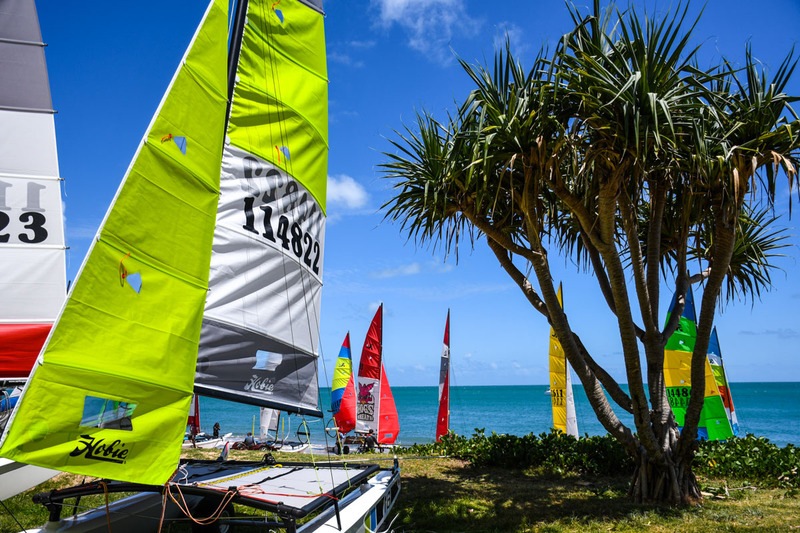 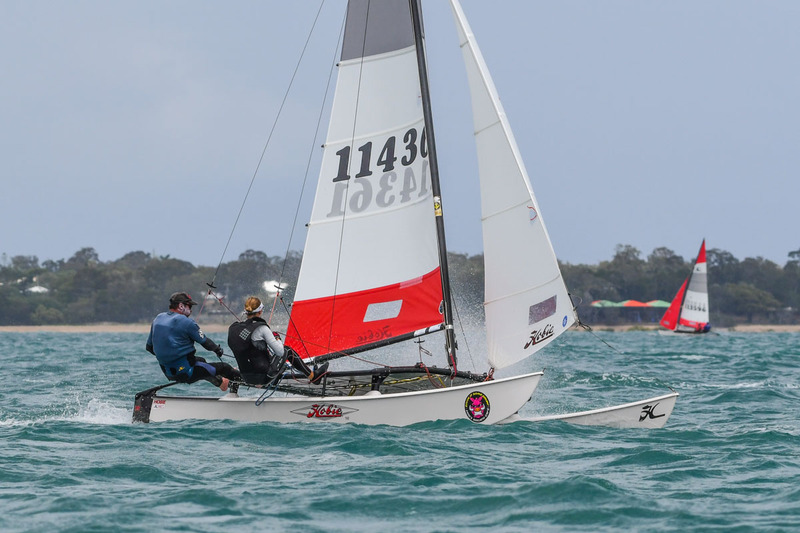 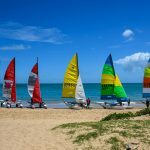 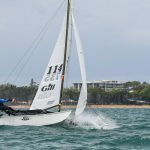 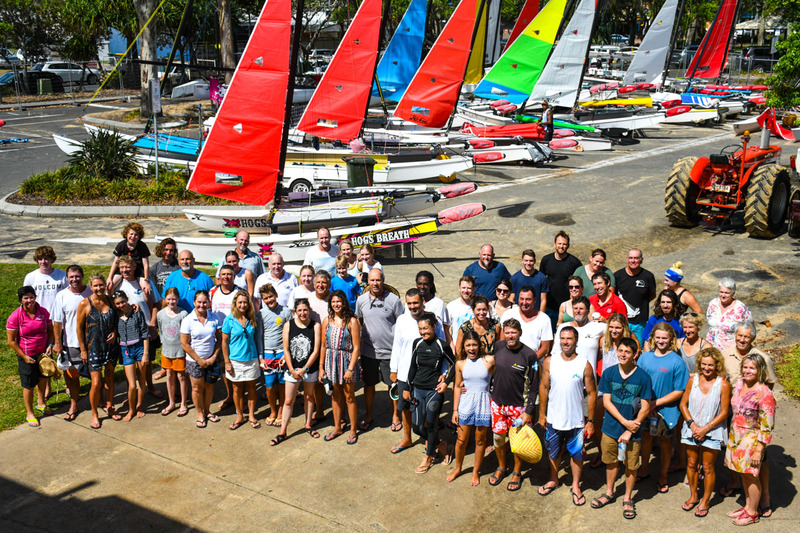 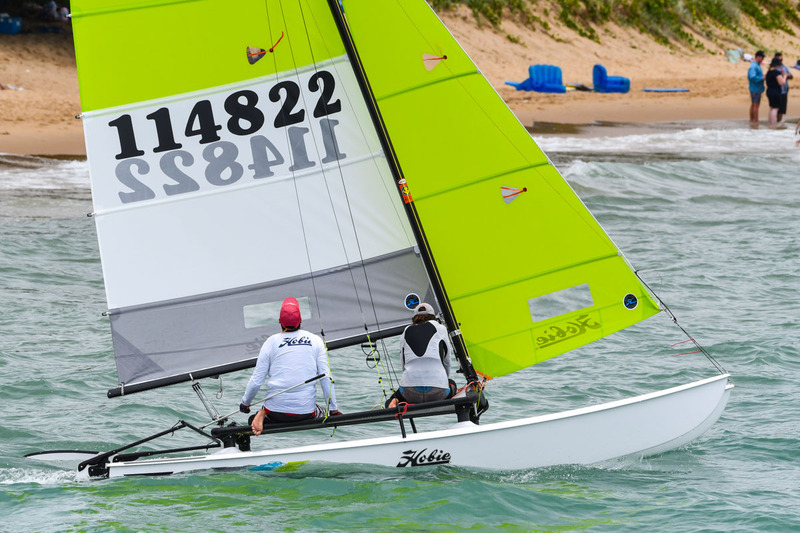 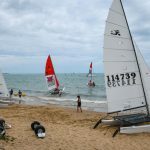 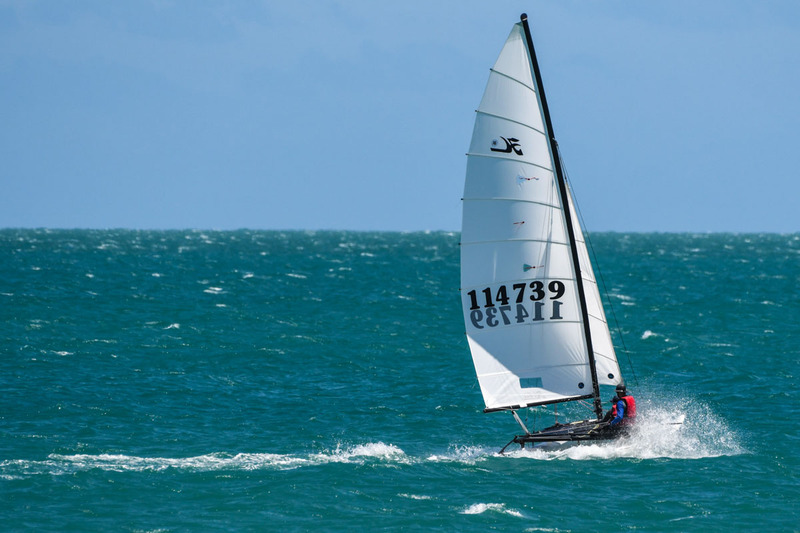 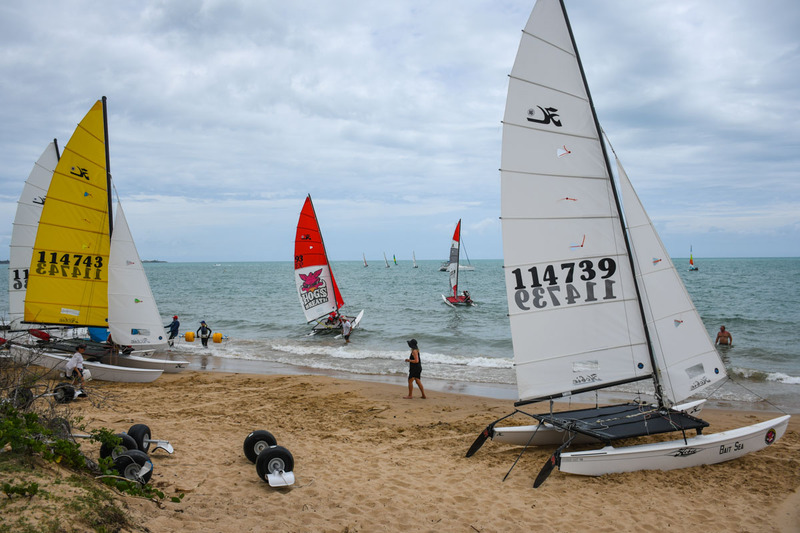 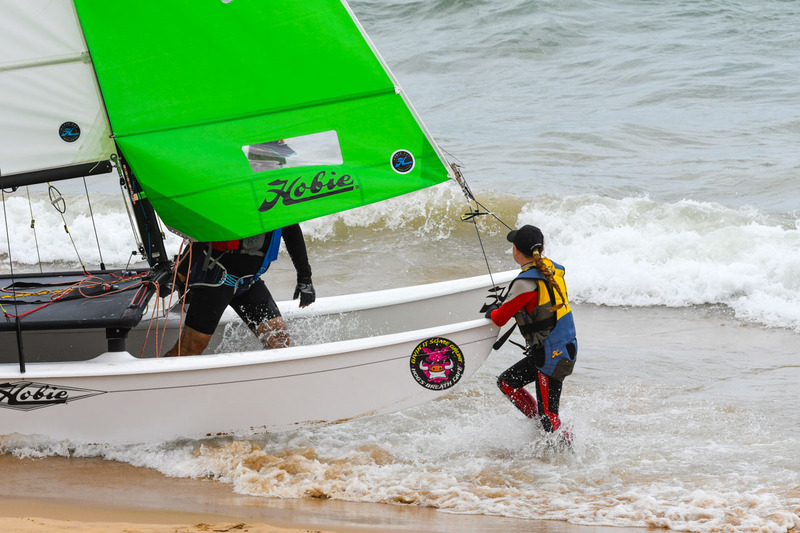 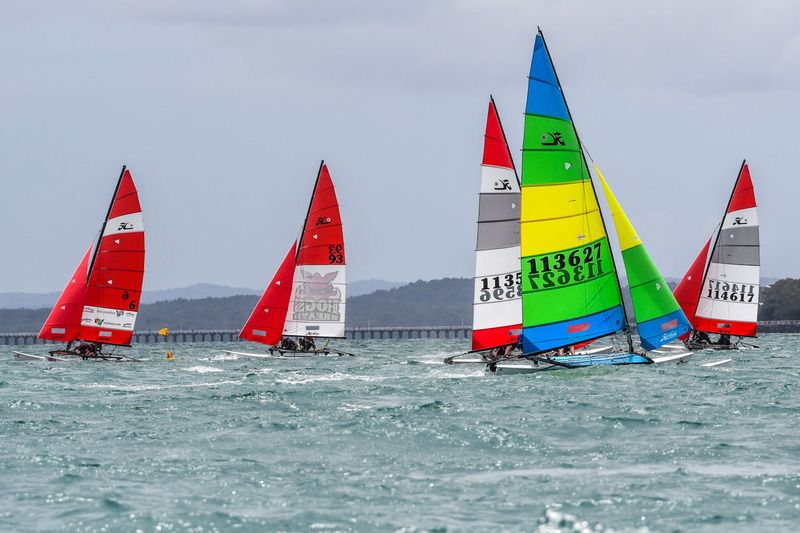 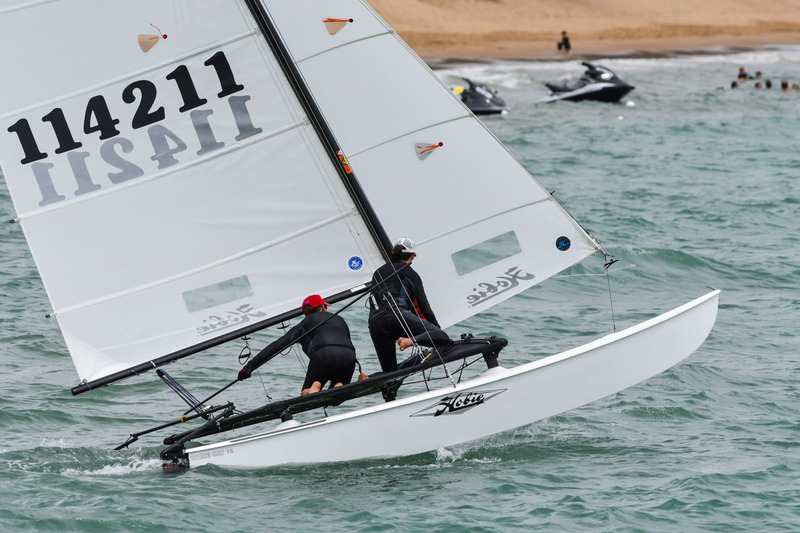 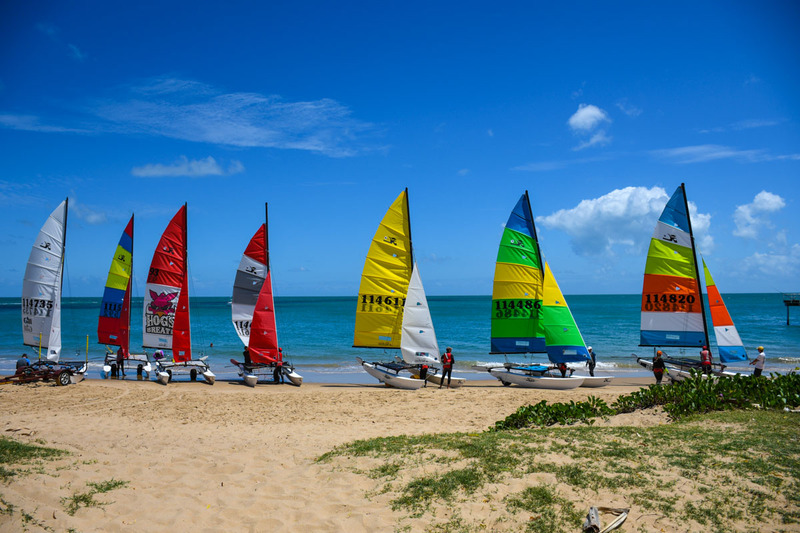 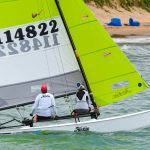 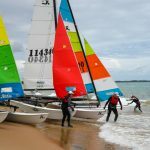 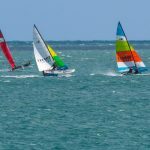 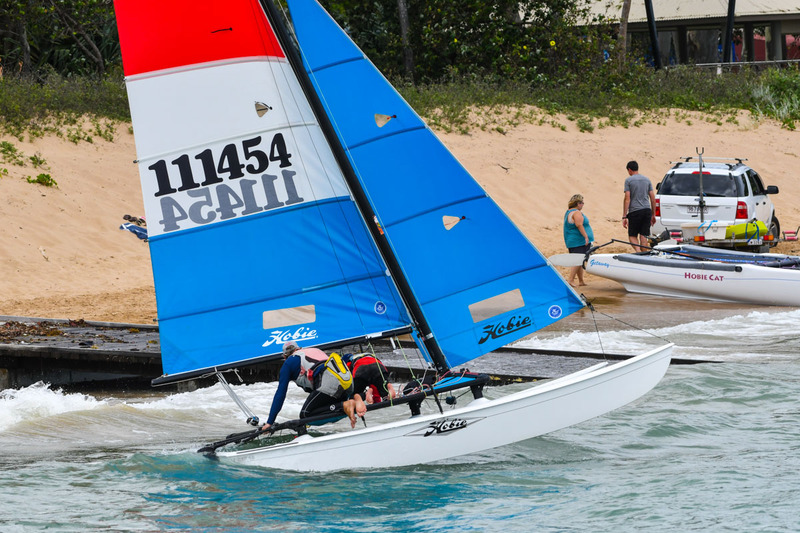 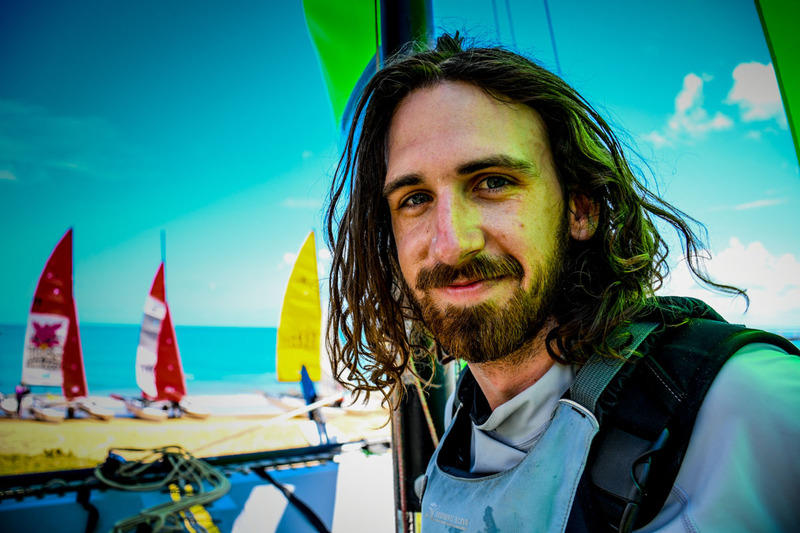 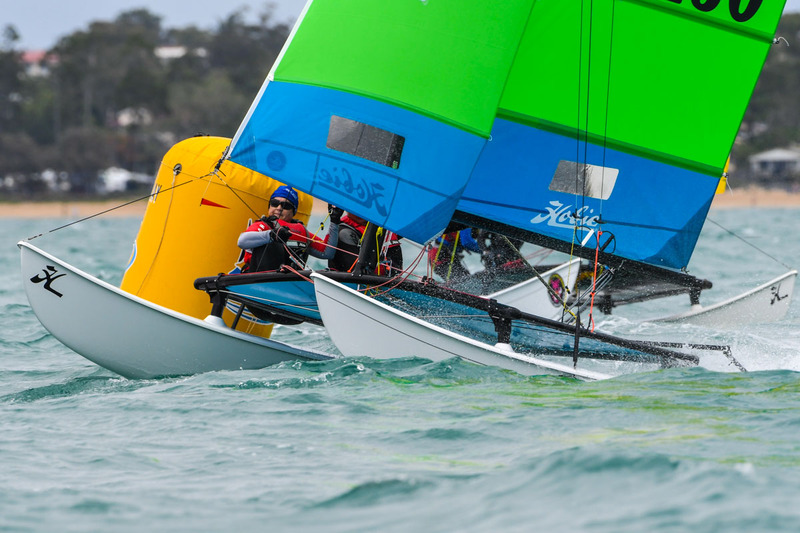 Wind, waves and plenty of action greeted the Hobie 16 sailors at Hervey Bay . 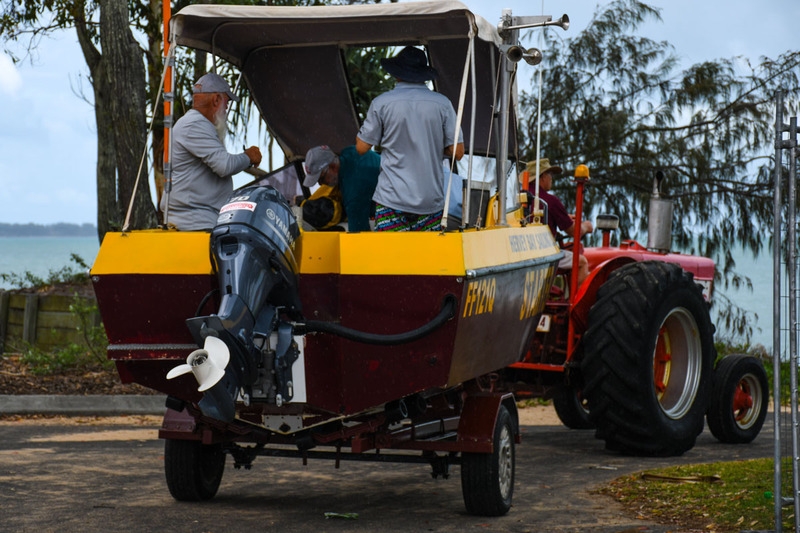 The race committee sent the boat off the beach in what looked to be relatively calm conditions. 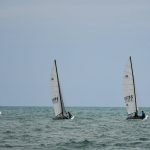 The sailors soon found the breeze was around 18 knots and building. 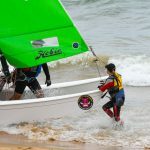 While some of the leaders found the conditions fun other found it quite challenging with the sea conditions. 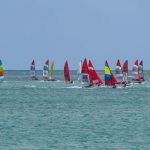 Towards the end of the race the breeze was gusting up to 28 knots. 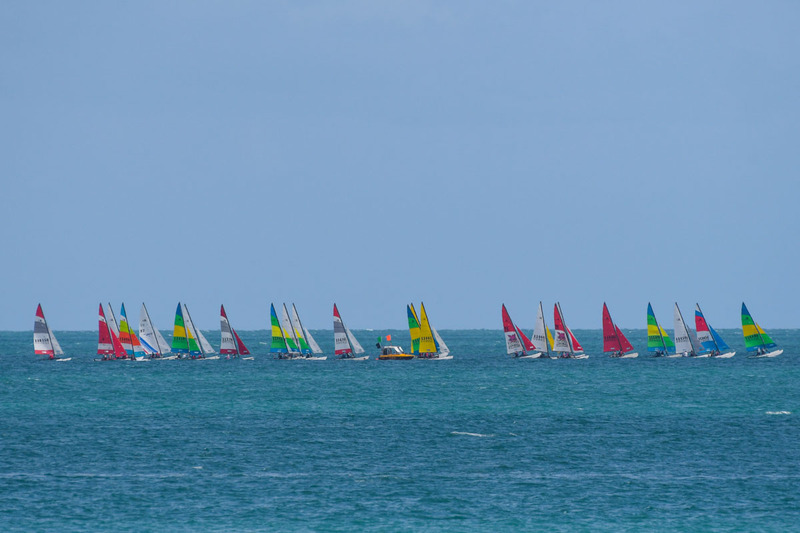 After the completion of the first race the race committee sent the fleet back to shore. 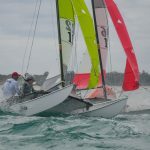 After a break and the high tide the breeze eased back to 16 knots gusting up to 20 knots. 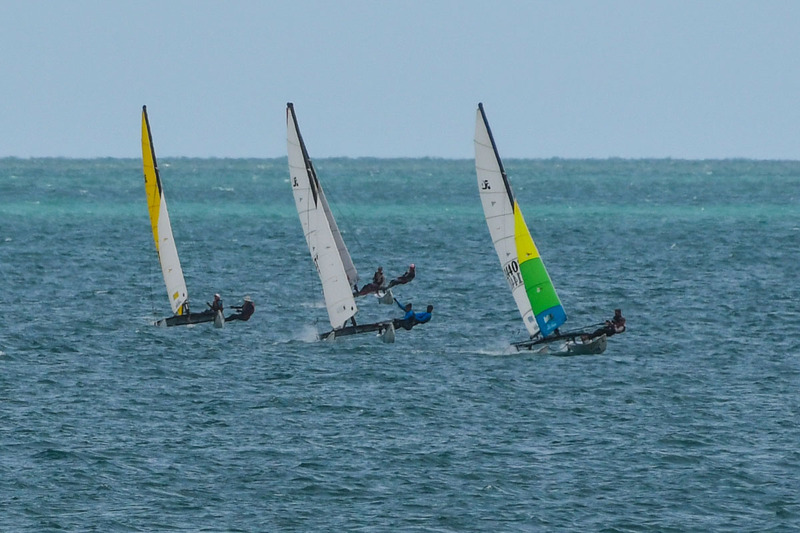 The race committee sent the fleet back out for two more races back-to-back. 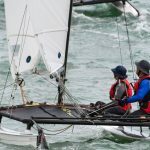 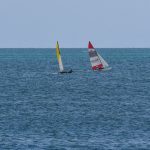 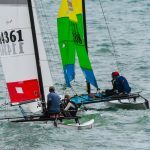 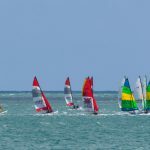 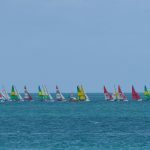 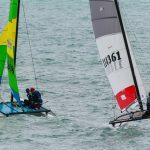 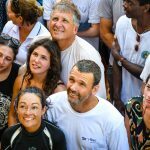 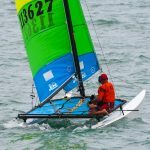 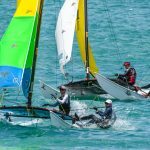 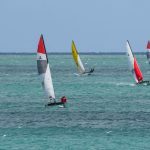 The majority of the sailors enjoyed and even revelled in the conditions. 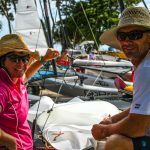 Overnight leaders Cam Smith and Suzzie Ghent had the lead in the last race of the day but capsized. 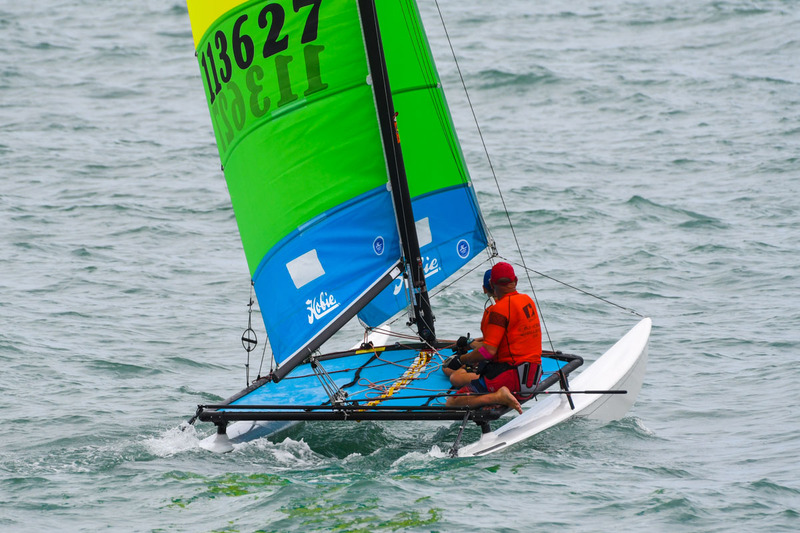 They quickly righted the boat to finish 8th. 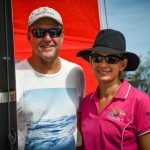 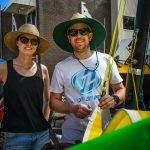 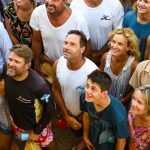 Unfortunately they not only lost the race but the overall lead to fellow Western Australian’s Darren Smith and Josie Marks. 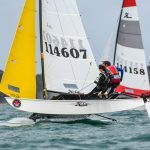 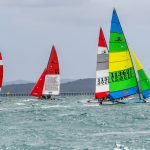 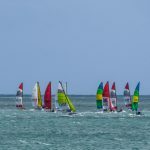 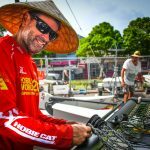 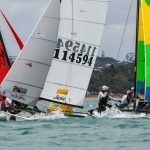 With seven races completed there have been five different winners showing how competitive it is at the front end of the fleet. 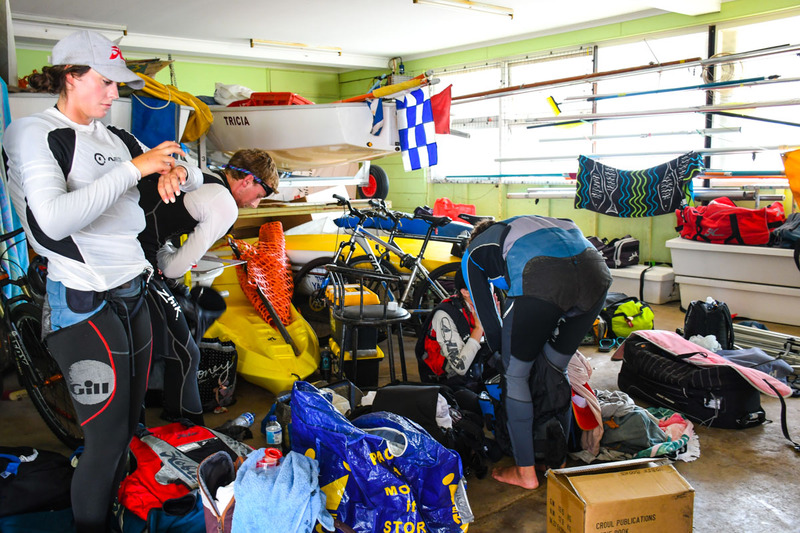 A simple mistake and it was easy to lose many places. 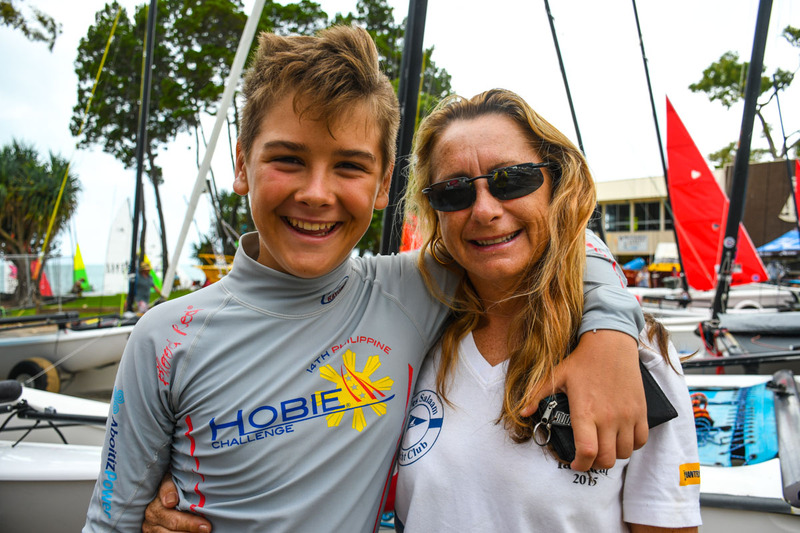 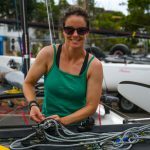 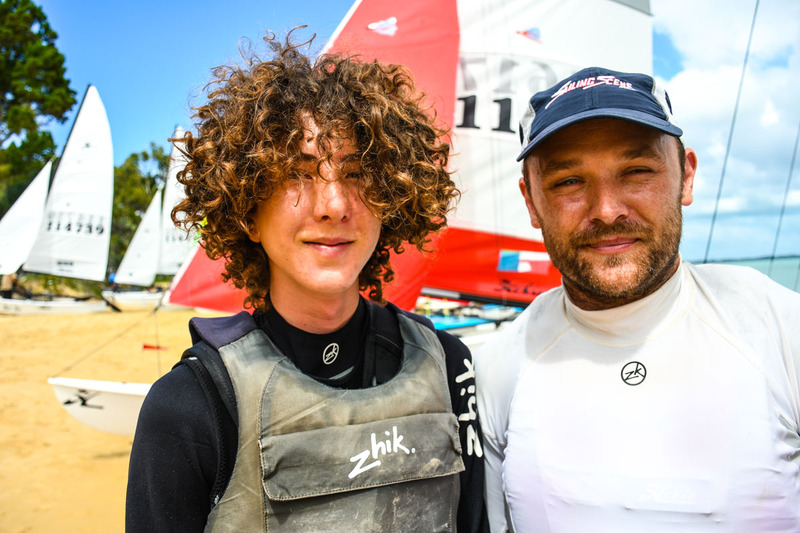 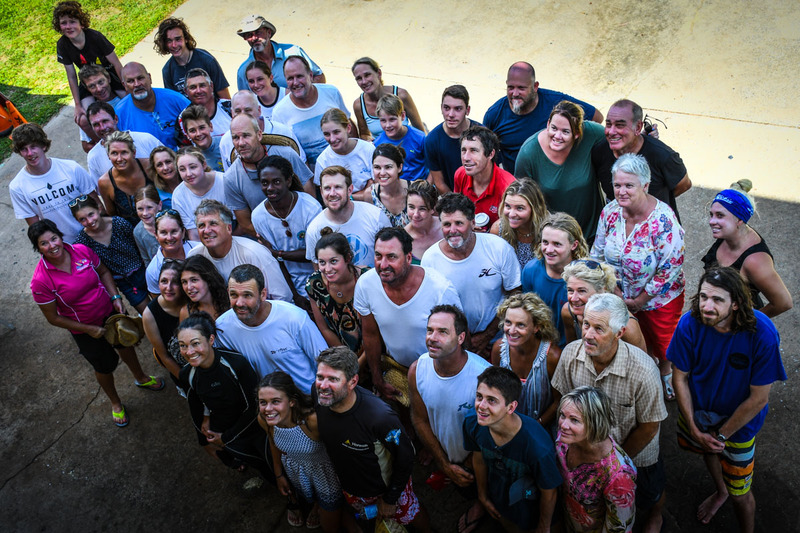 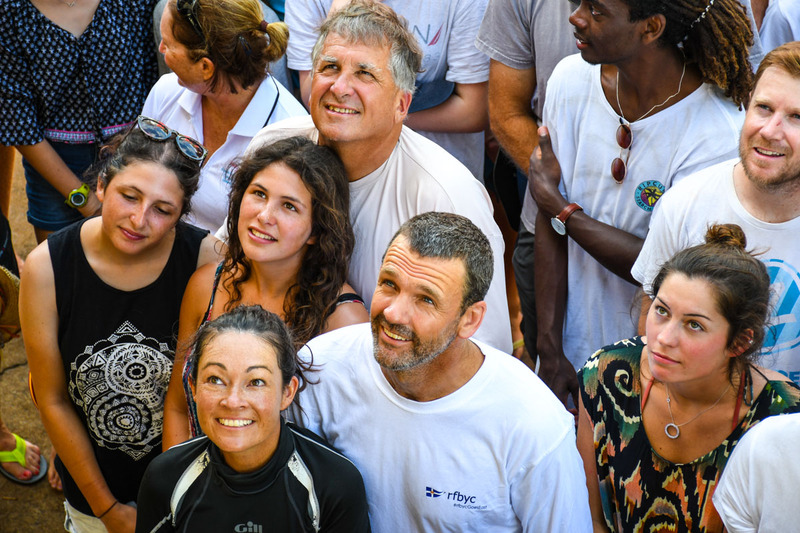 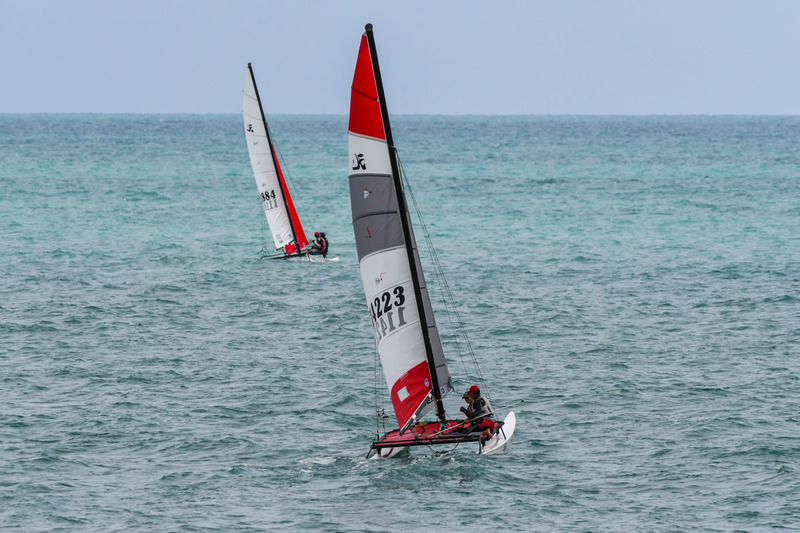 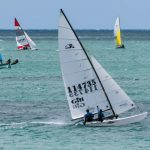 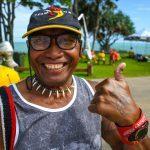 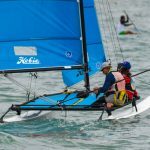 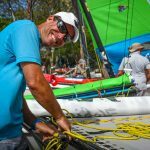 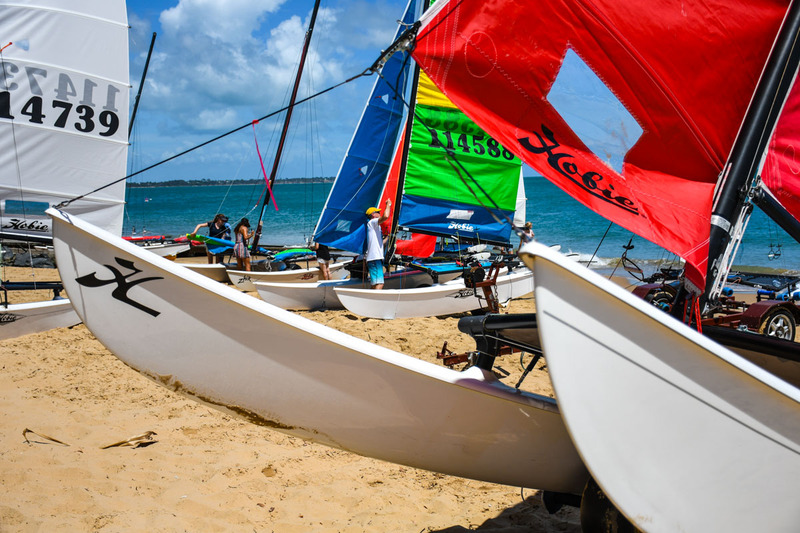 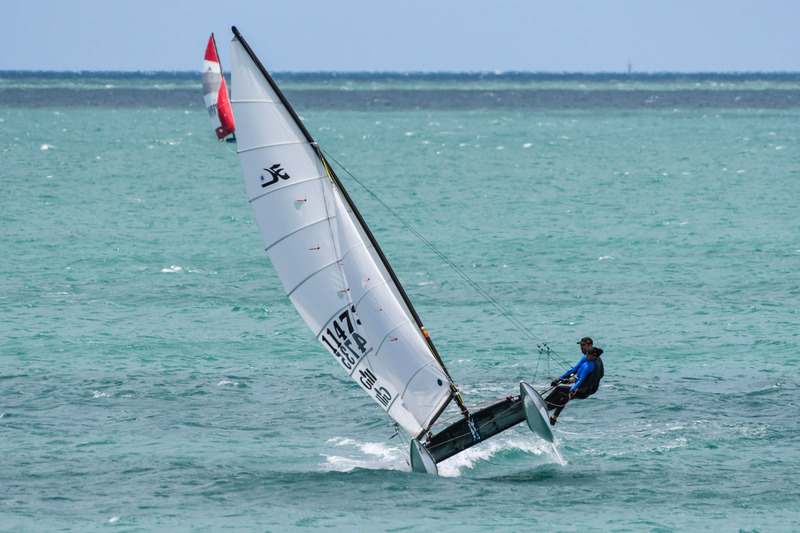 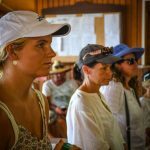 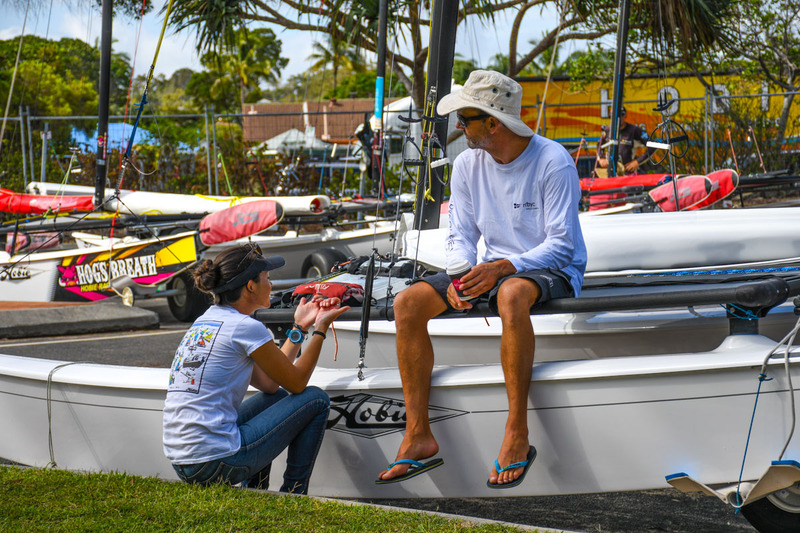 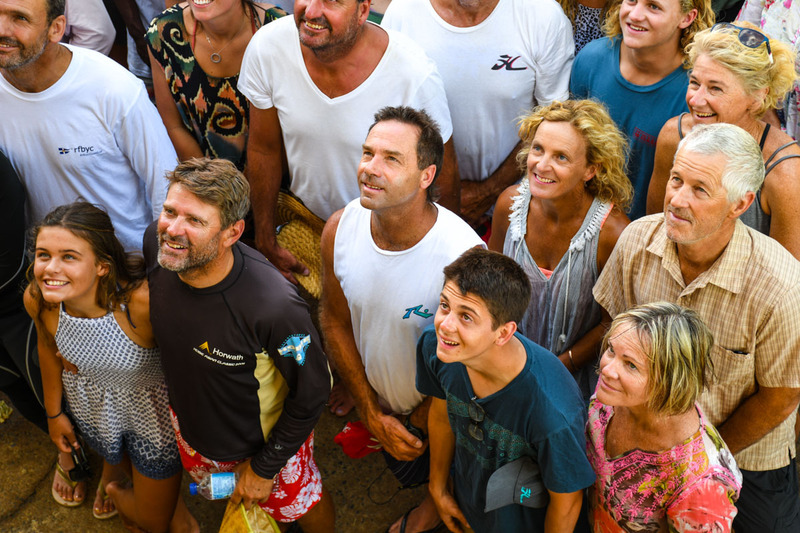 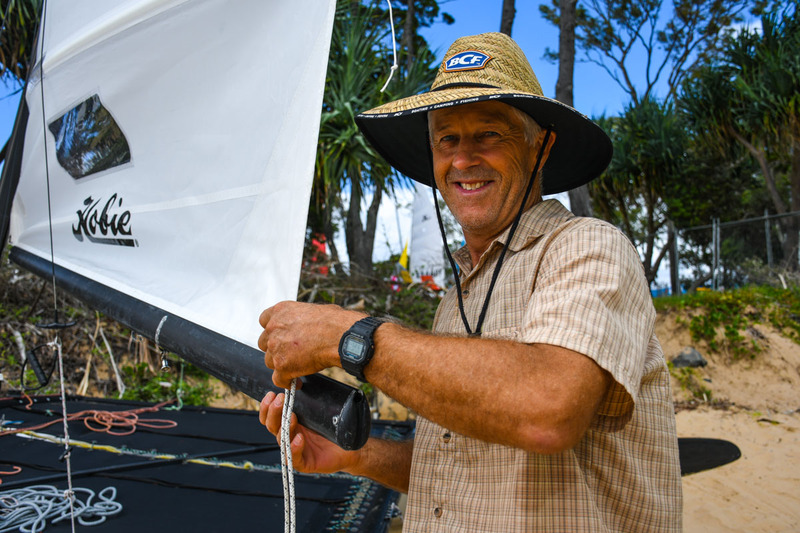 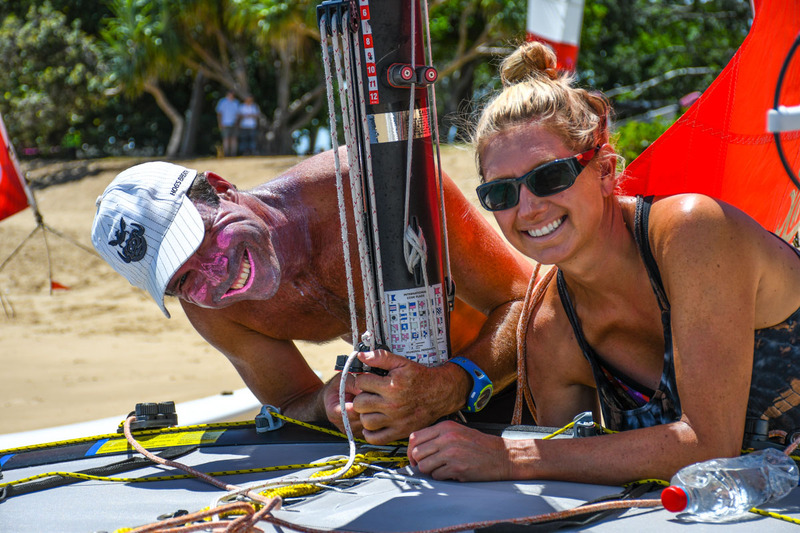 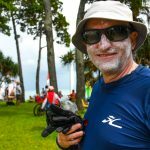 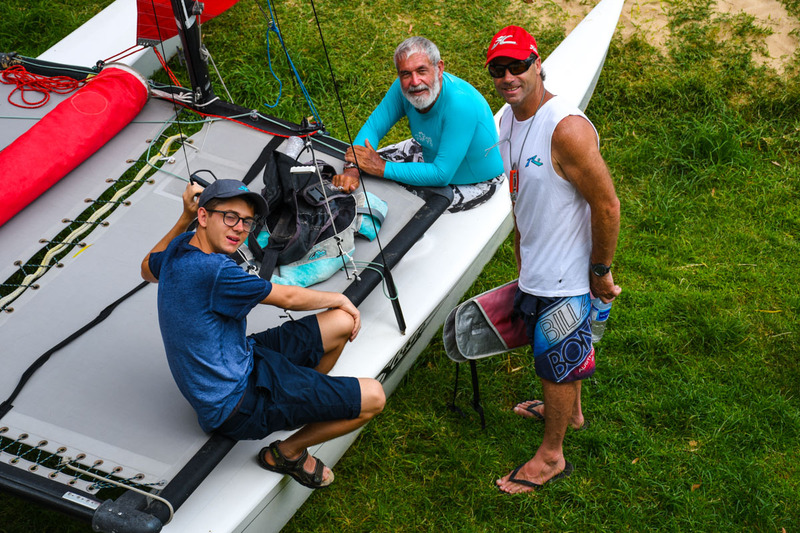 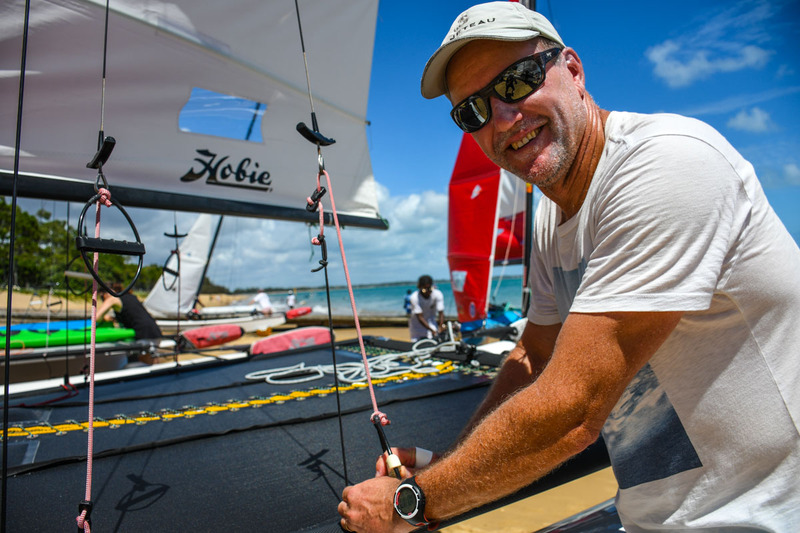 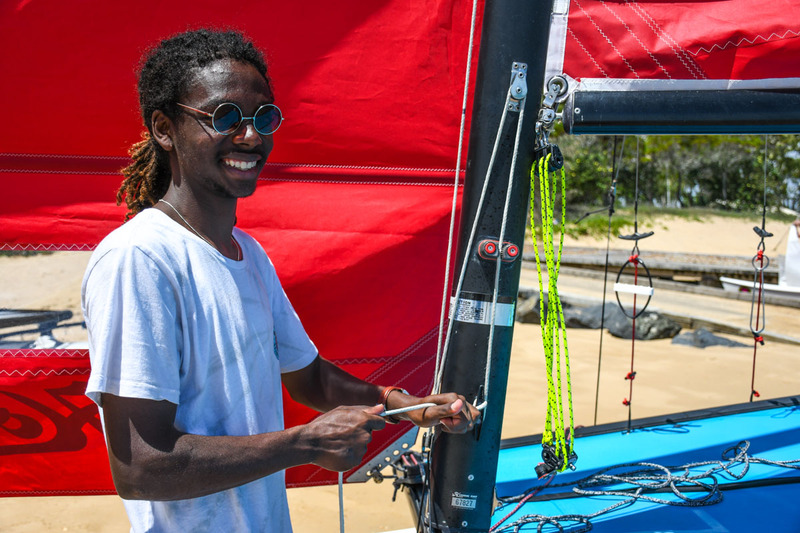 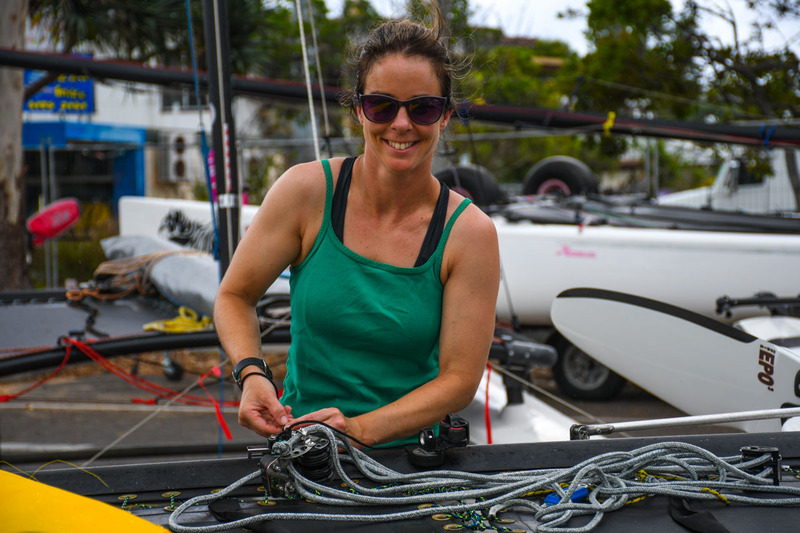 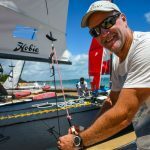 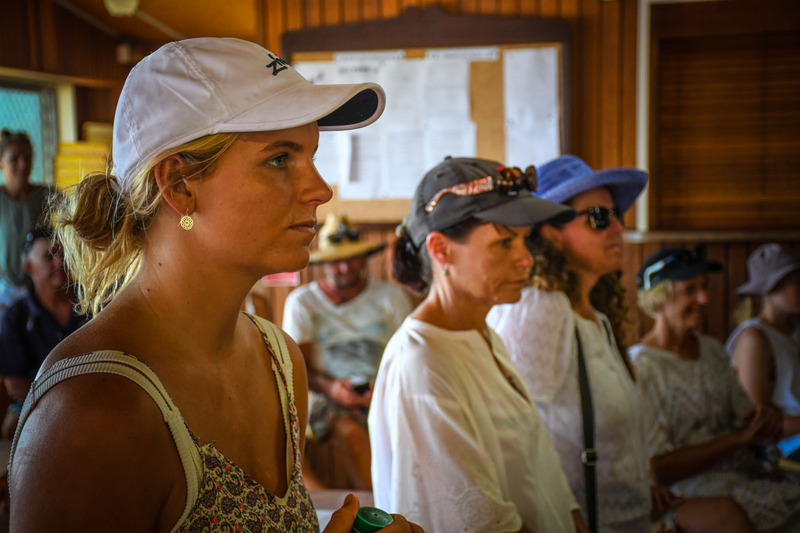 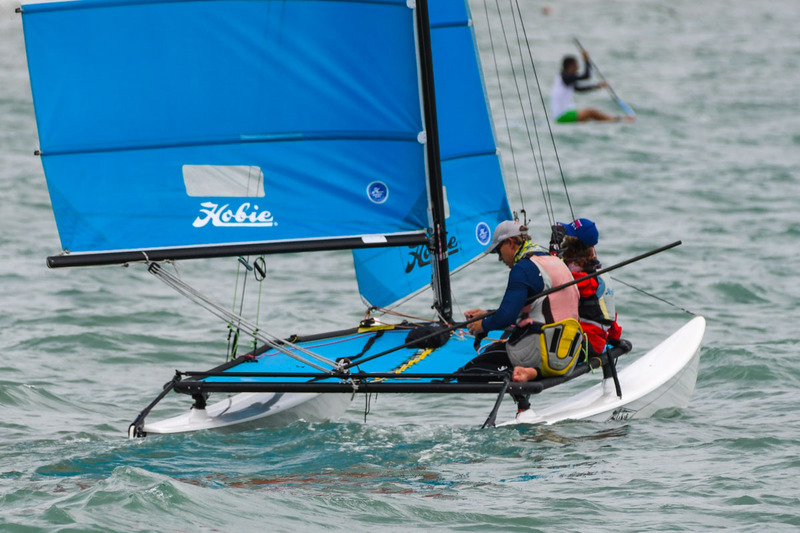 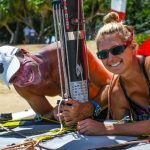 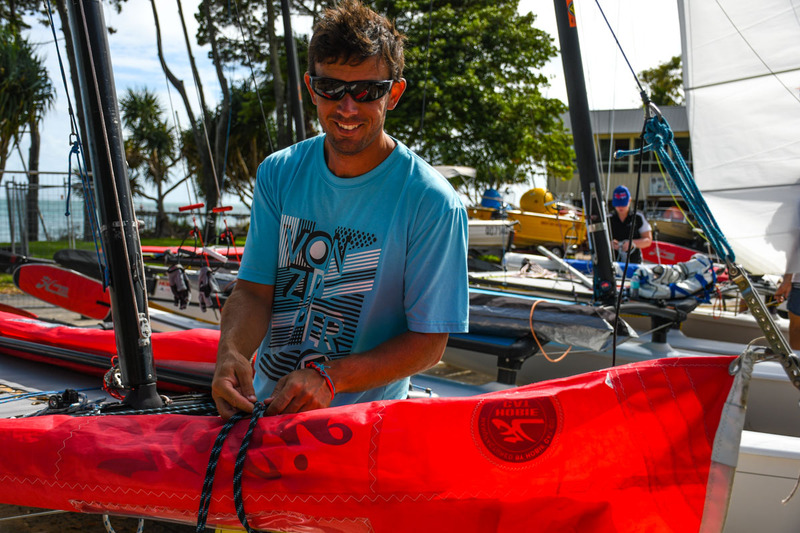 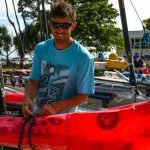 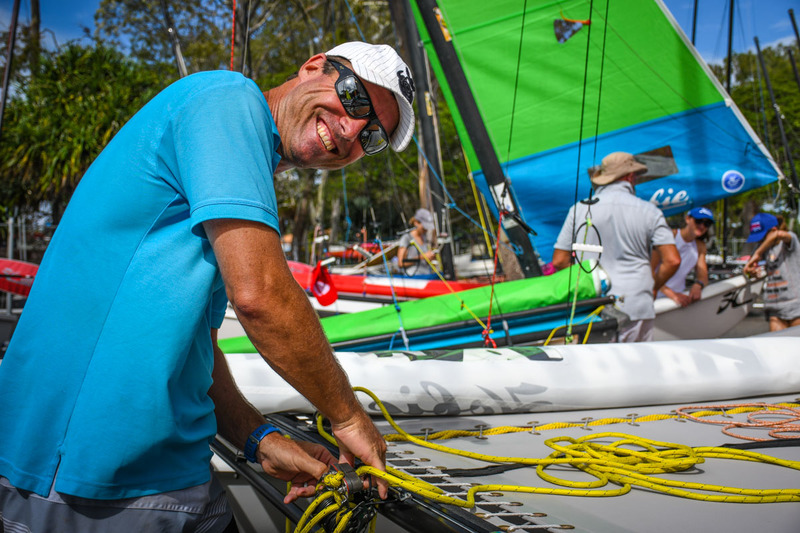 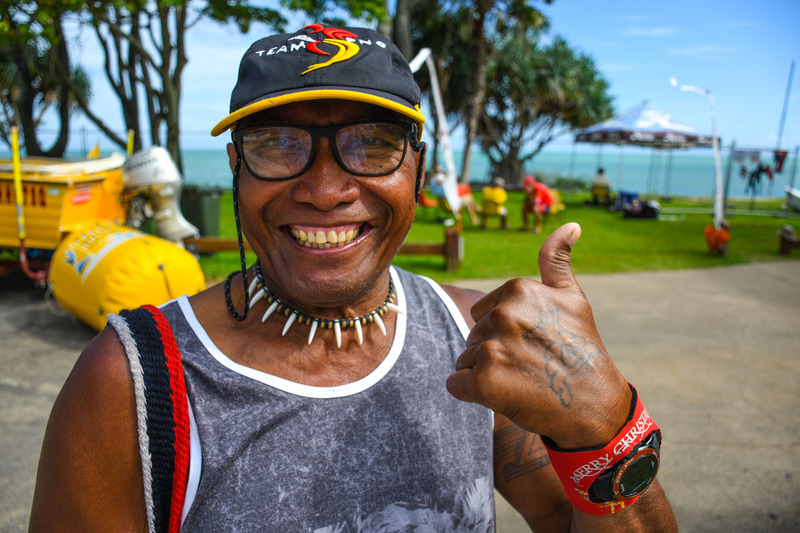 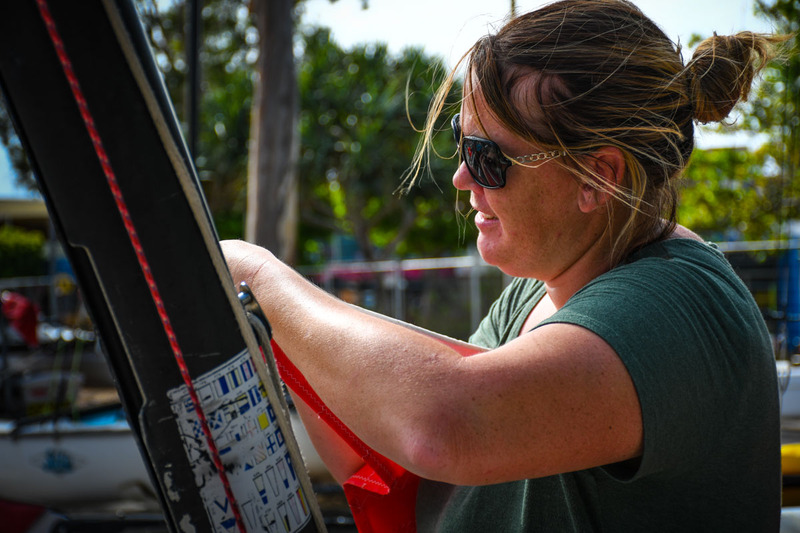 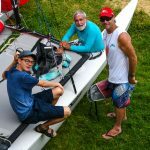 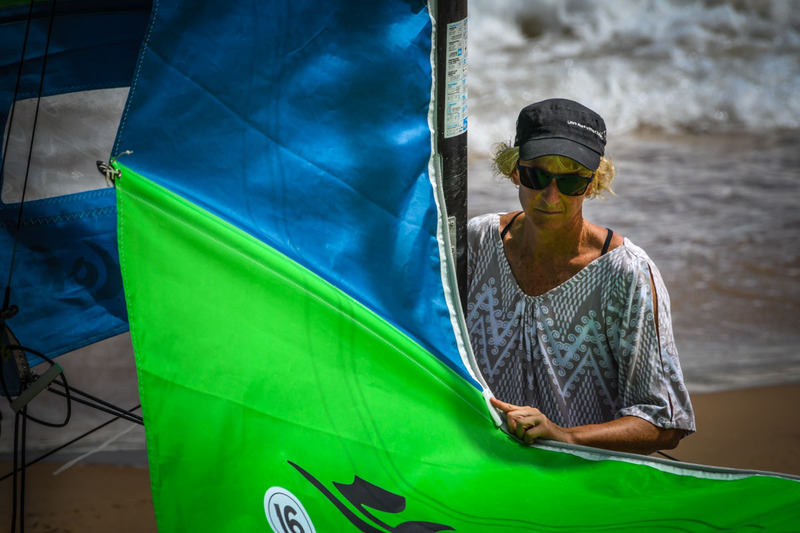 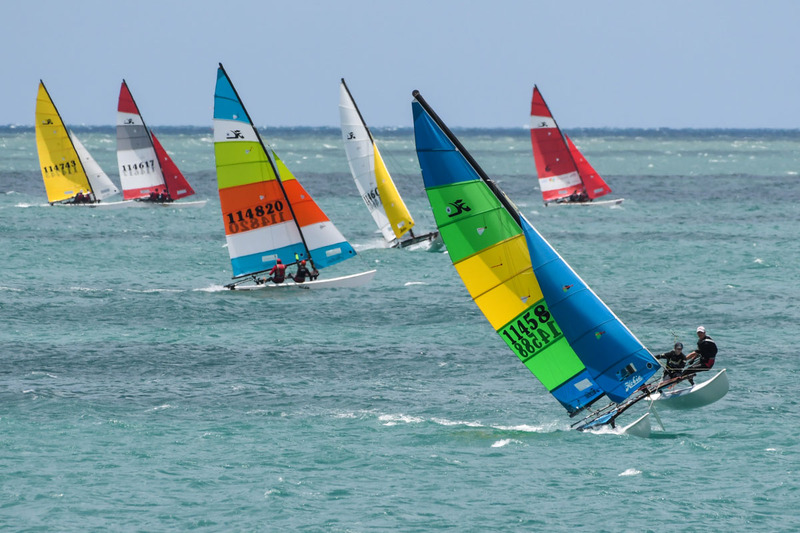 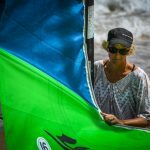 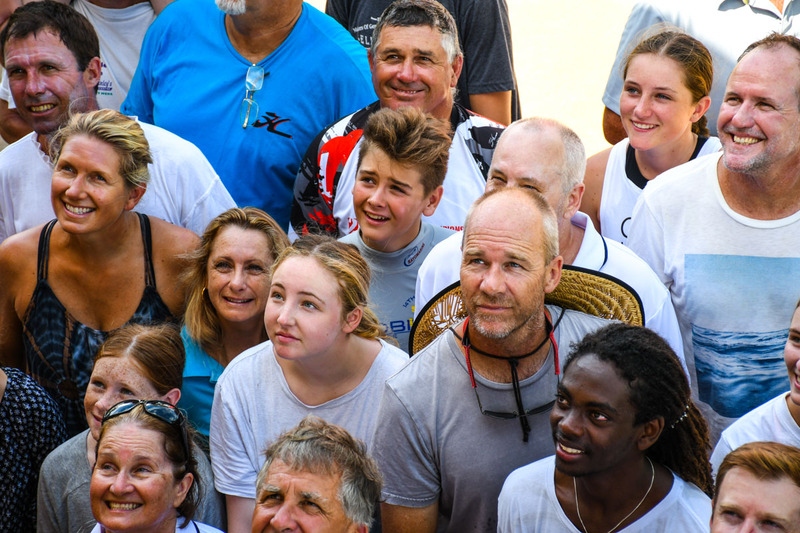 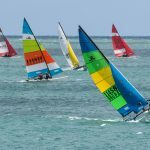 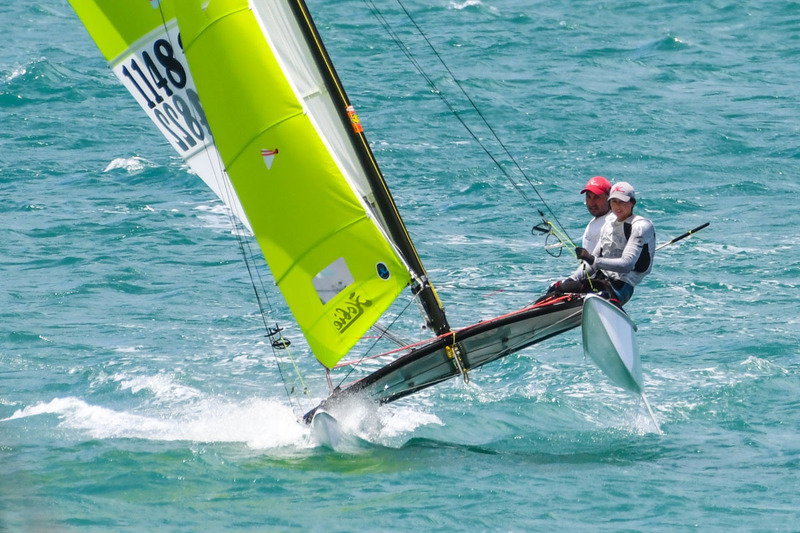 The top six have either won a Hobie 16 Worlds or been a top 10 finisher at a Hobie 16 Worlds. 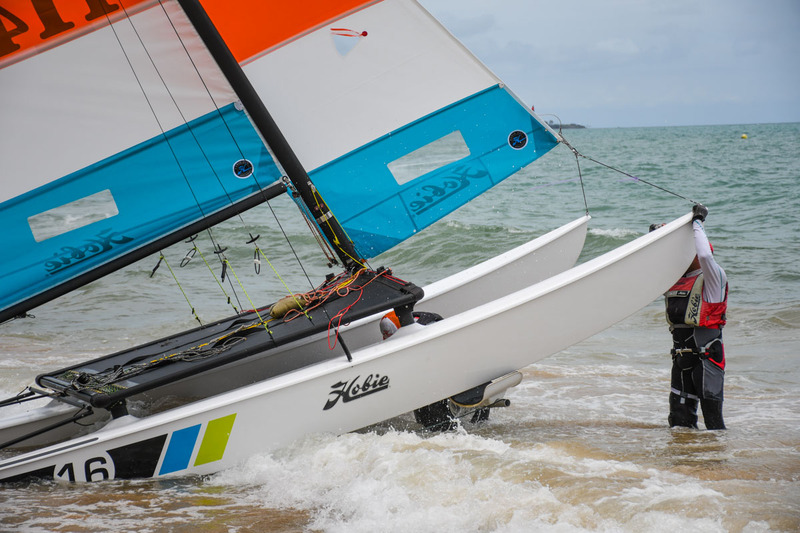 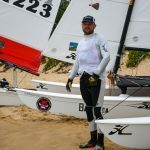 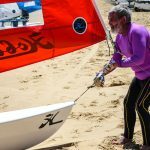 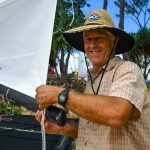 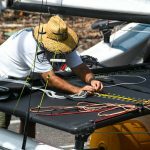 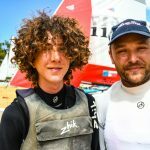 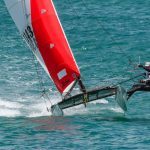 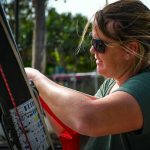 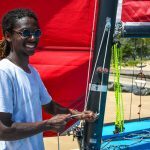 Making this a very competitive Hobie 16 Fleet. 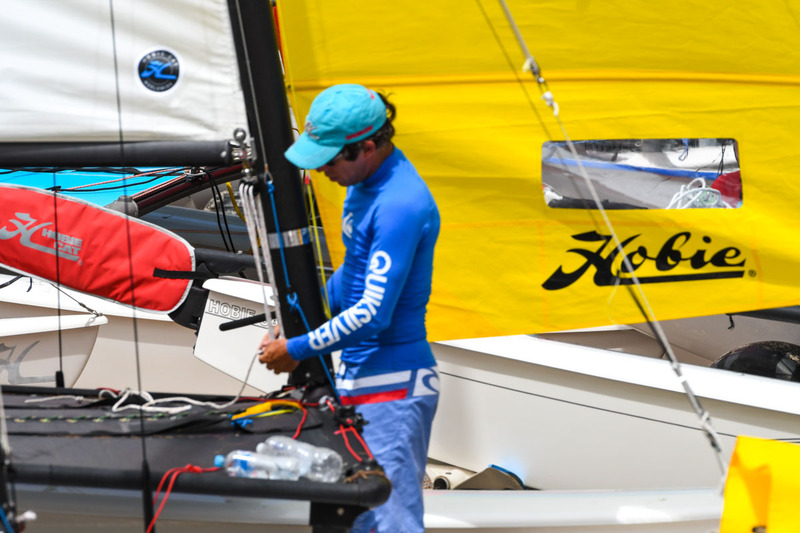 Racing continues tomorrow. 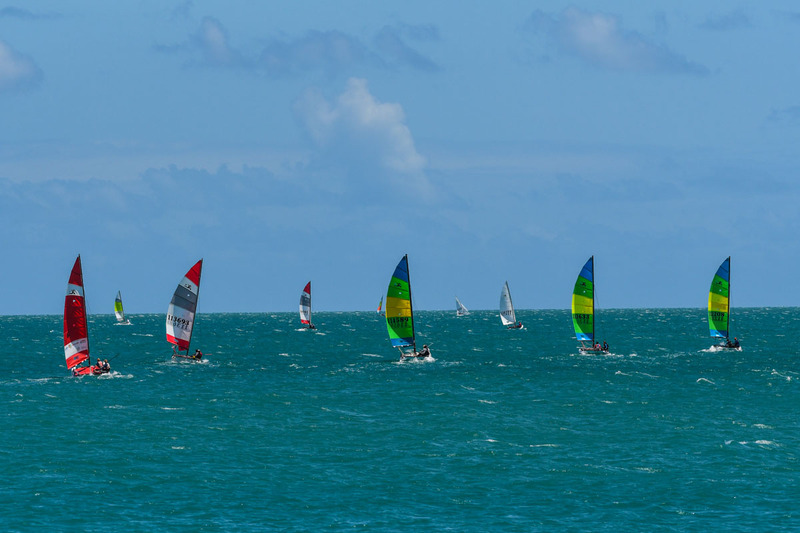 Weather forecasts predicting on the wind being the same or slightly lighter. 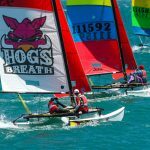 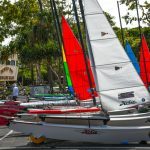 So it will be all action on the Hobie course. 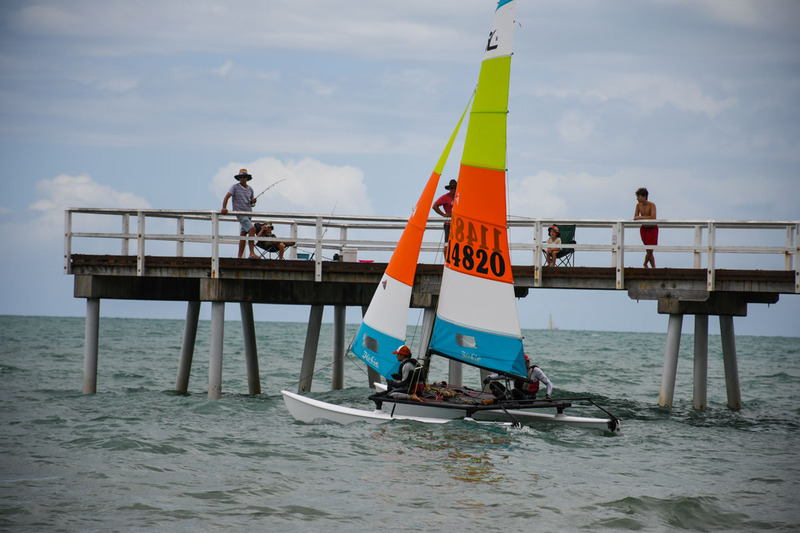 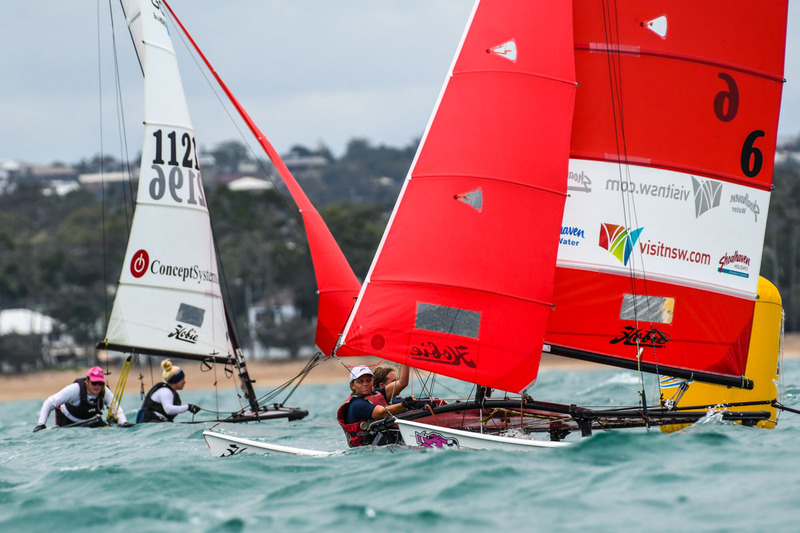 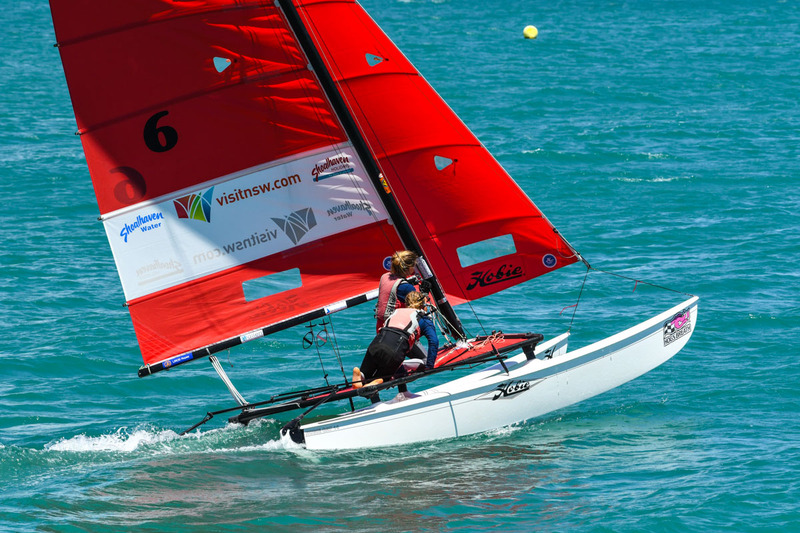 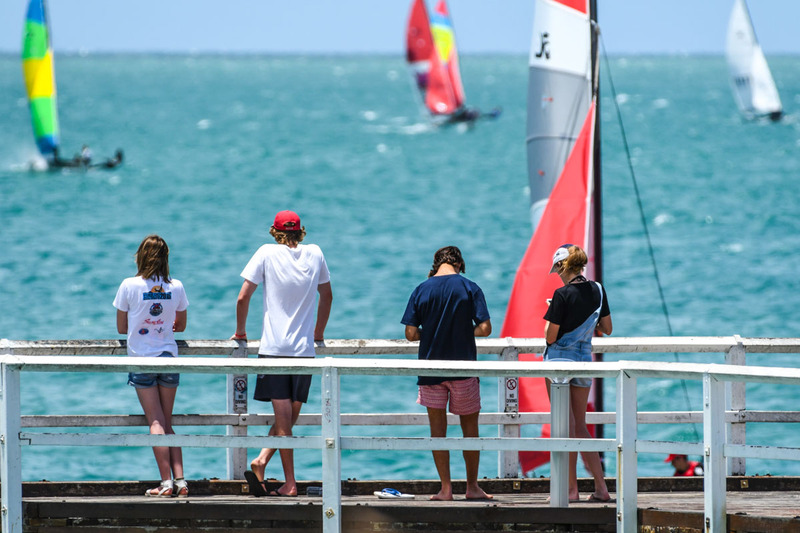 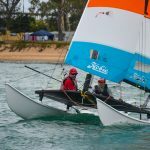 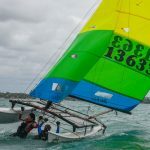 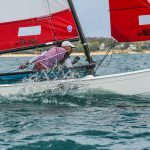 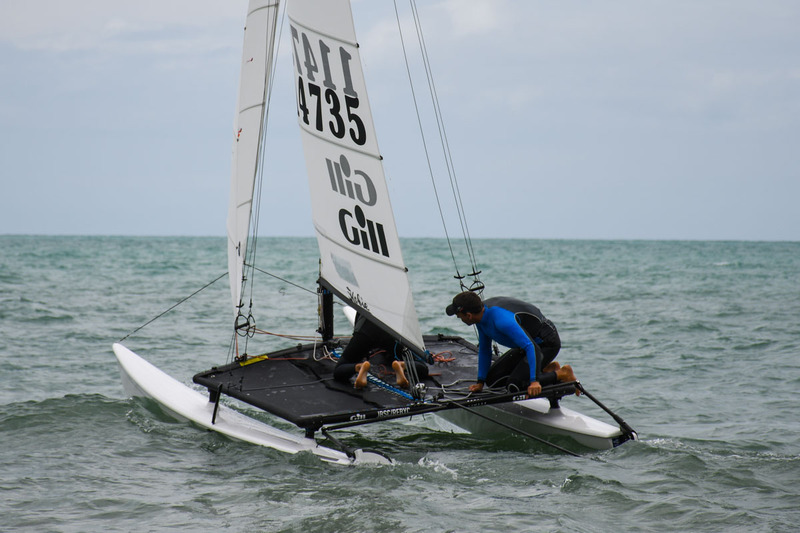 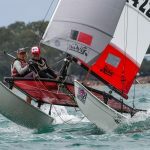 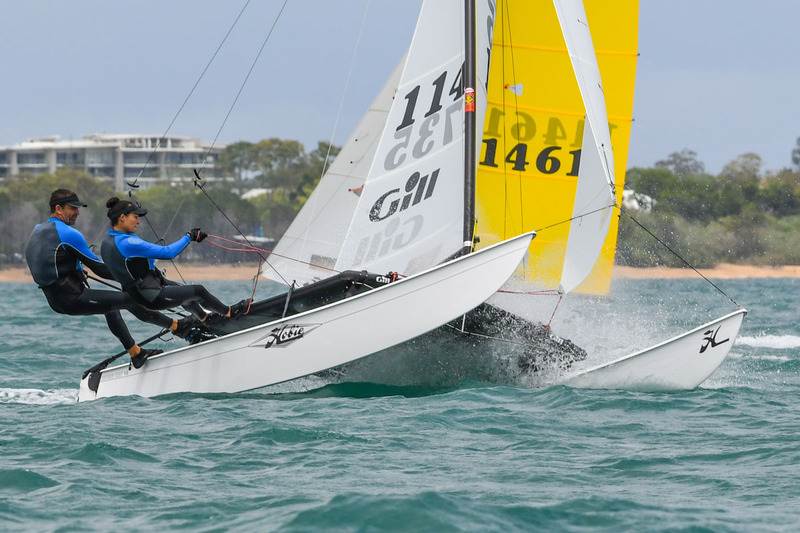 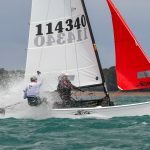 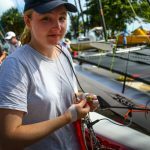 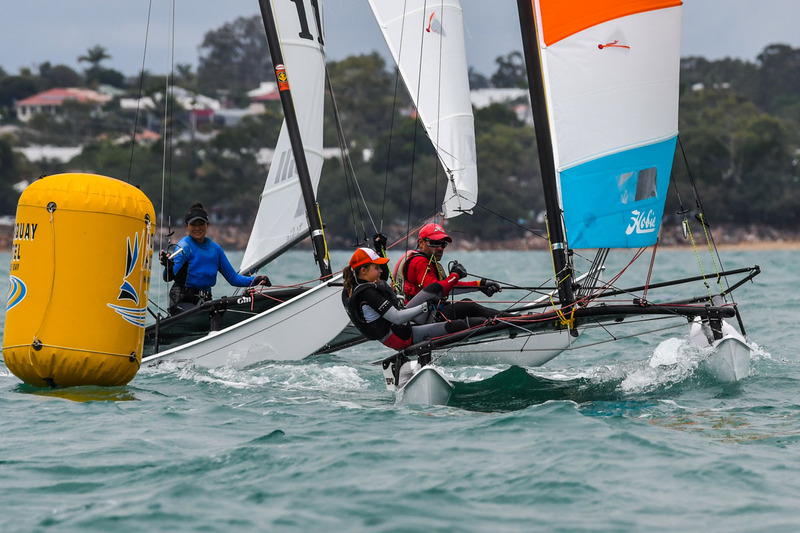 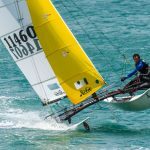 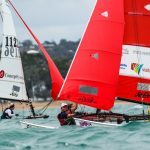 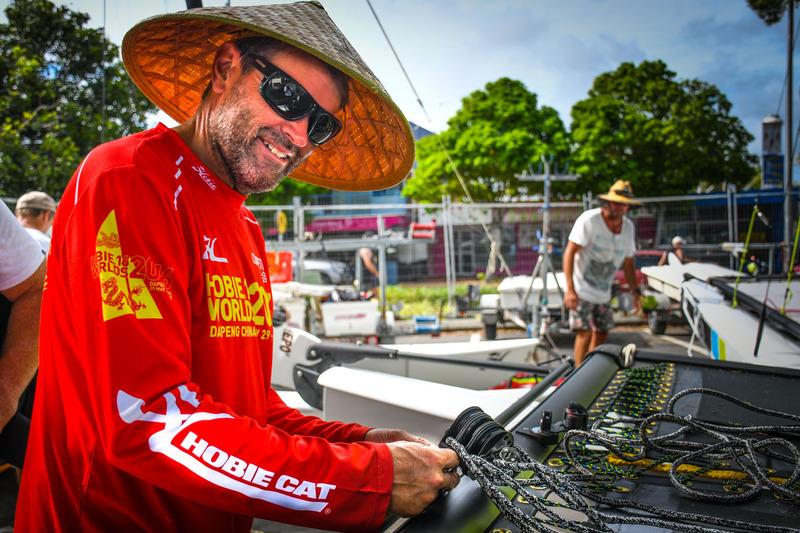 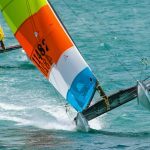 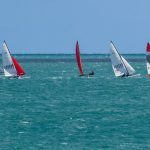 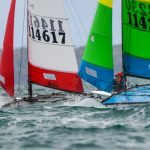 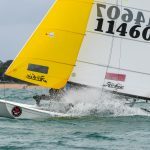 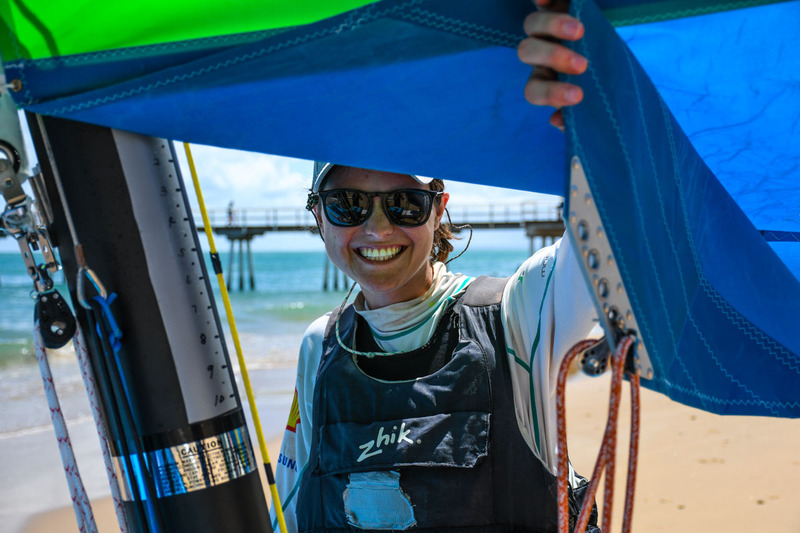 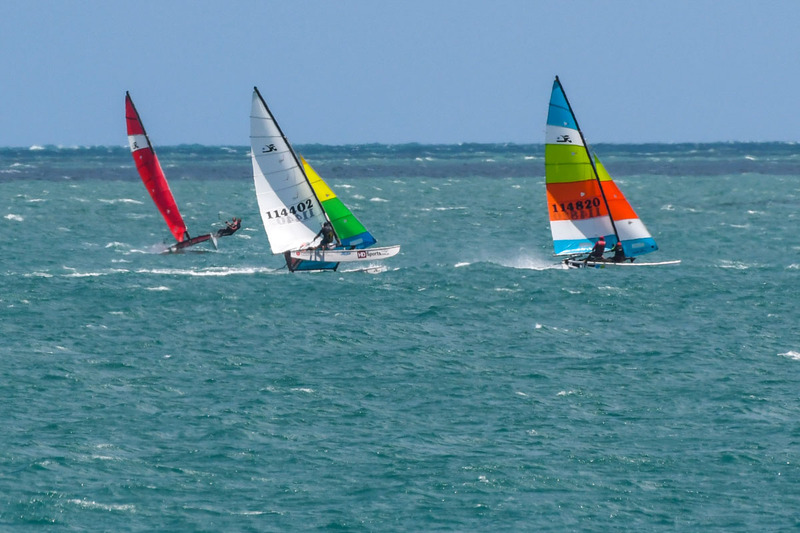 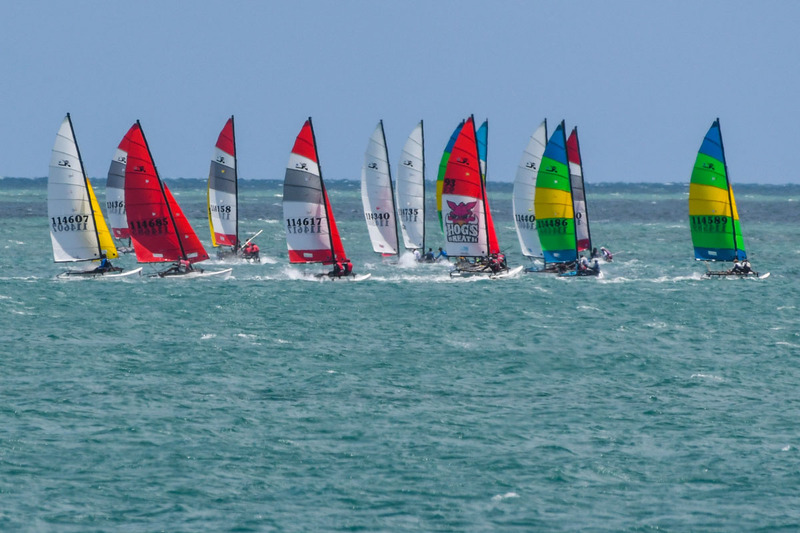 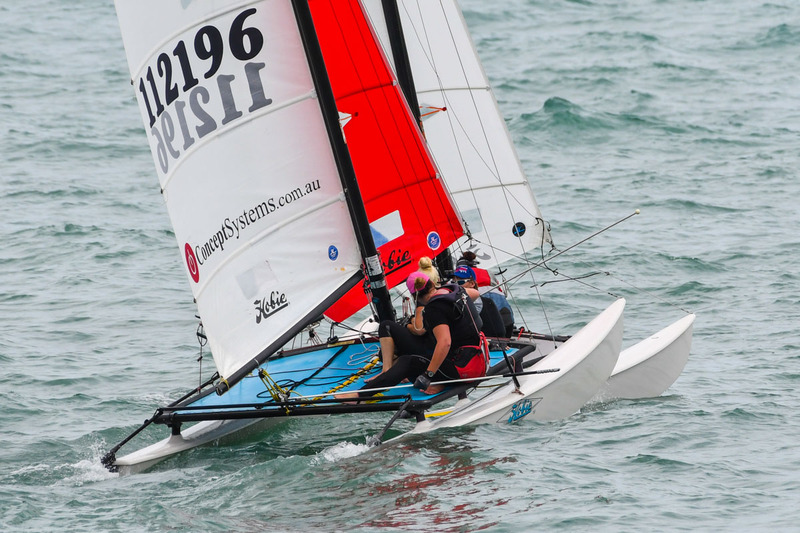 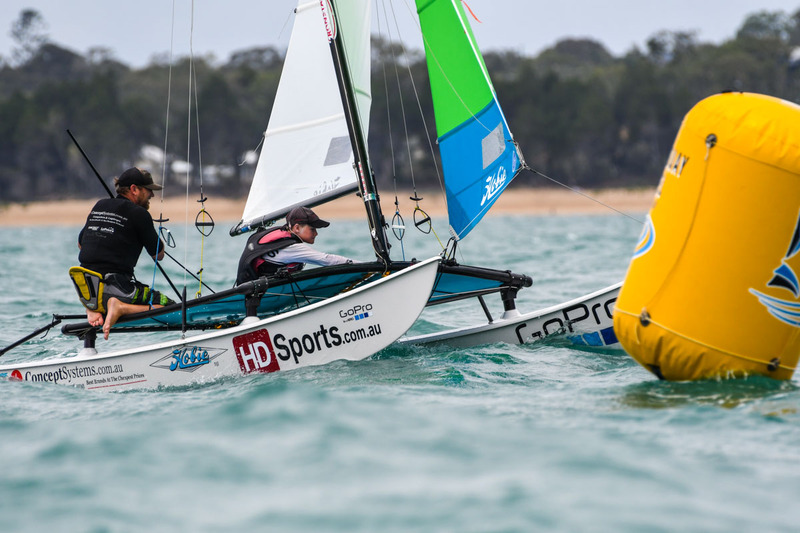 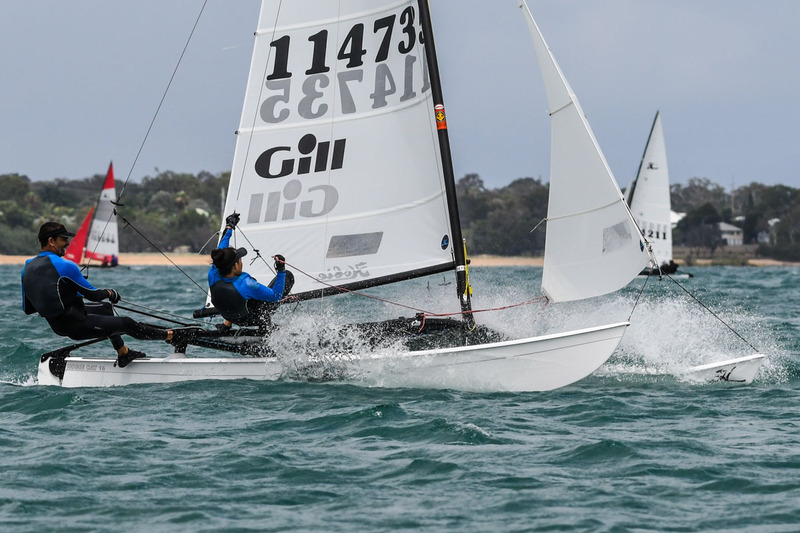 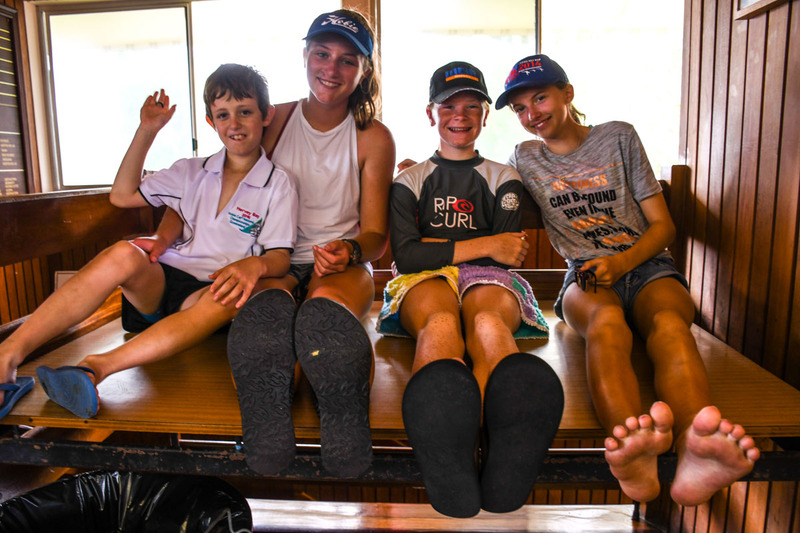 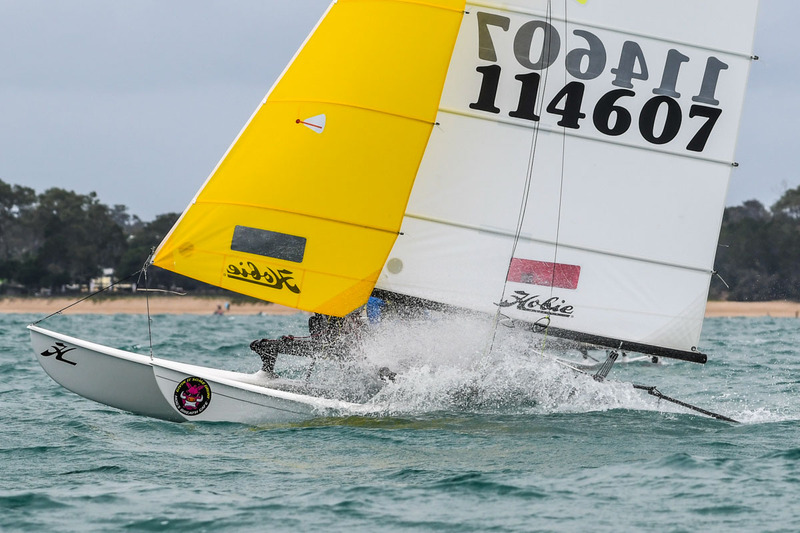 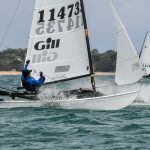 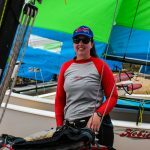 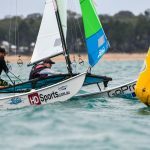 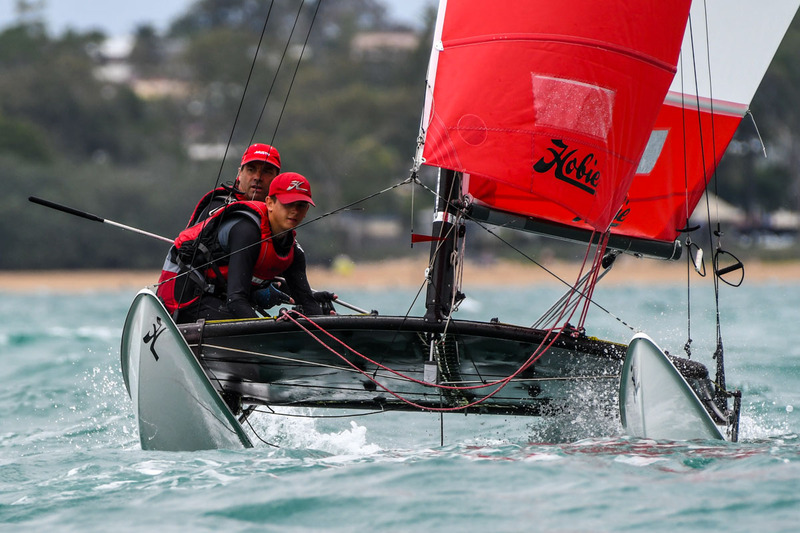 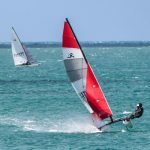 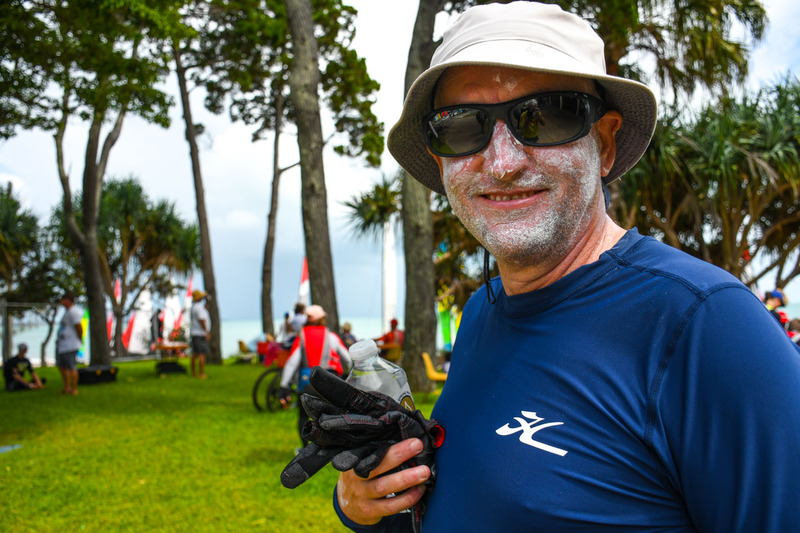 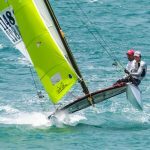 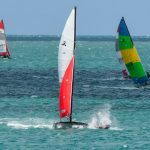 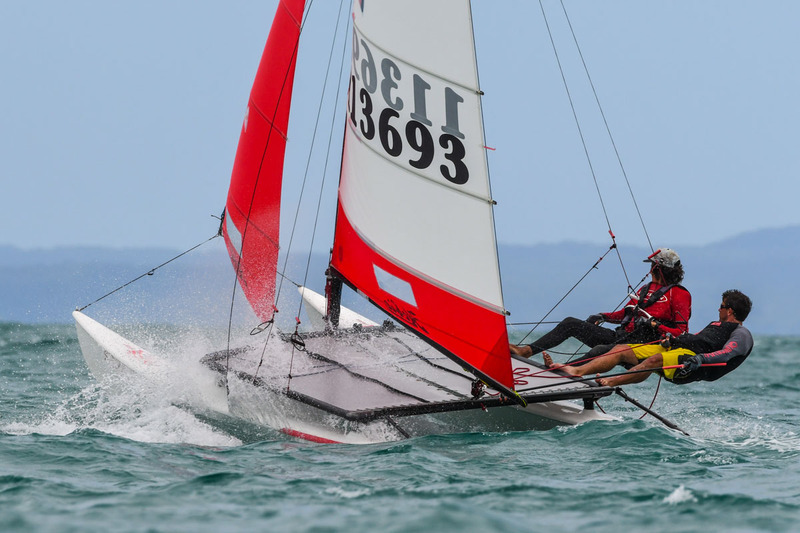 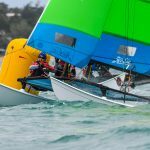 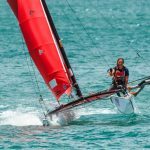 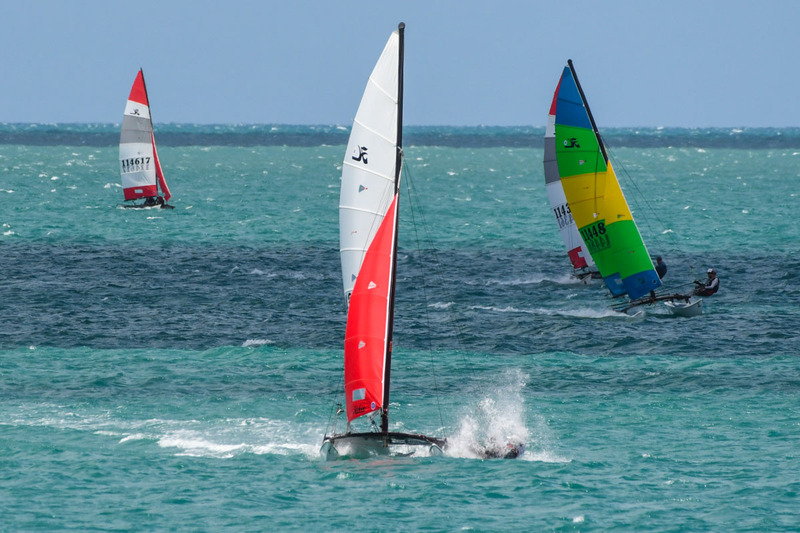 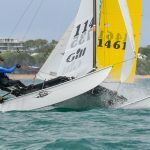 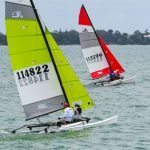 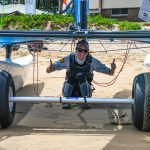 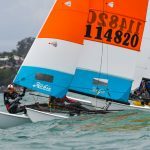 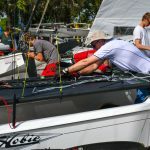 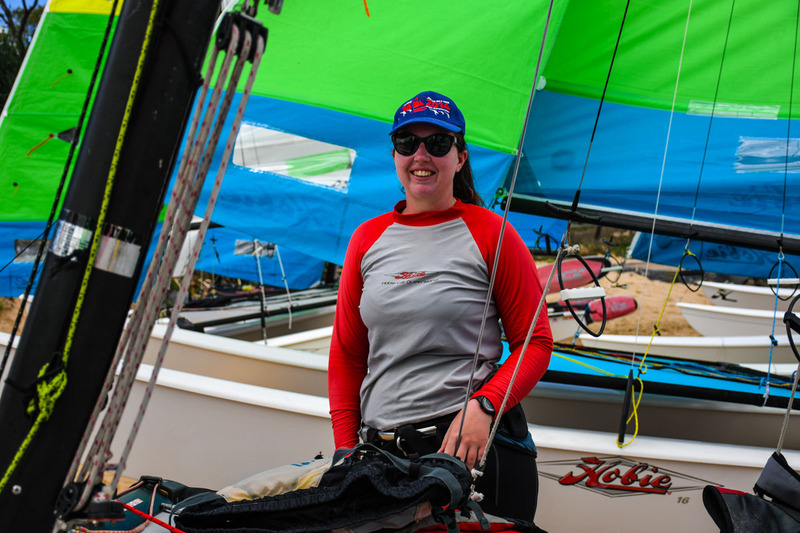 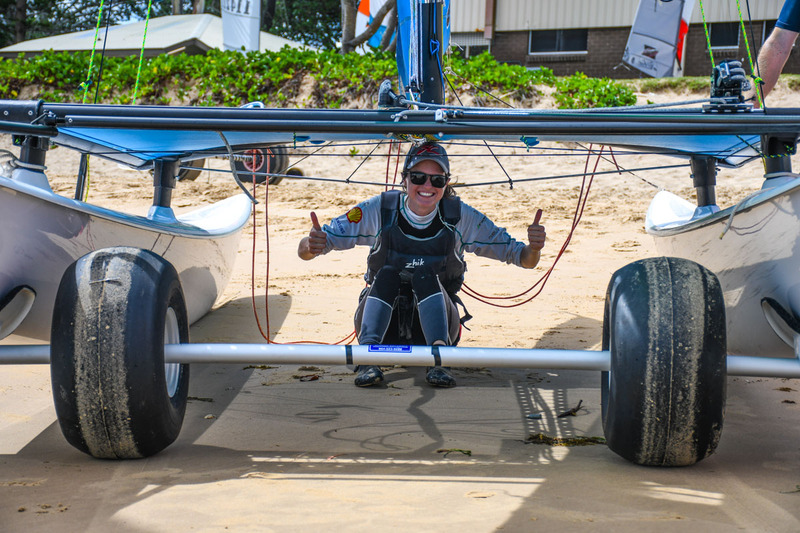 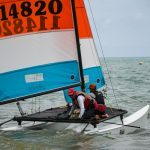 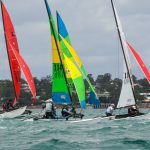 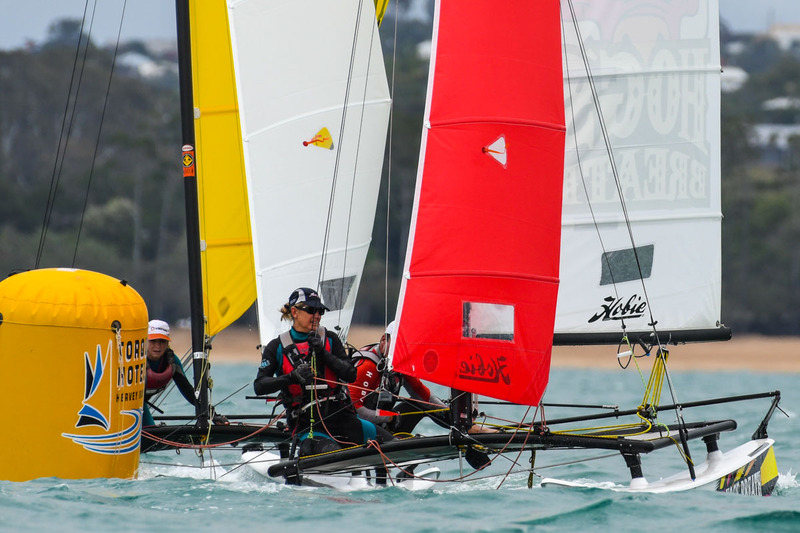 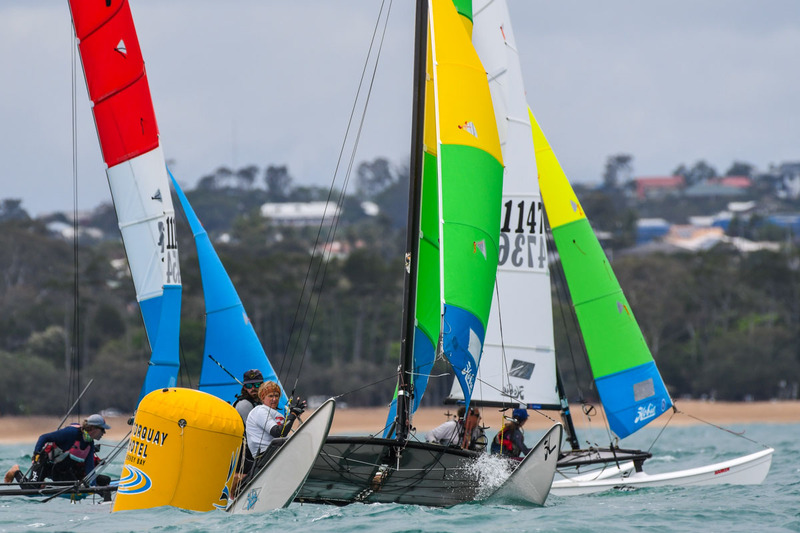 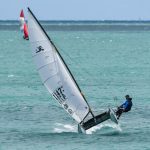 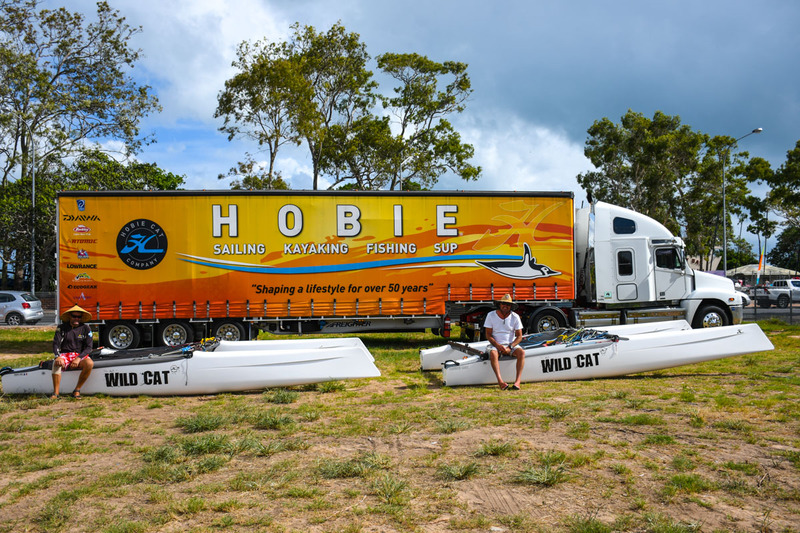 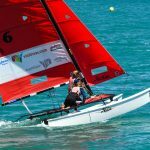 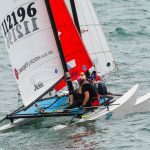 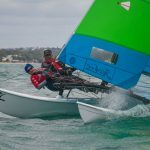 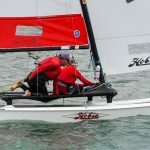 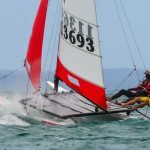 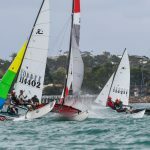 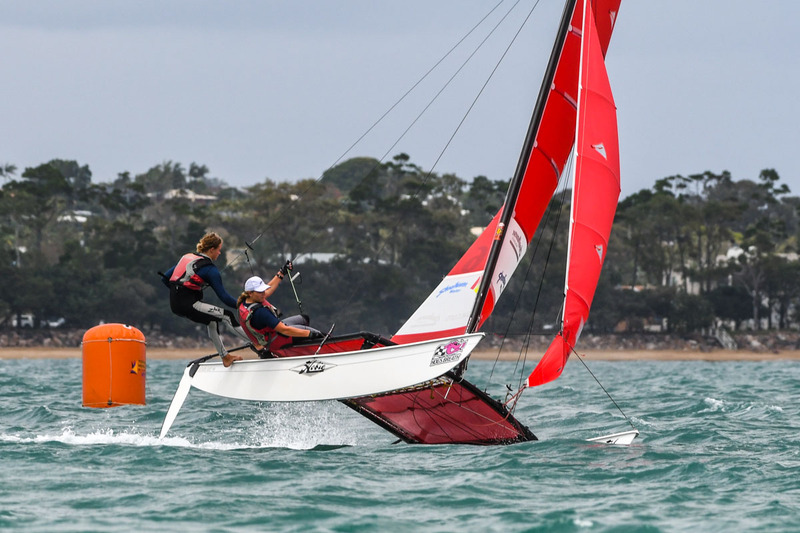 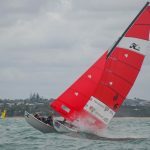 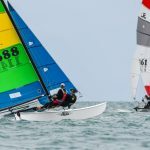 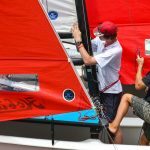 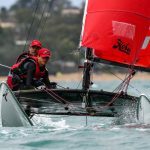 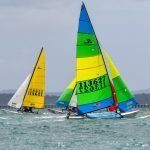 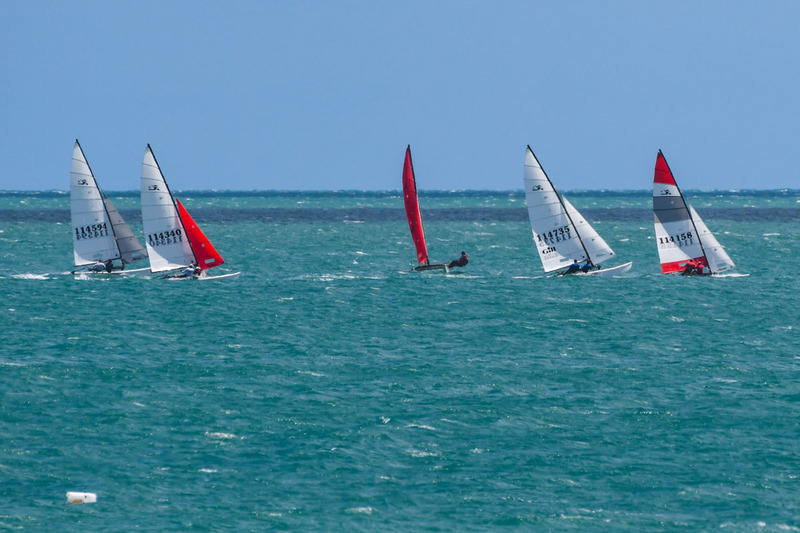 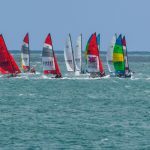 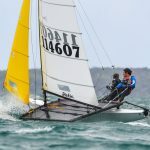 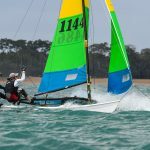 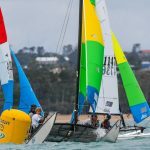 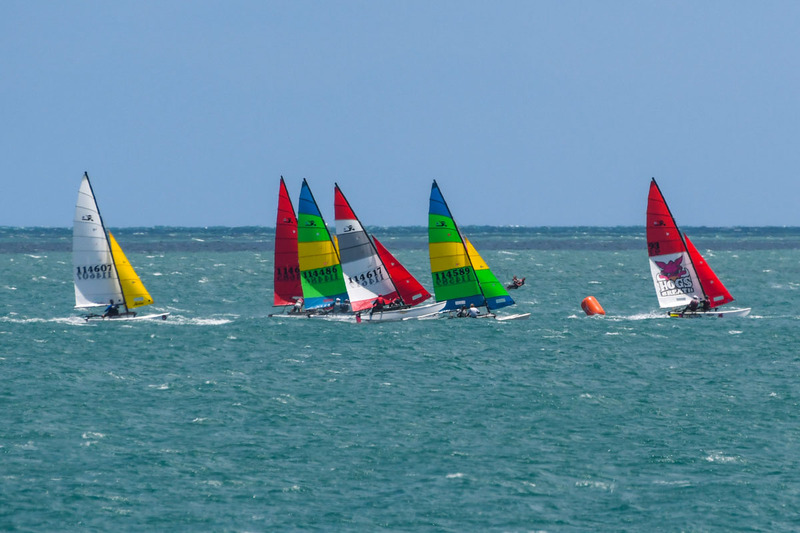 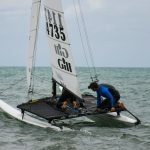 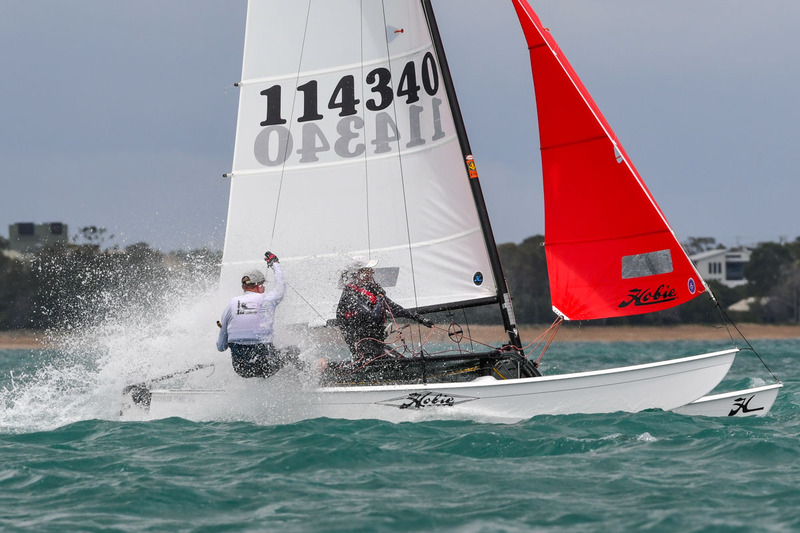 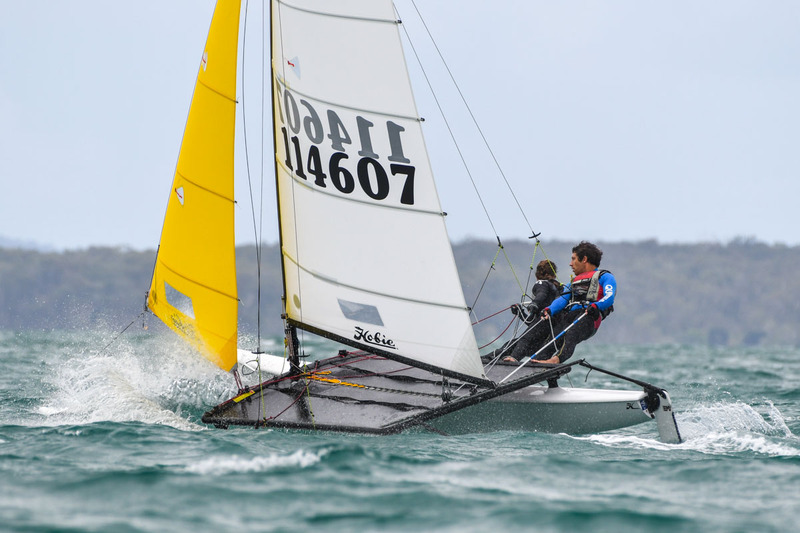 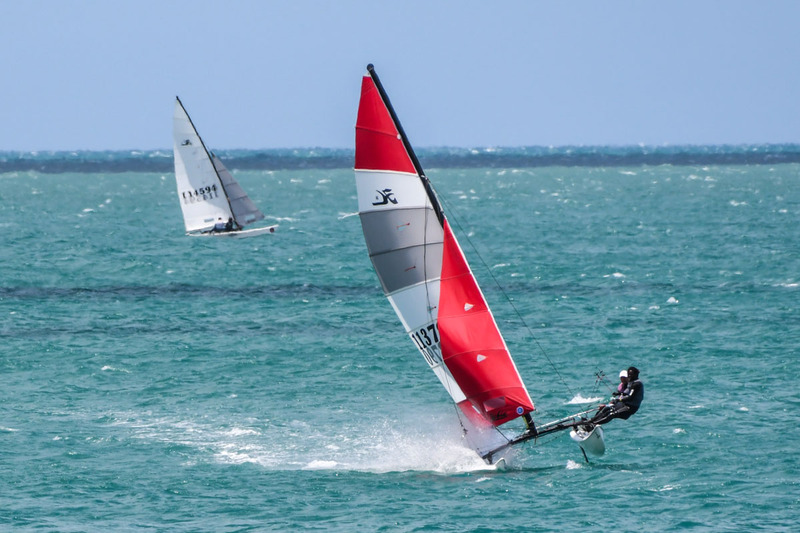 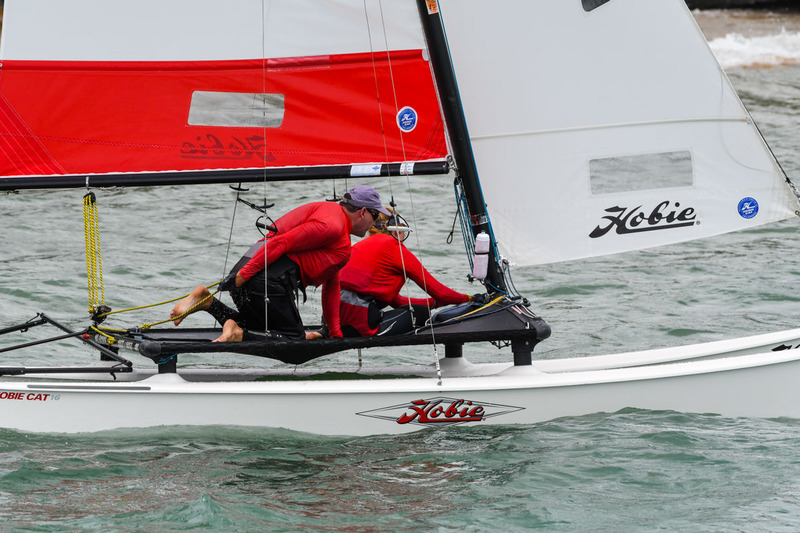 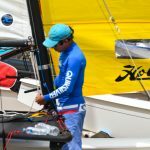 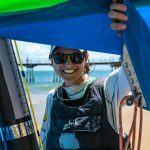 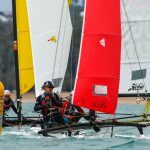 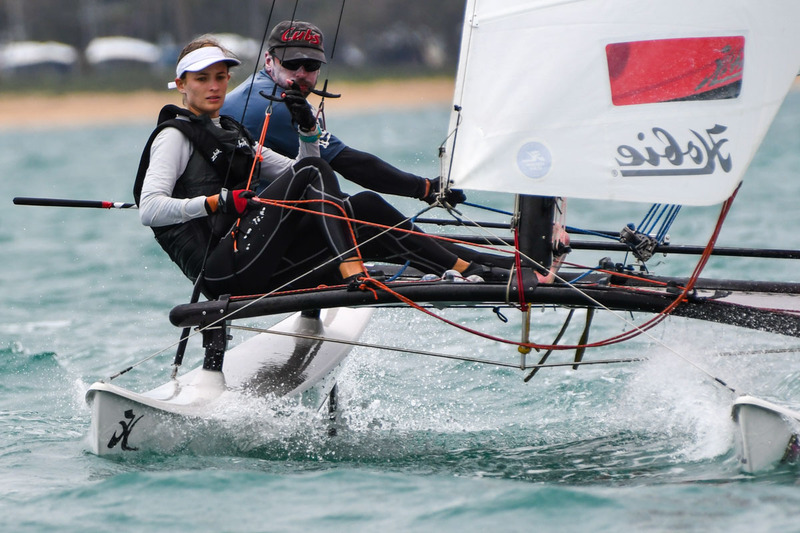 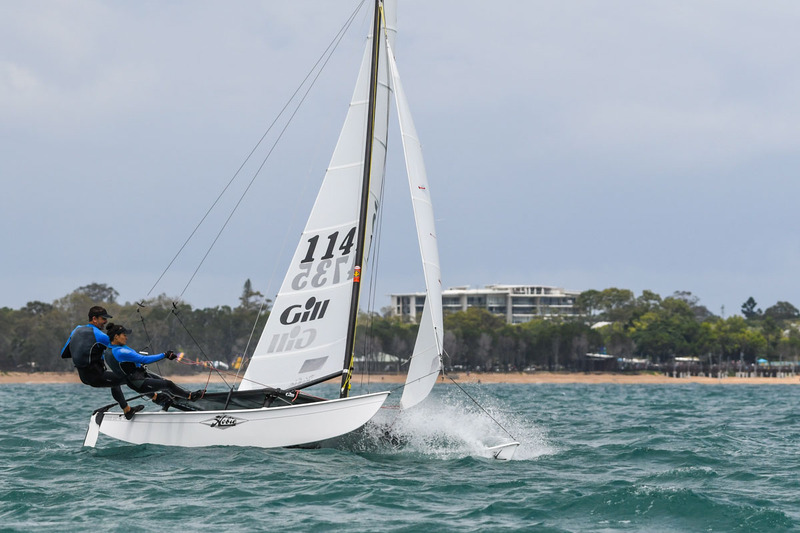 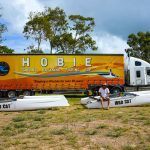 It was another action packed day for the Hobie 16 sailors at Hervey Bay. 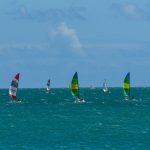 The breeze was back again today. 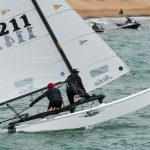 The first race of the day was started in 16-18 knots gusting up to 22 knots. 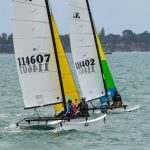 This was the weather some fo the Hobie 16 sailors had been wishing for. 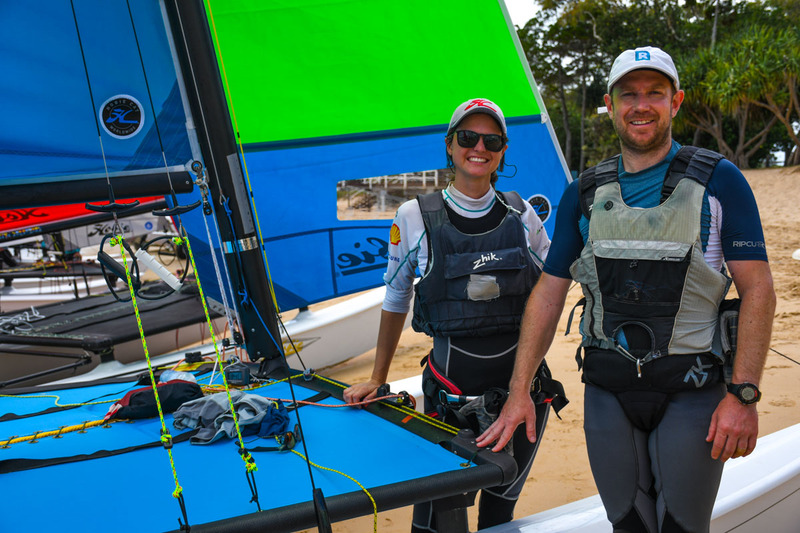 Andrew Keag and Helen Warneke won the race but it was a tight battle up the front with leaders swapping places every round. 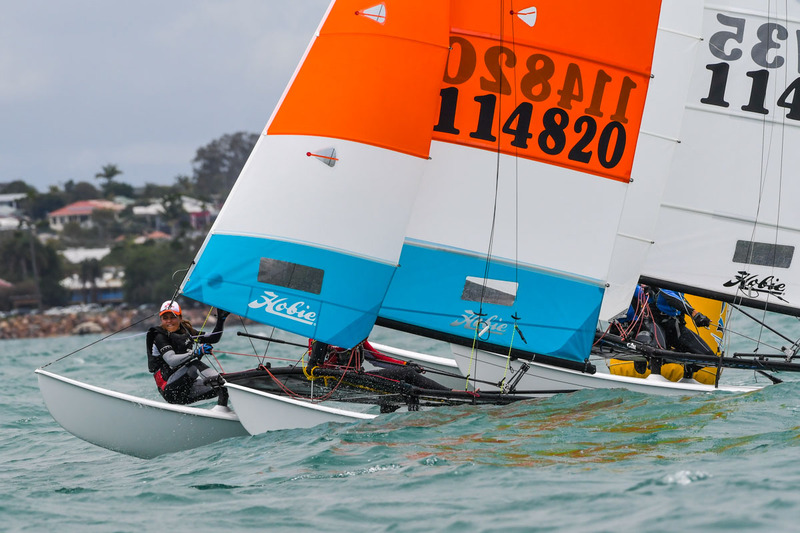 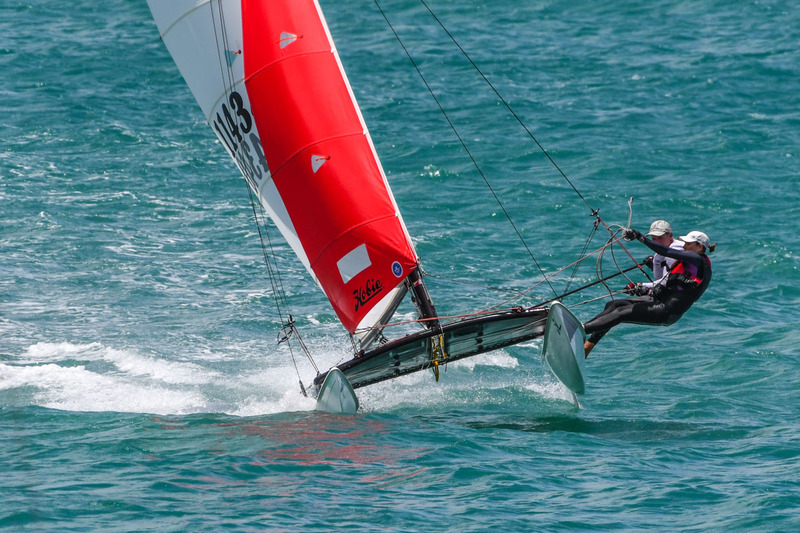 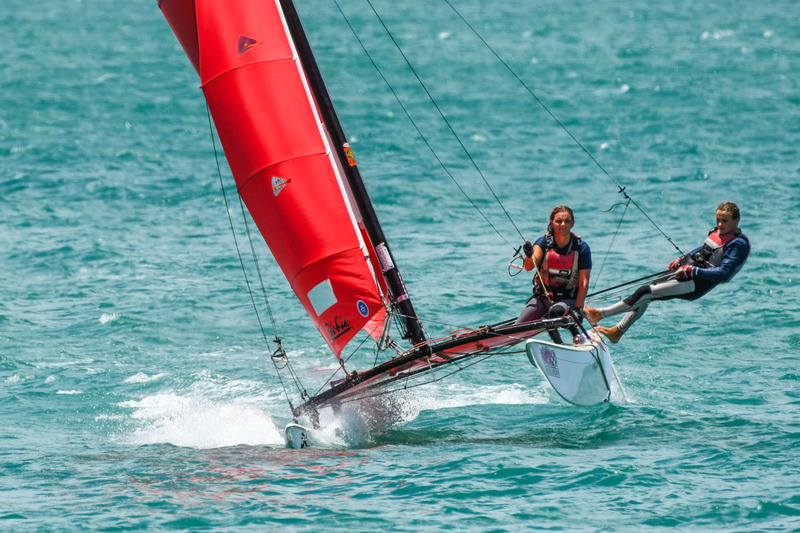 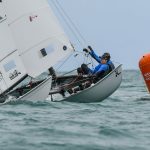 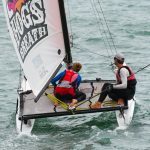 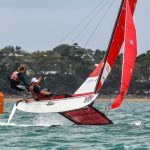 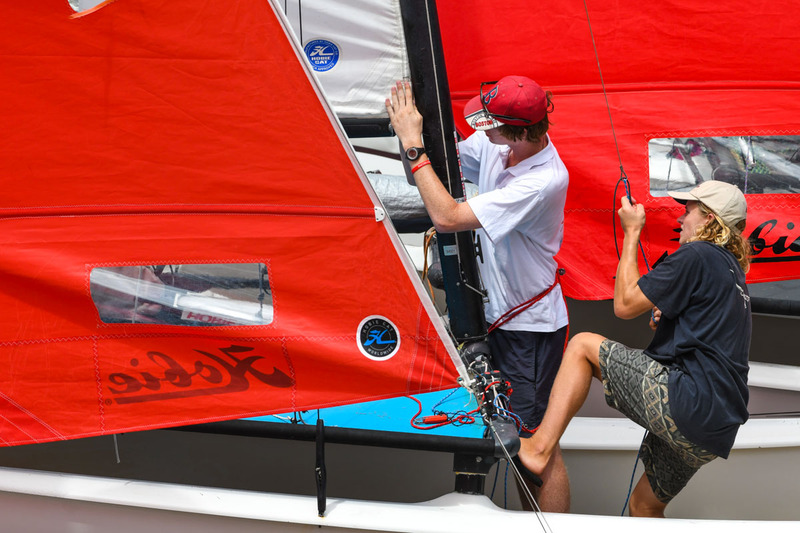 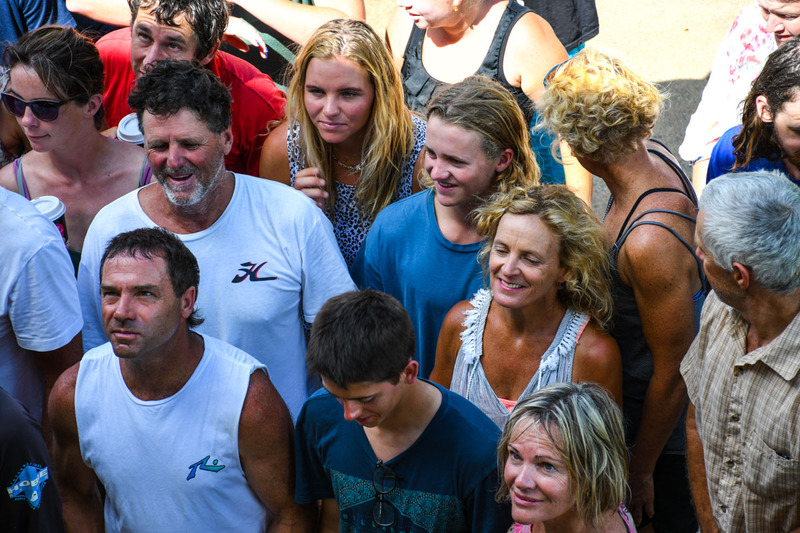 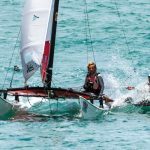 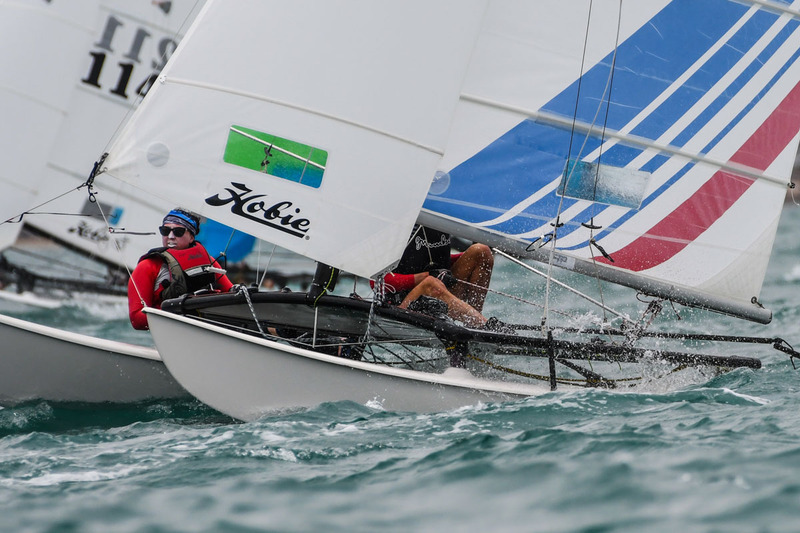 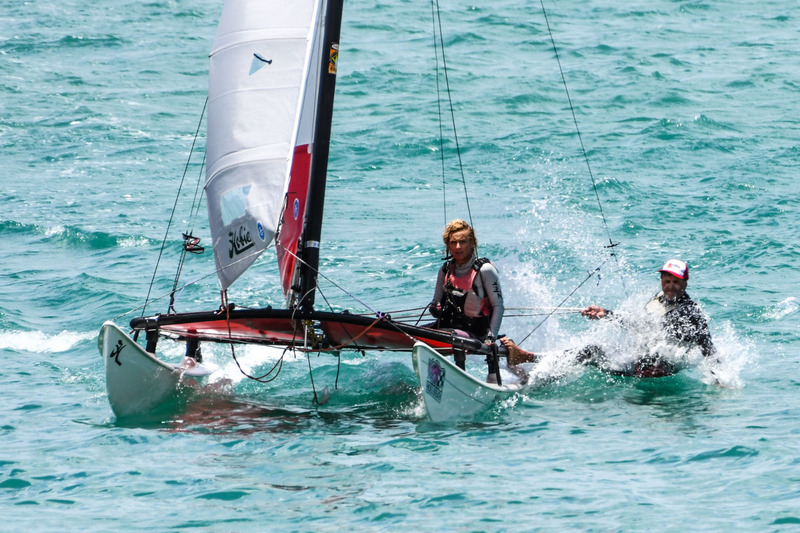 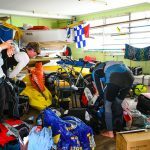 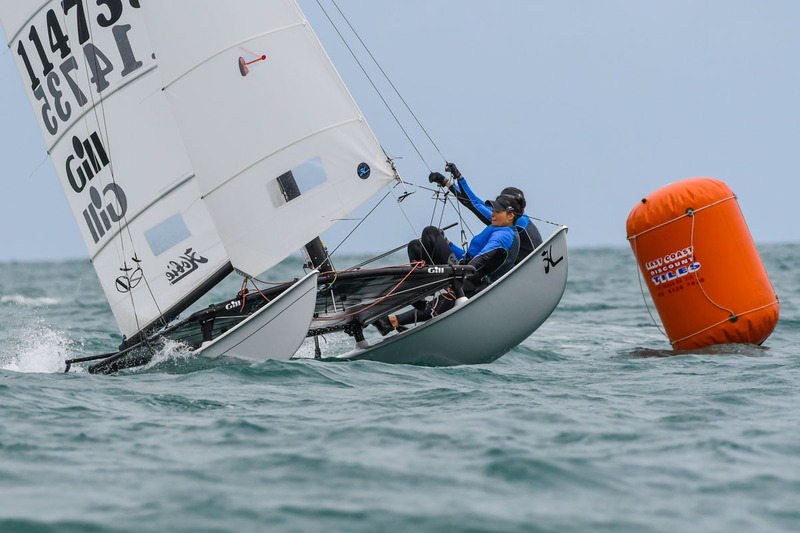 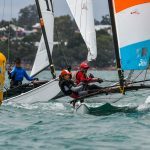 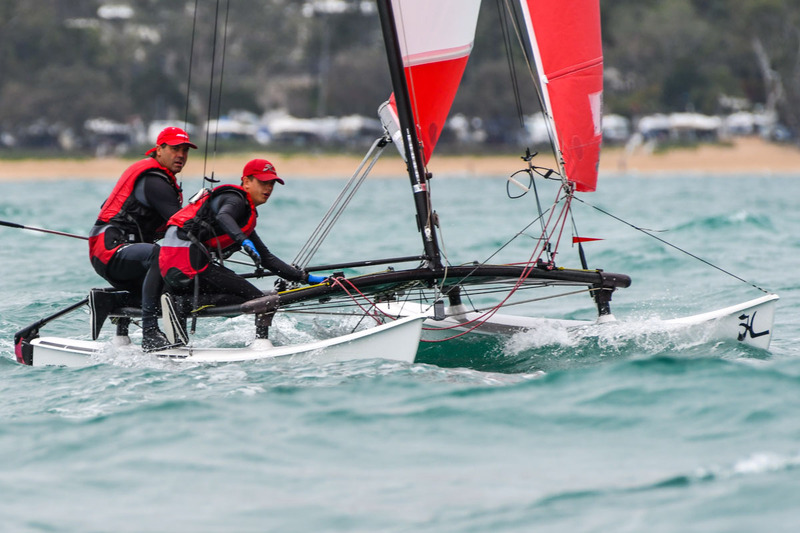 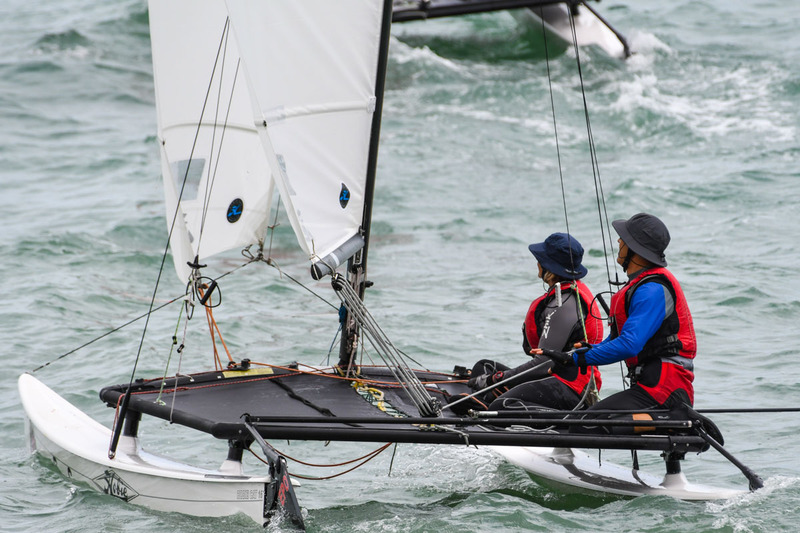 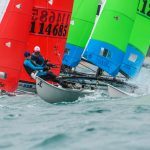 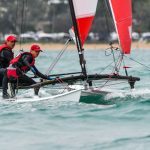 Cam Owen and Suzzie Ghent had their worst race of the regatta. 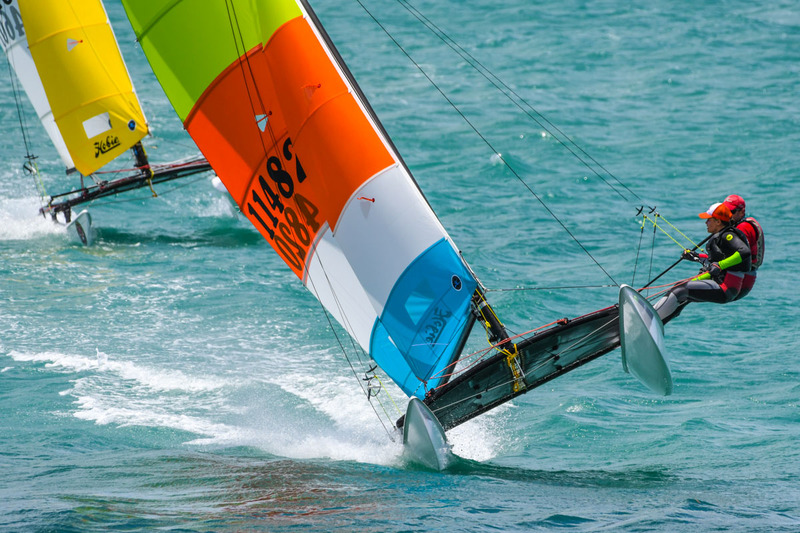 A still very credible 8th place which is now their discarded race. 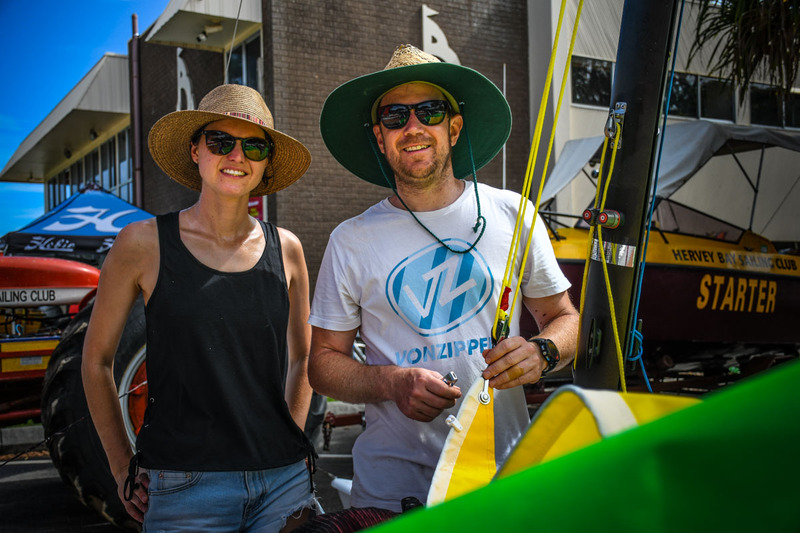 The second race of the day didn’t go well for the overnight leaders Darren Smith and Josie Mark who were over the start line early. 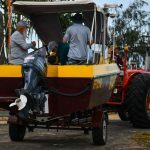 This has given them the maximum penalties points. 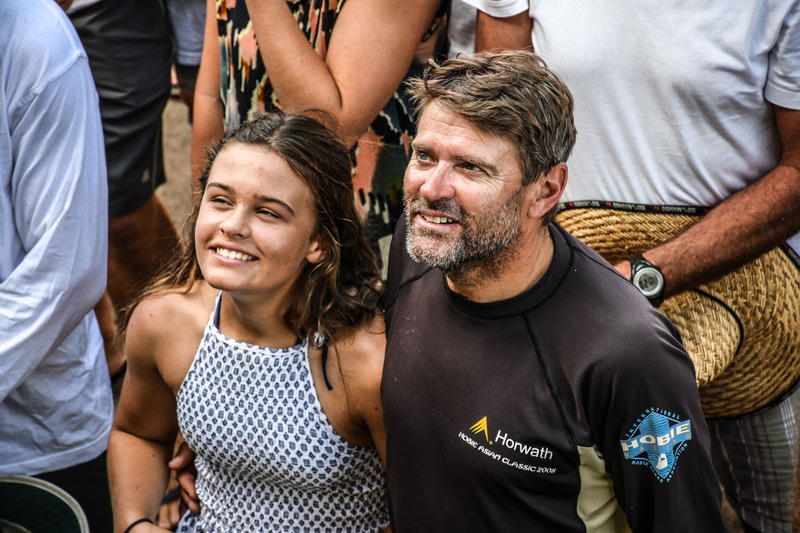 The new leaders Cam Owen and Suzzie Ghent won the race. 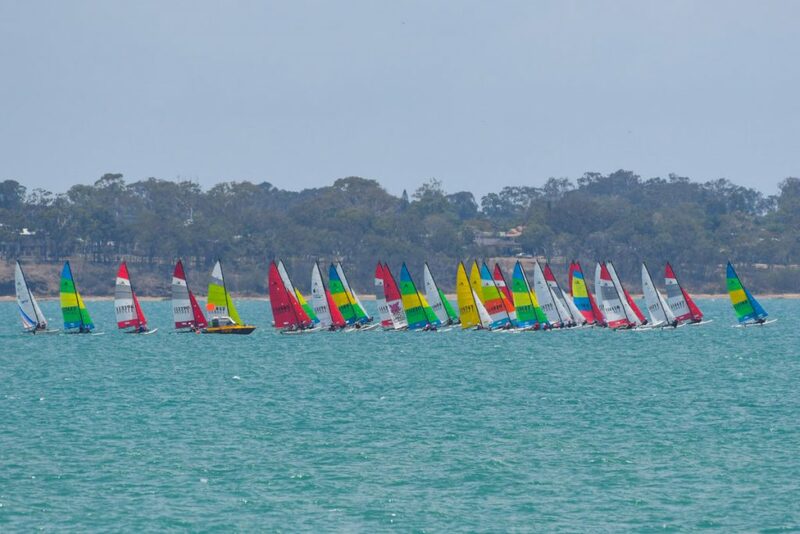 Half way through the race the wind kept increasing to 20+ knots with some bigger gusts coming through the racecourse. 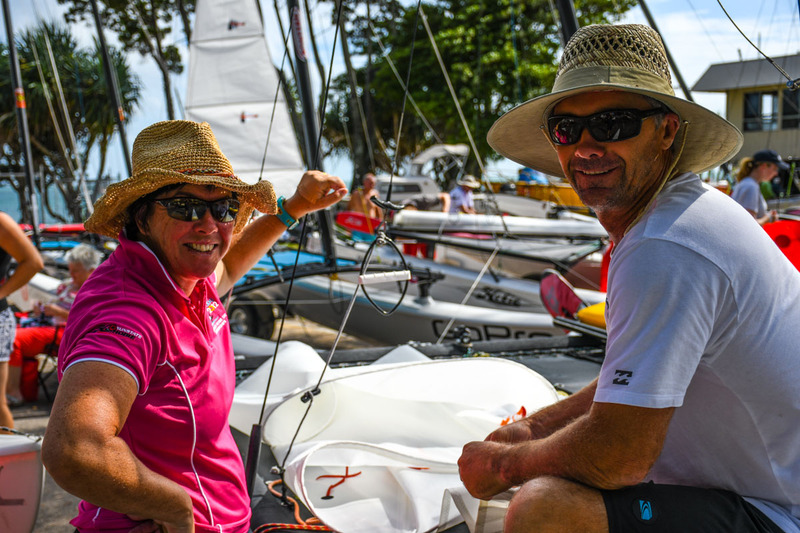 Husband and wife team Peter and Juliette Bates sailed the most consistently with a 4th and 2nd place result. 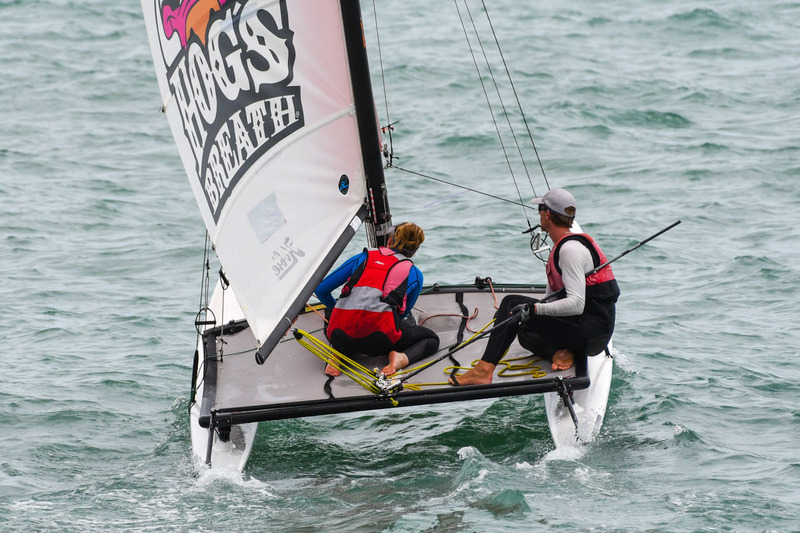 This moves them into third place overall. 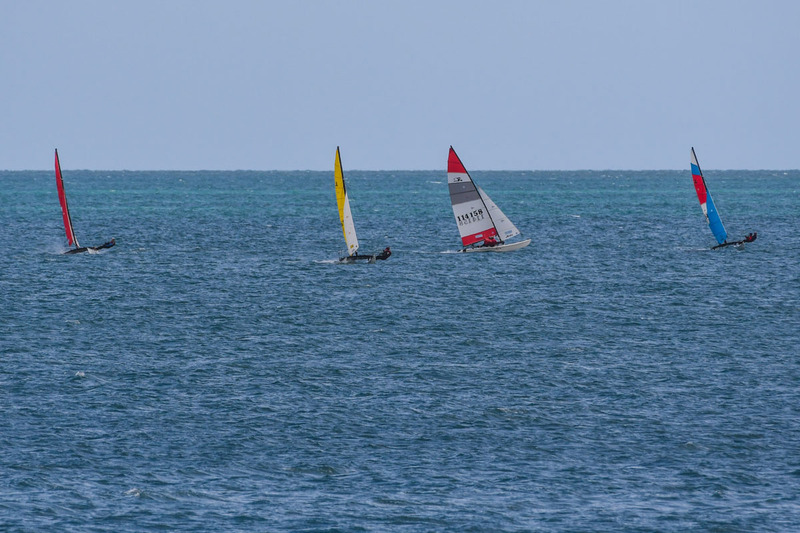 The race committee sent the sailors back to shore for lunch. 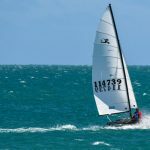 During the lunch break the wind kept increasing. 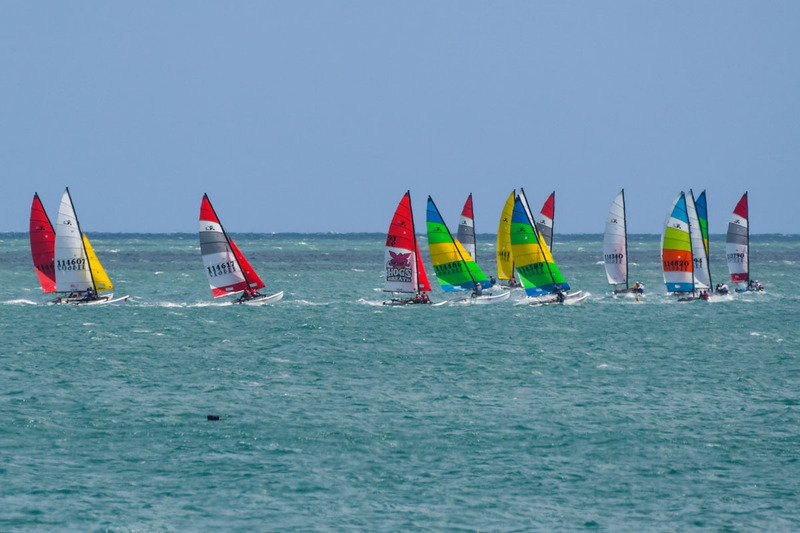 The race committee called the racing over for the day much to the relief of the sailors. 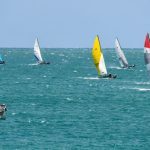 The breeze had increased to 30 knots and was not going to ease in the afternoon. 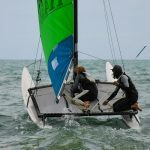 Tomorrow is the final day of sailing. 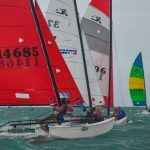 If the weather forecast is correct the wind should ease by race time. 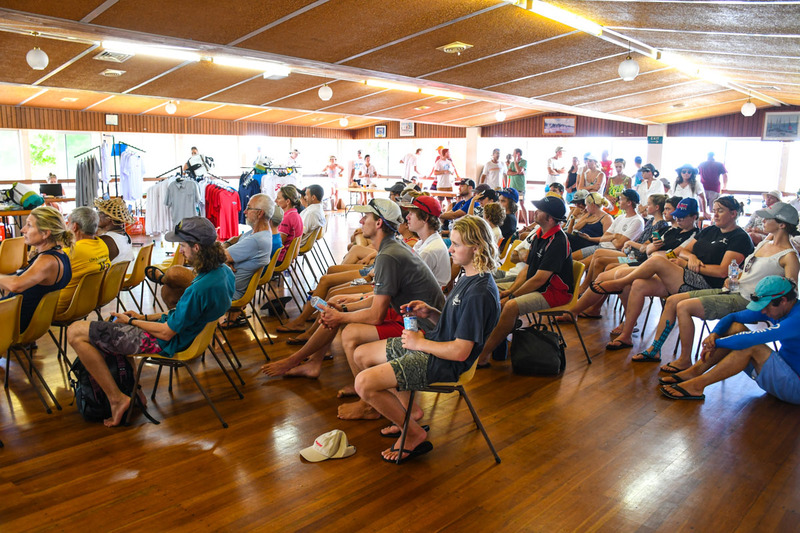 The race committee have 4 races planned and with that many races the leader board is quite open. 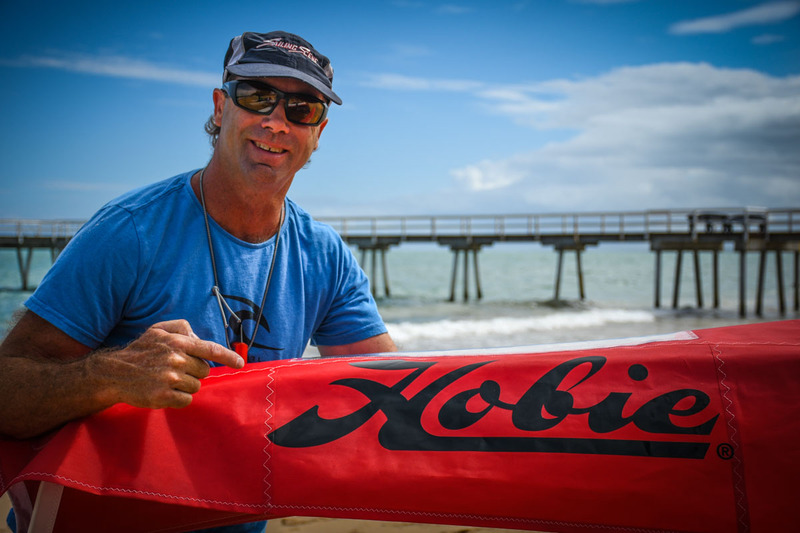 What a day to conclude a fabulous Hobie Championships. 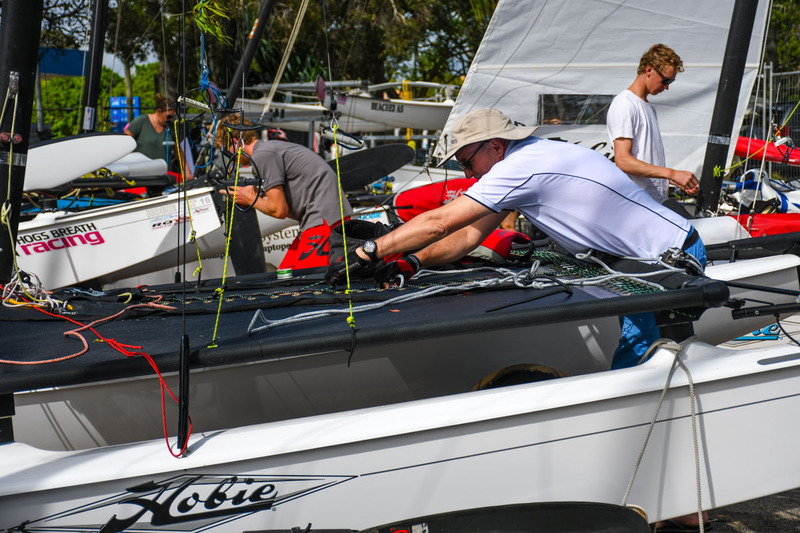 Four races were run in 10-15 knots of wind on relatively flat water. 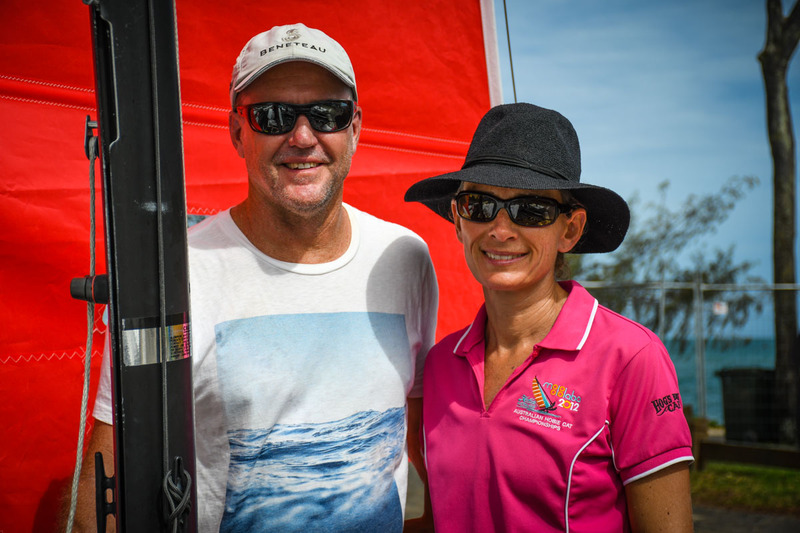 Unfortunately overnight 3rd palce holders Peter and Juliette Bates couldn’t get any consistency in todays racing. 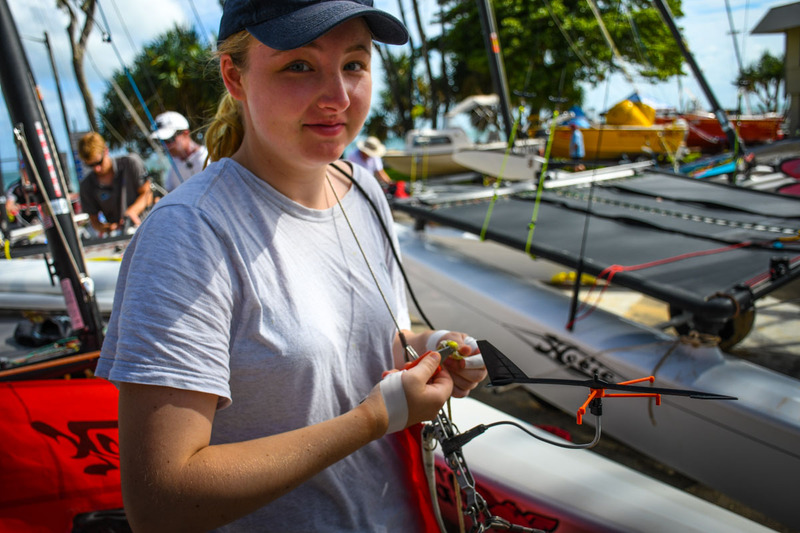 Juliette said ‘we won 3 out of the 4 starts today but it didn’t help. 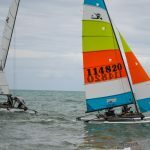 We went what we thought and felt was the right way but everything just seemed to go wrong and then we lost confidence in our decision making’. 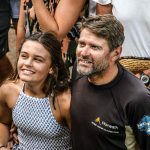 Another husband and wife team, Fletcher and Georgia Warren-Myers moved into third over all. 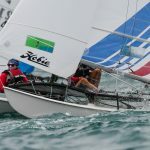 Today they sailed very consistently with Georgia saying she was calling the lay lines and letting Fletcher just concentrate on getting the boat to go fast through the water. 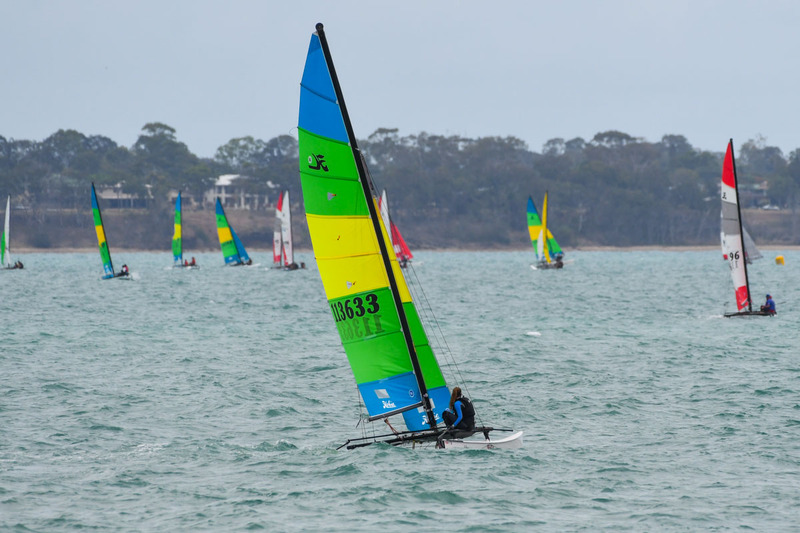 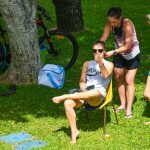 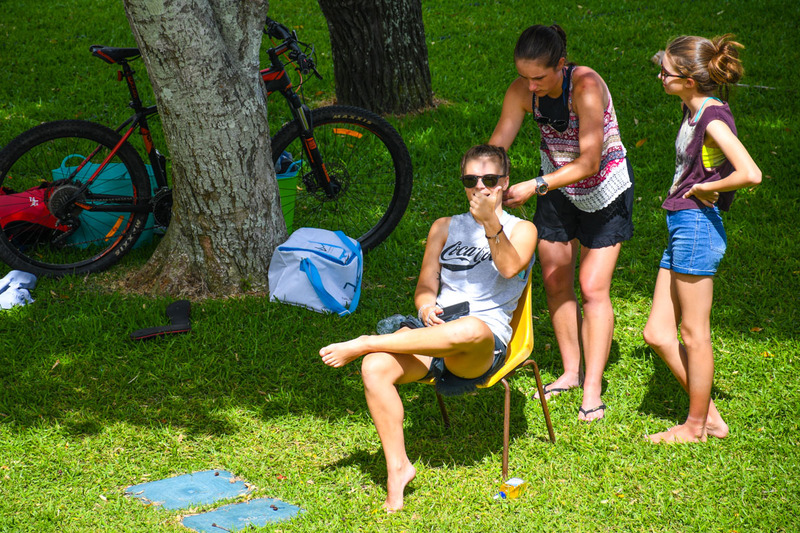 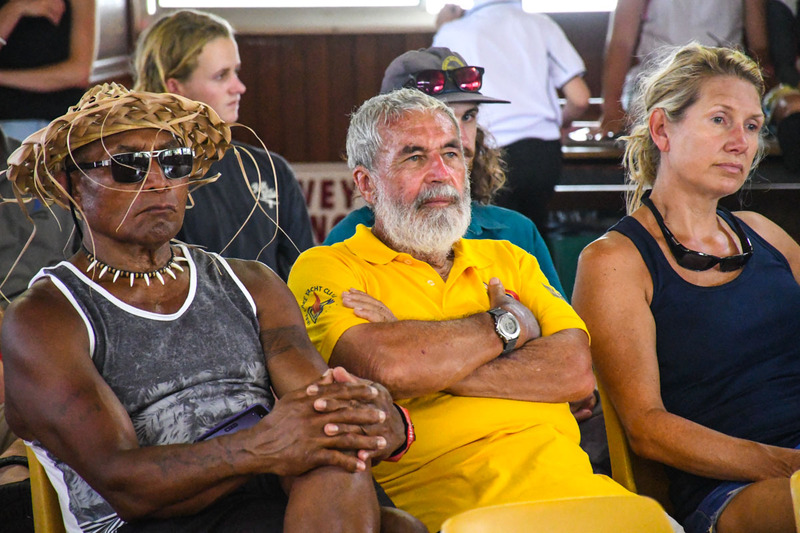 The next Australian Championships will be over the Christmas New Year period in Somers. 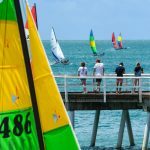 Somers is a small town approximately 72 km south-east of Melbourne, Victoria, in the south-eastern corner of the Mornington Peninsula on Western Port.